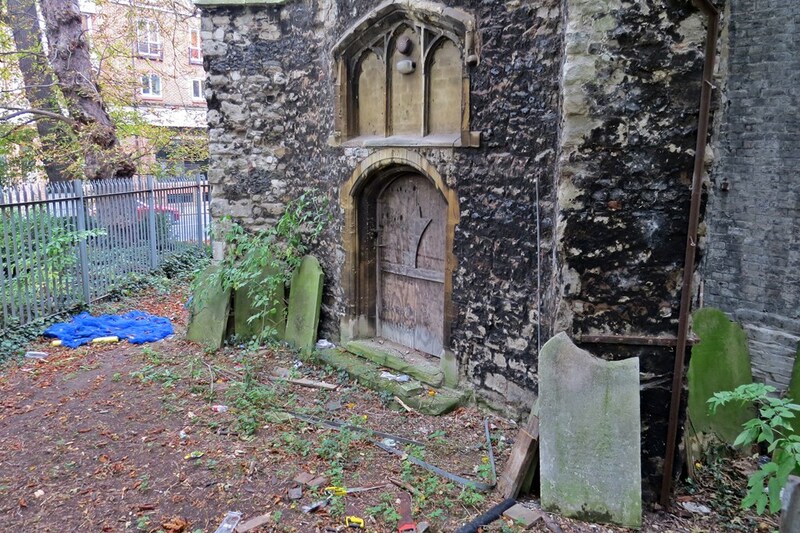 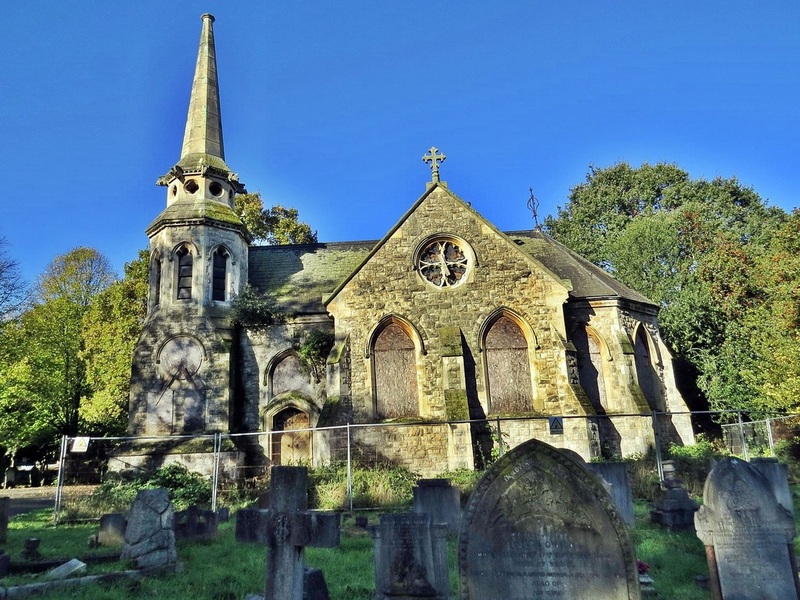 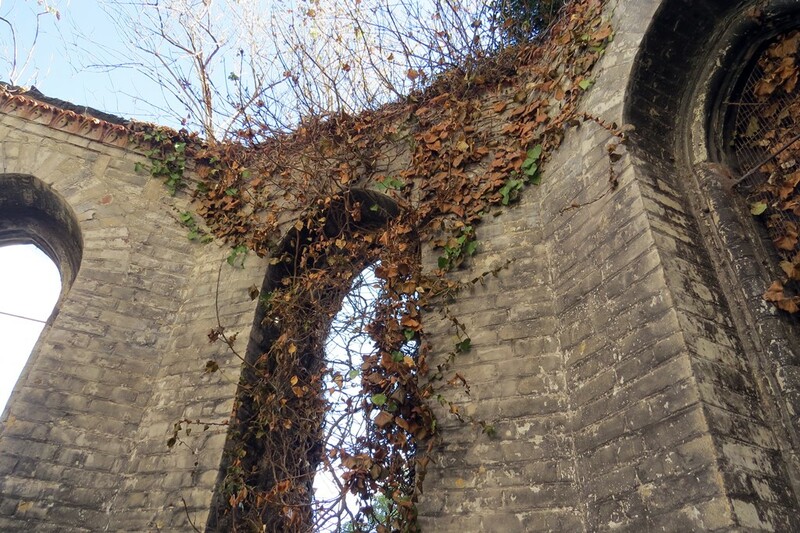 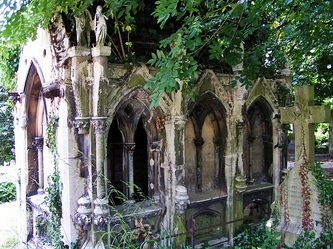 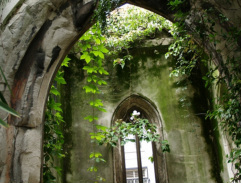 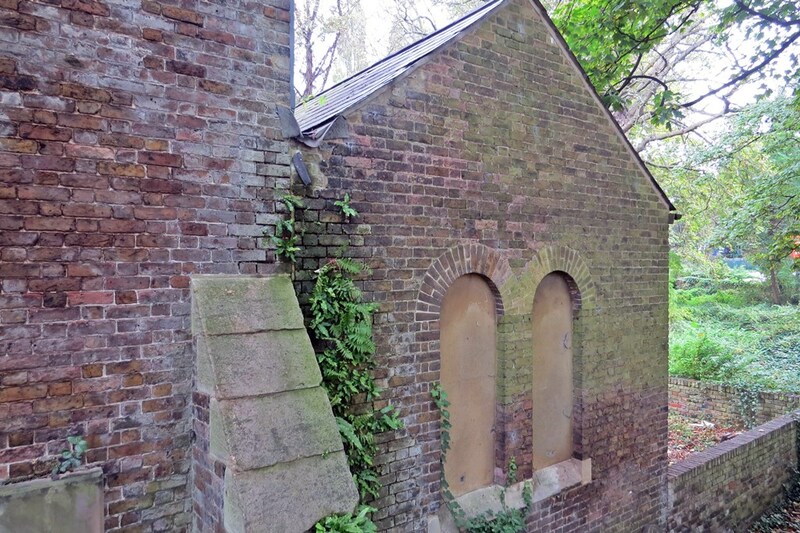 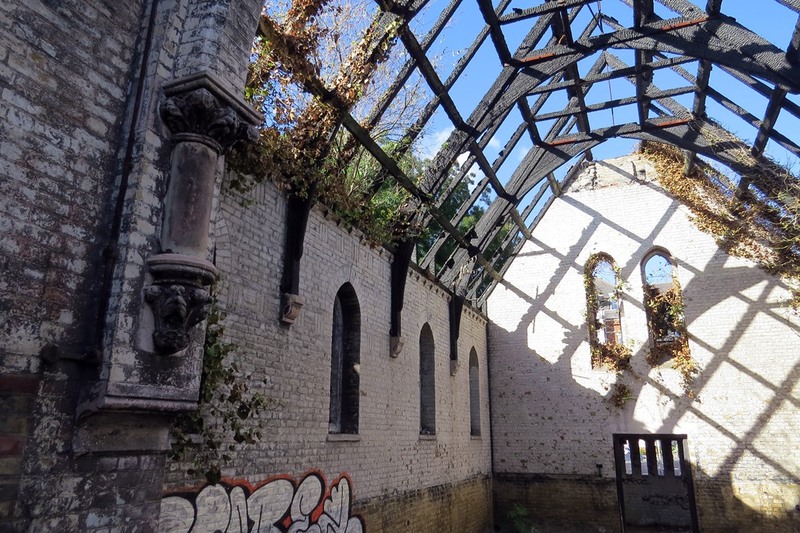 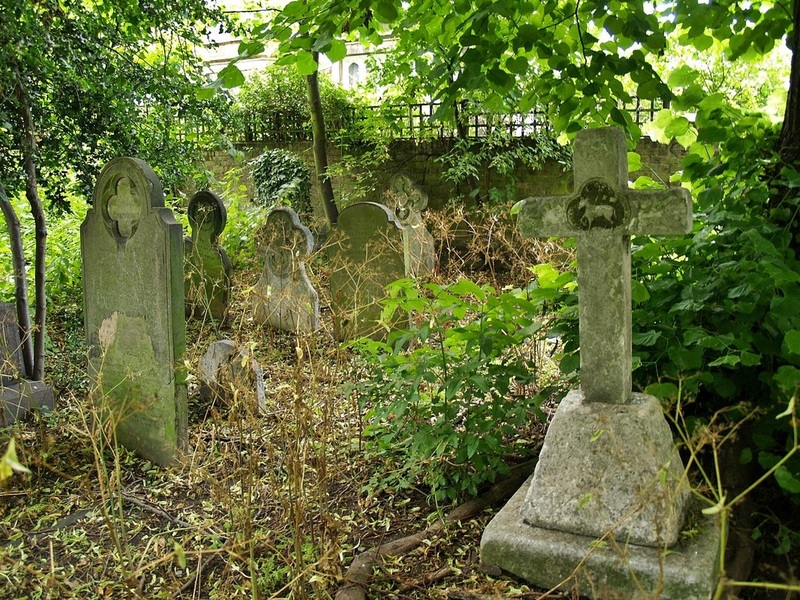 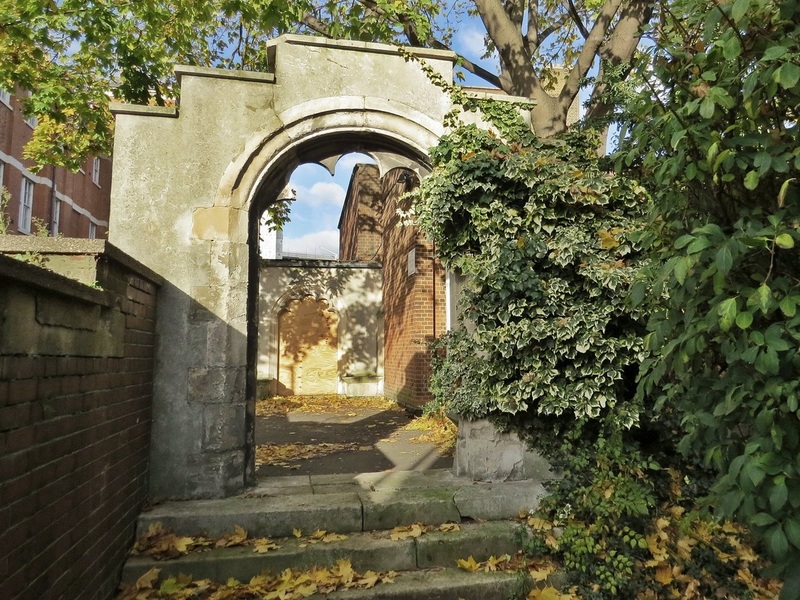 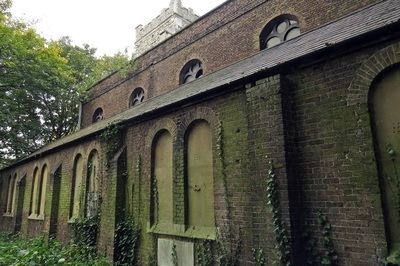 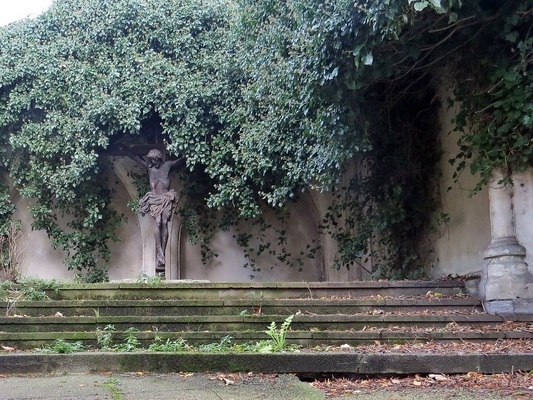 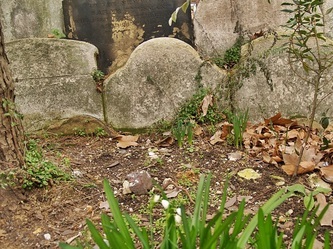 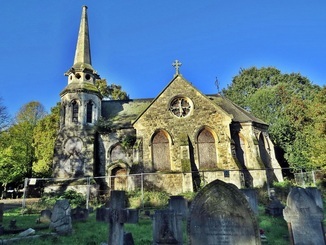 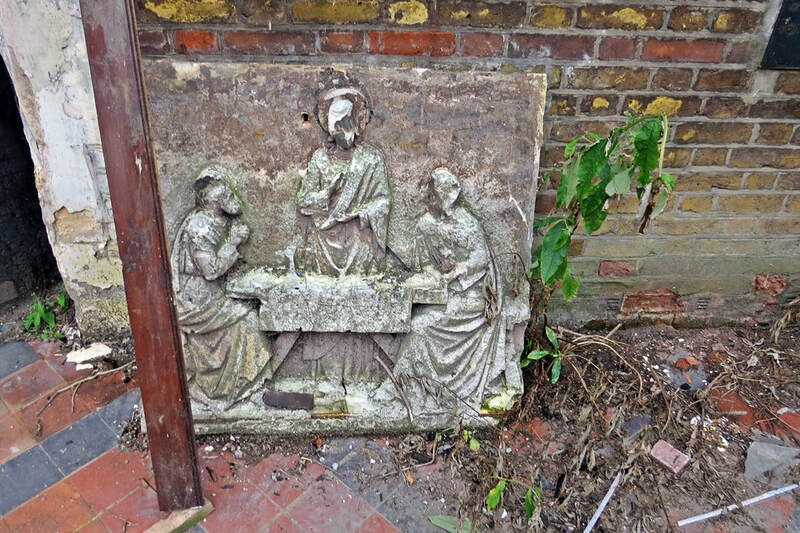 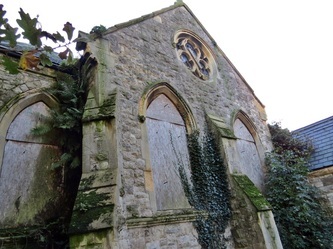 There are many derelict chapels in London's cemeteries and many cemeteries themselves have overgrown derelict parts within though it is rare to find a whole derelict cemetery. 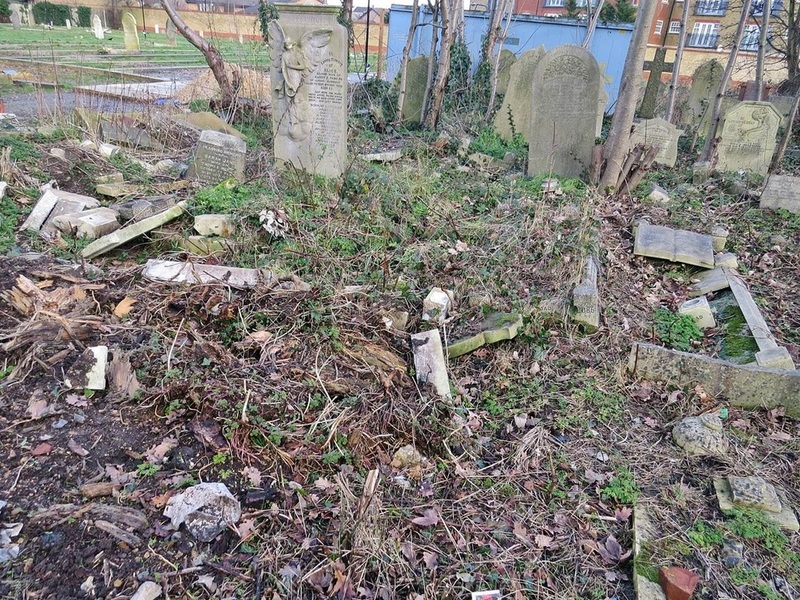 Old Barnes is the only cemetery that falls into the completely derelict category and while others such Brady St & West Ham are disused & walled off they are still at least partially maintained. 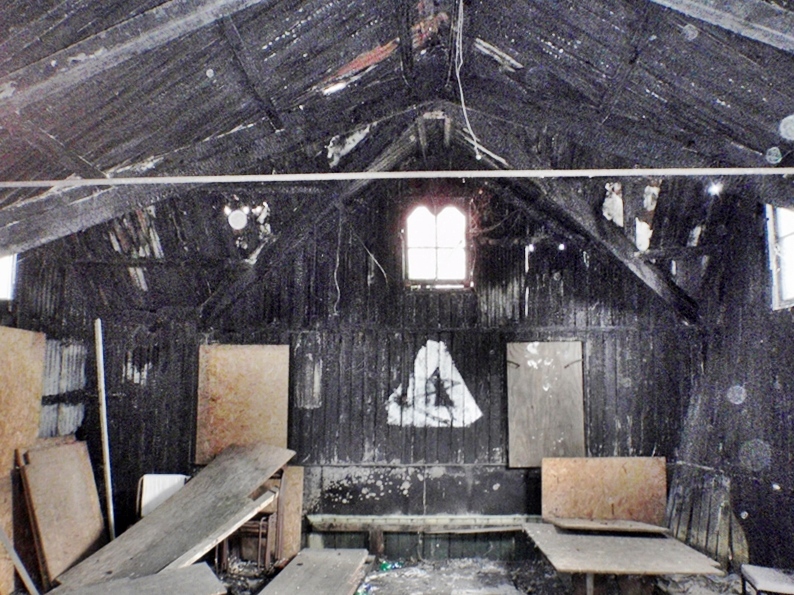 ​This former scout hall and later church was also a factory many years ago. 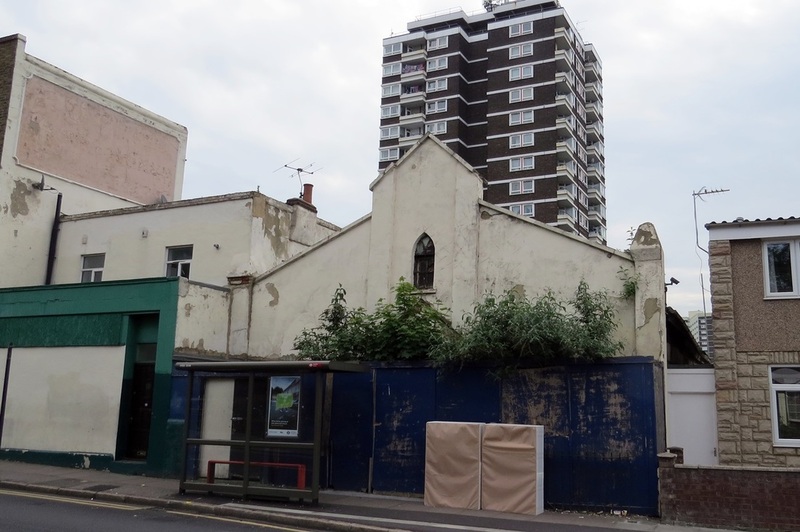 Proposals are for demolition of the existing building and for a residential development (6 to 14 flats, 3 or 4 storeys high) with social/community use on the ground floor. The Workhouse was first built in 1729 to house those who were either unable to work through age or disability or unable to find work.New and extended facilities were built in 1836. 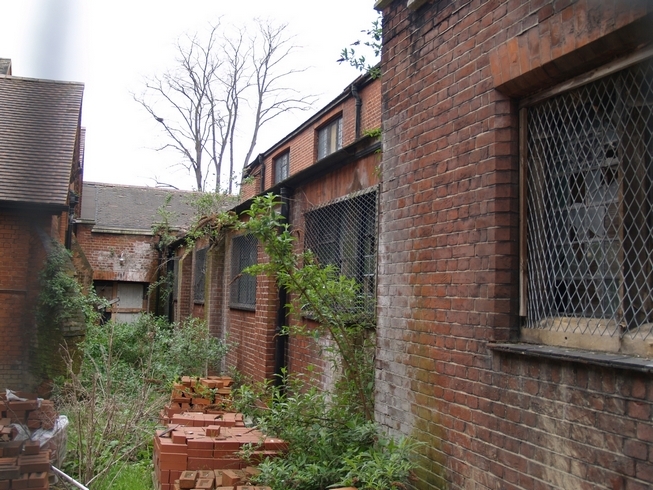 Many of the functions of the workhouse developed into a hospital and the workhouse ceased to exist in 1929. 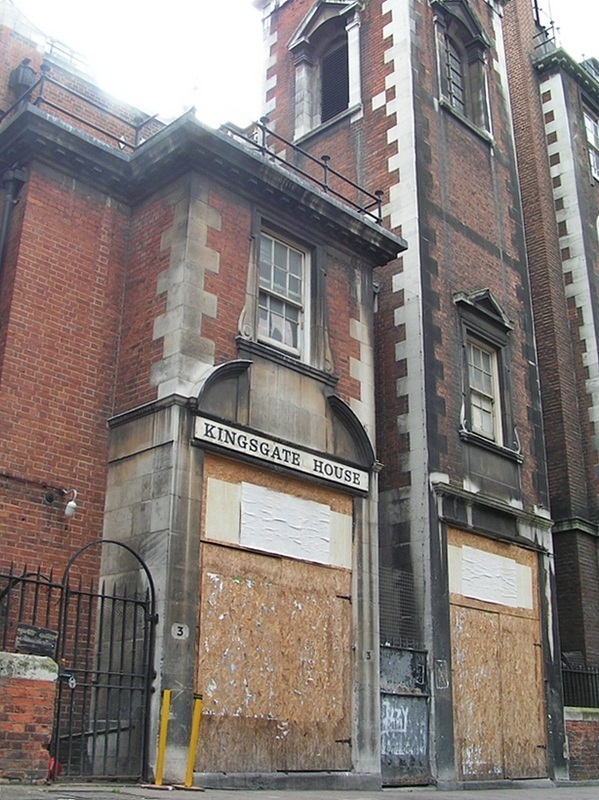 It was then known as King Edward Avenue Hospital and later West Hill Hospital. 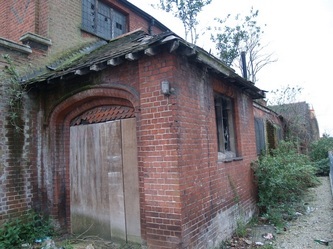 The hospital closed in 1997 and the hospital buildings demolished but the 1836 workhouse buildings have been retained and used as offices. 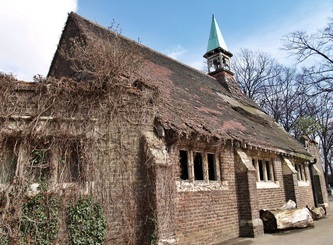 The chapel opened in 1878 superseded one previously accommodated in the main workhouse. The west wall of the chapel once housed two stained-glass windows designed and manufactured by Charles Eamer Kempe, which were donated by nearby Holy Trinity Church. 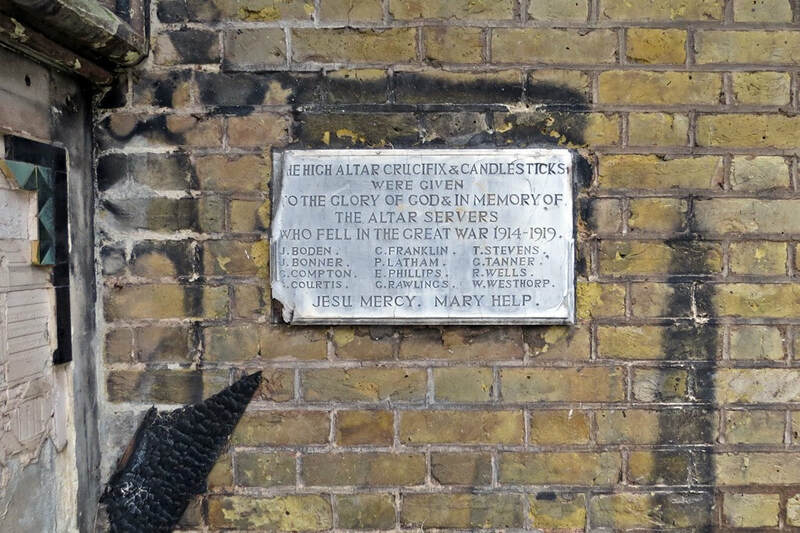 ‘St Michael’ was destroyed in 1940, when a bomb fell on the adjacent hospital, destroying a ward, and killing 22 patients and two nurses. 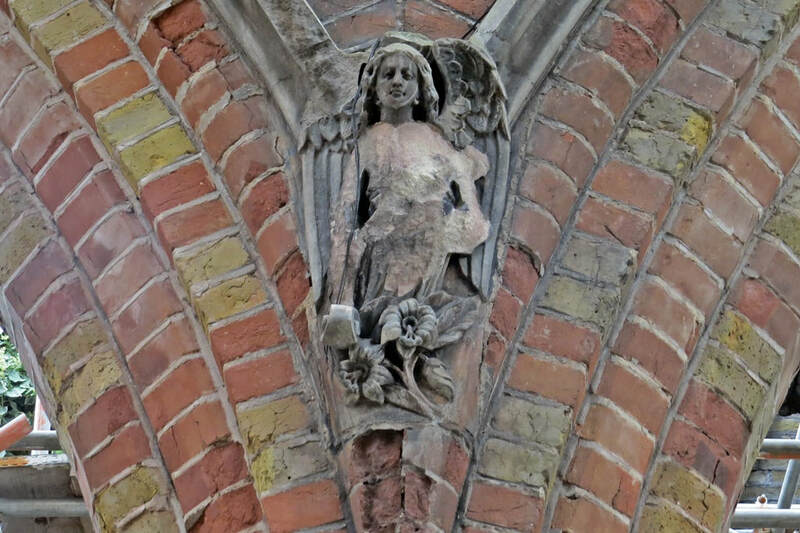 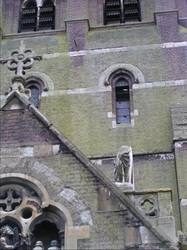 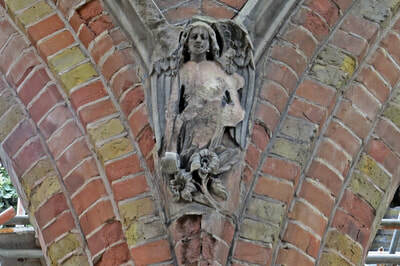 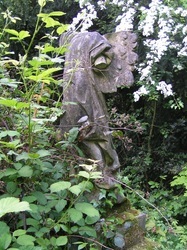 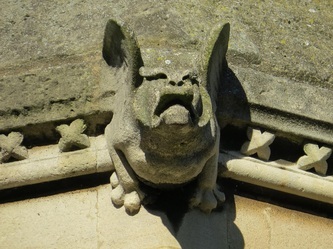 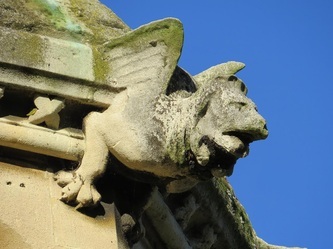 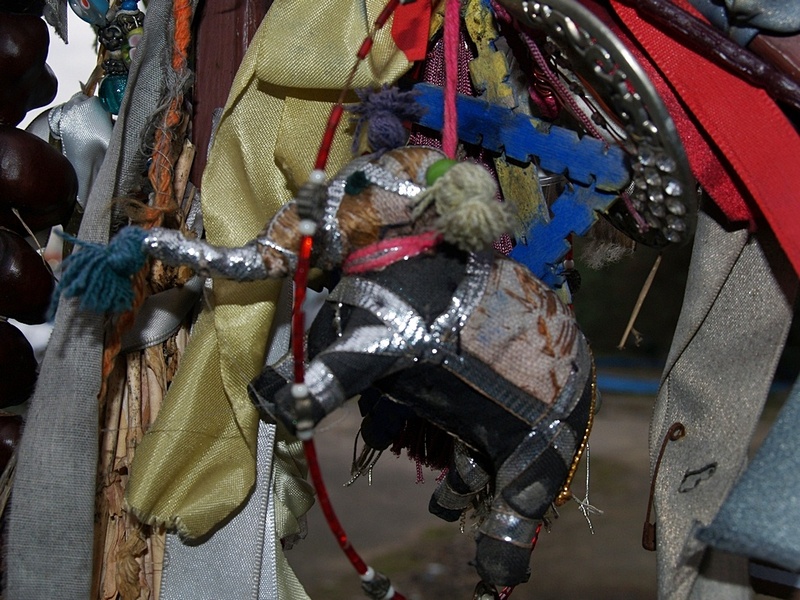 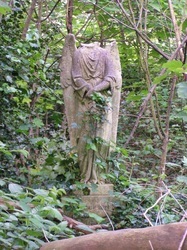 ‘St Gabriel’ was removed upon the closure of the chapel in 1998, and today resides two miles away in Darent Valley Hospital. 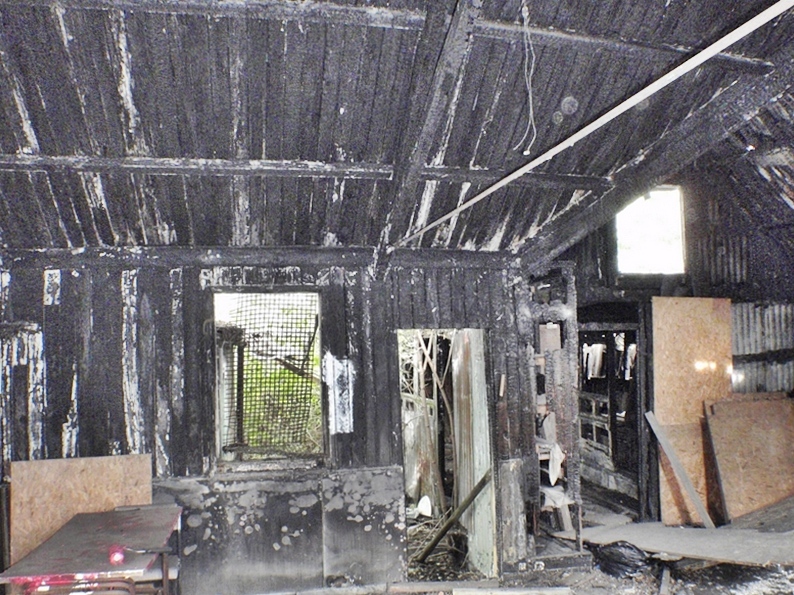 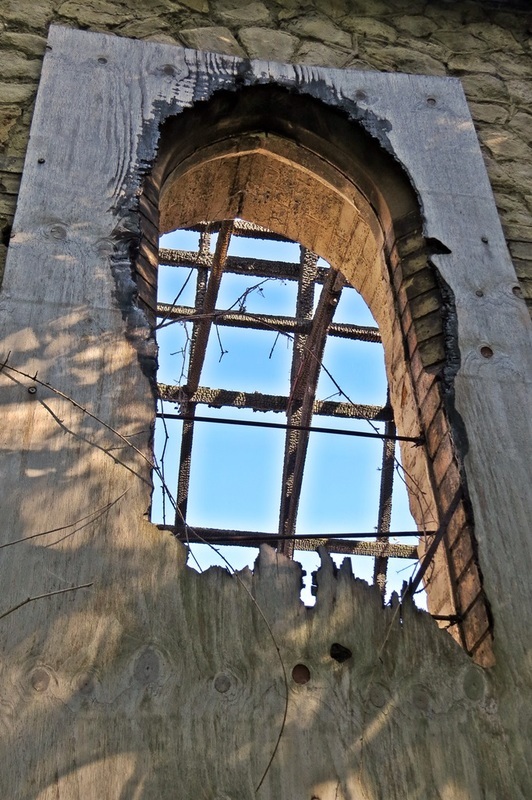 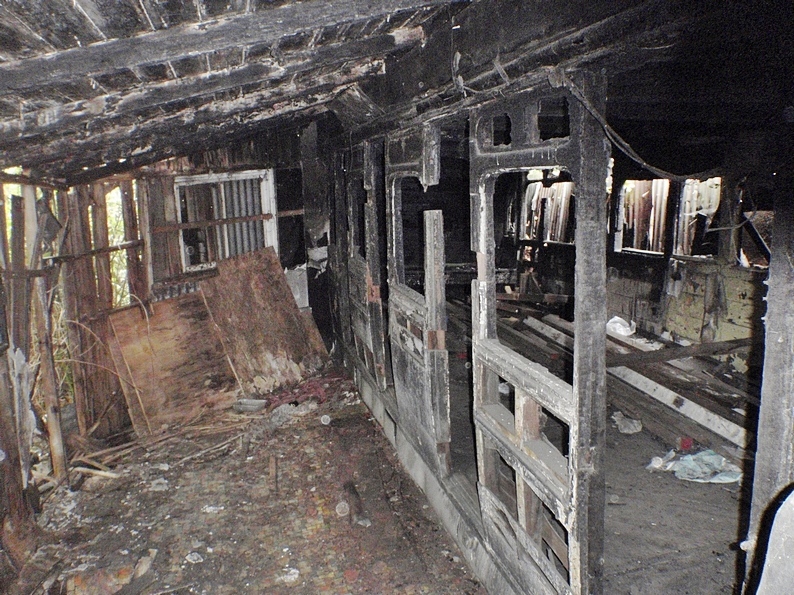 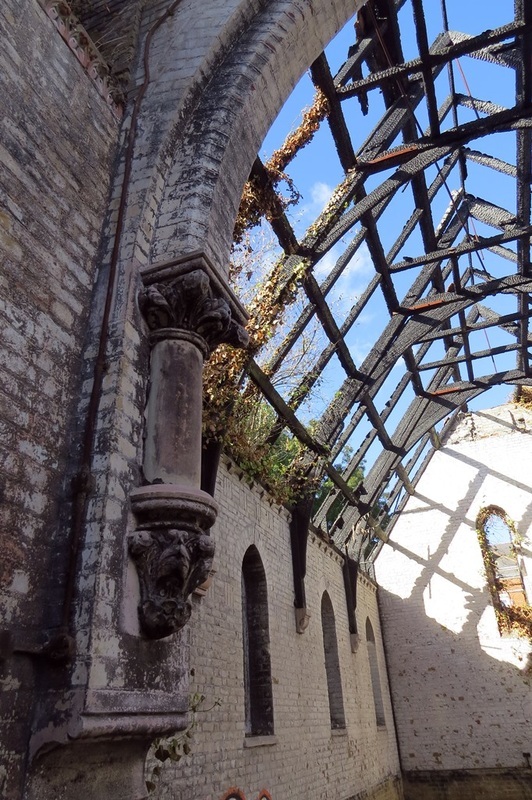 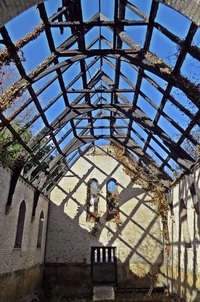 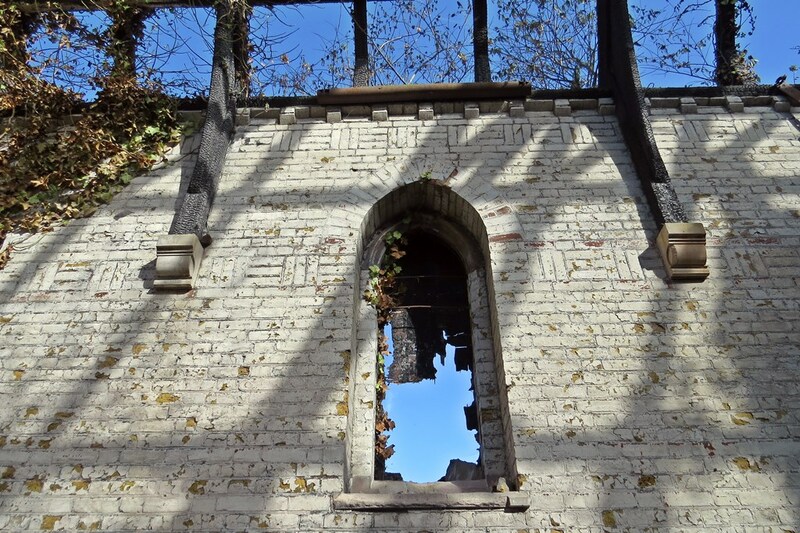 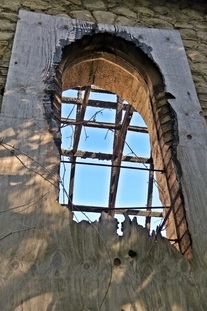 Several years ago, the derelict chapel was gutted by fire, leaving the internal structure exposed to the elements. 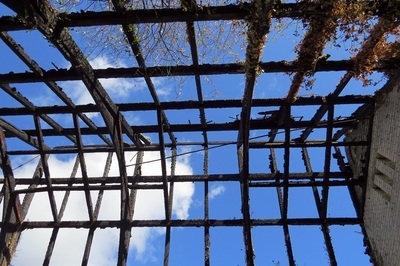 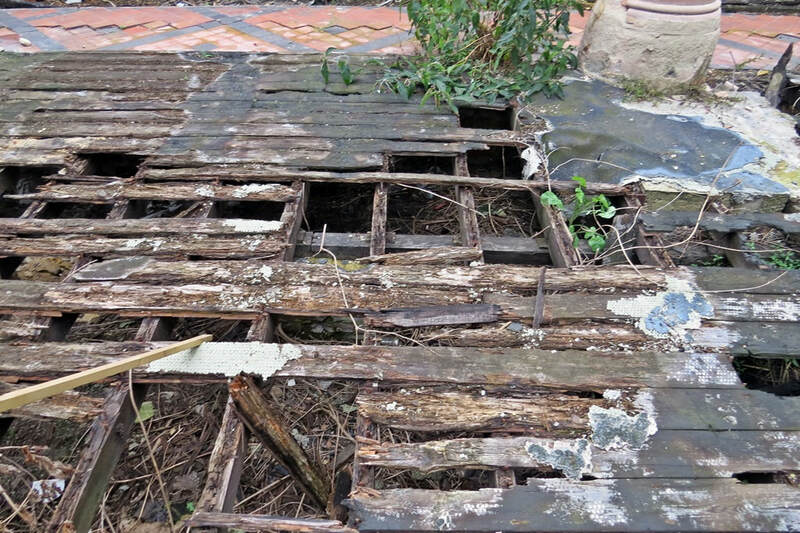 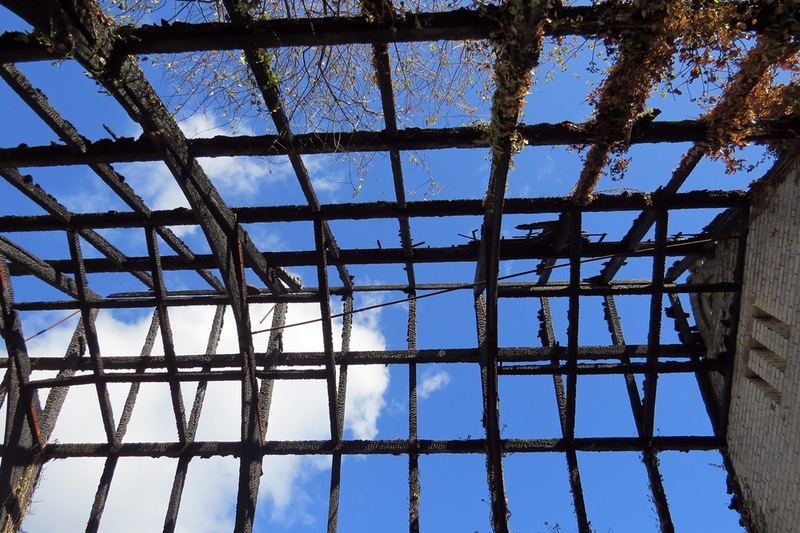 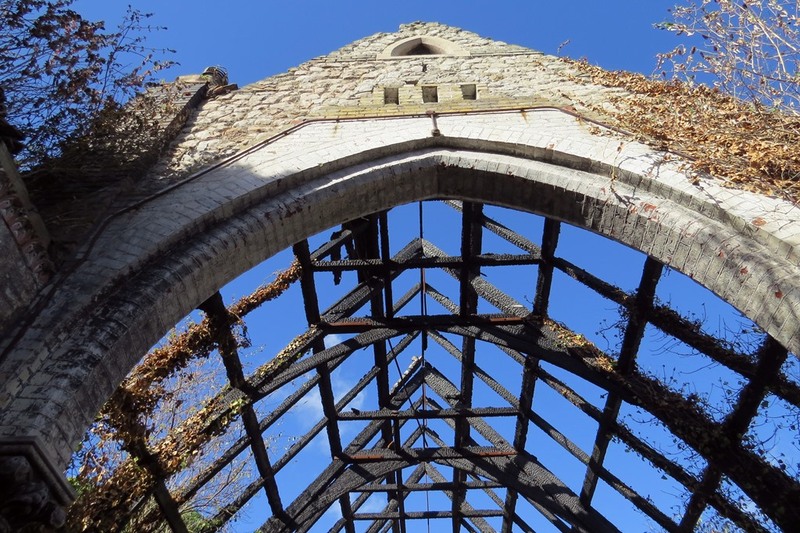 Subsequent years of vandalism and weather damage have left very little of the original structure to be salvaged. A proposal by developers explores an alternative to refurbishing the building, in favour of demolishing it and rebuilding the Chapel on a like for like basis with the original exterior of the building will be replicated & divided into two 2 storey residential units. 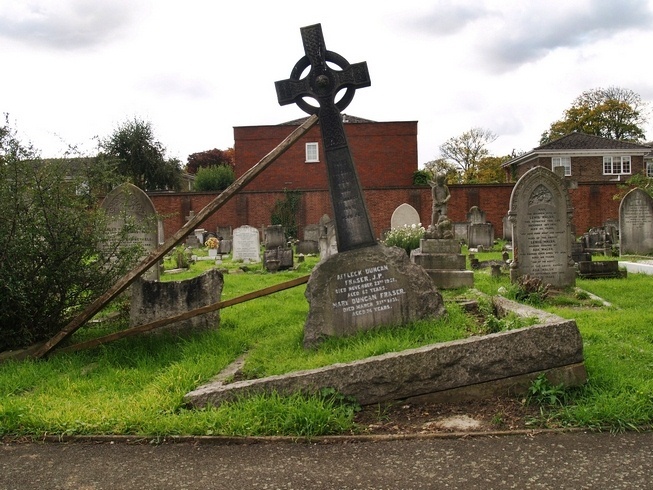 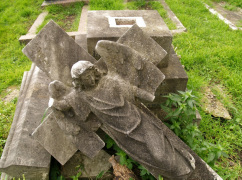 East Ham Cemetery, E6 - Wartime damage? 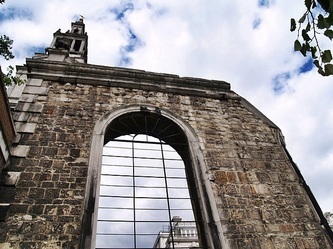 This building, a long term fixture on this website, in the grounds of Nicholas Hawksmoor's St George in the East Church, was originally built and used as a mortuary and its dubious claim to fame is that the body of Jack the Ripper victim Elizabeth Stride was brought here. 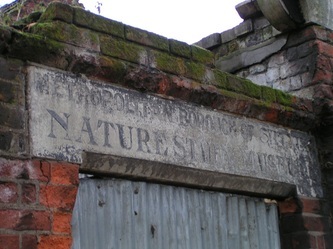 The building was then turned into a Nature Study Museum in 1904 until closing during the Second World War and never to reopen. This tiny building was possibly the smallest museum building in London though many of the exhibits were in its own garden fenced within the grounds of the church. 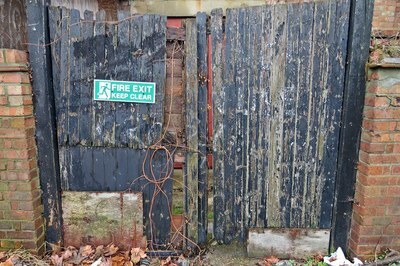 At times it attracted up 1000 visitors a day. Despite surviving WW2 bombing the building is in a bad state of repair. 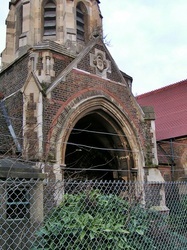 The adjacent church was badly bombed during the war and only the original shell survives. 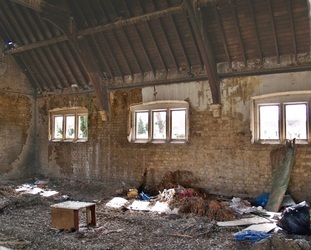 A new interior has since been added to the church. 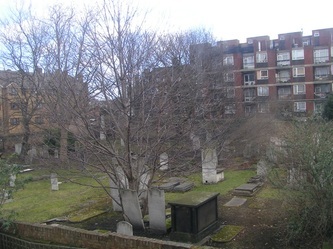 The churchyard was used for exterior shots of the church in The Long Good Friday a British gangster film starring Bob Hoskins and Helen Mirren (where Harold's mum goes to a service and when his Rolls Royce is blown up in the churchyard). 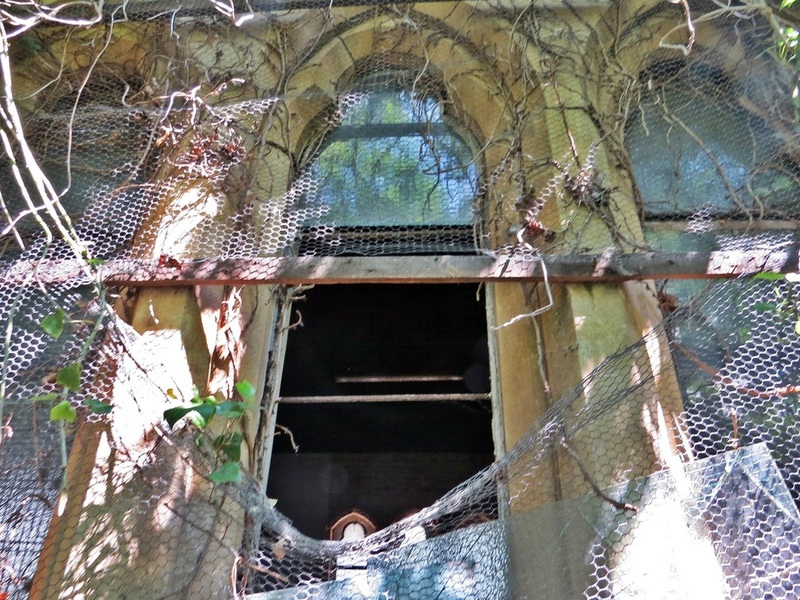 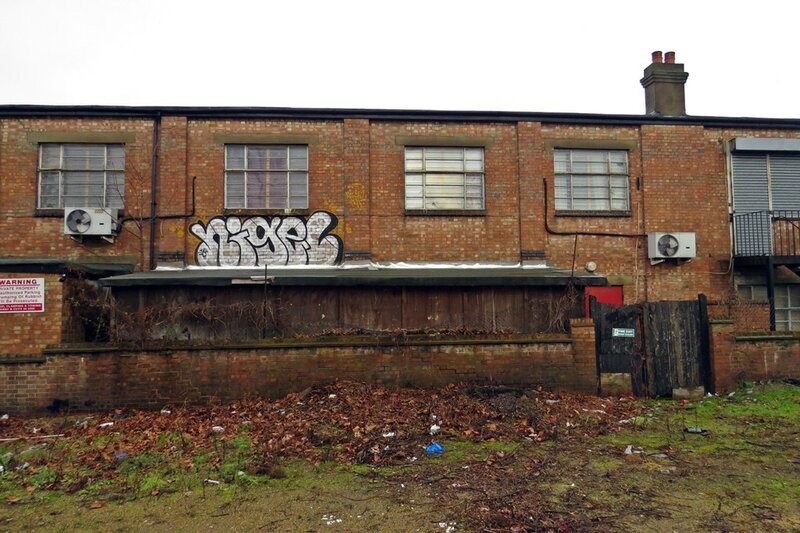 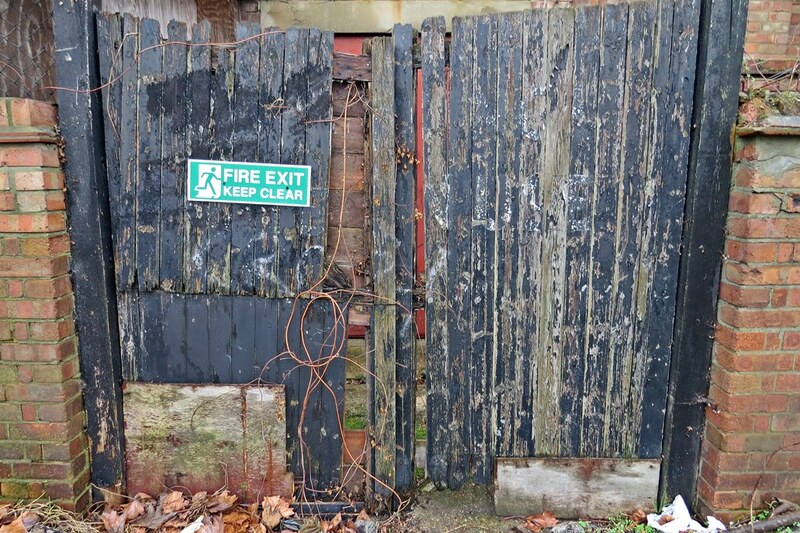 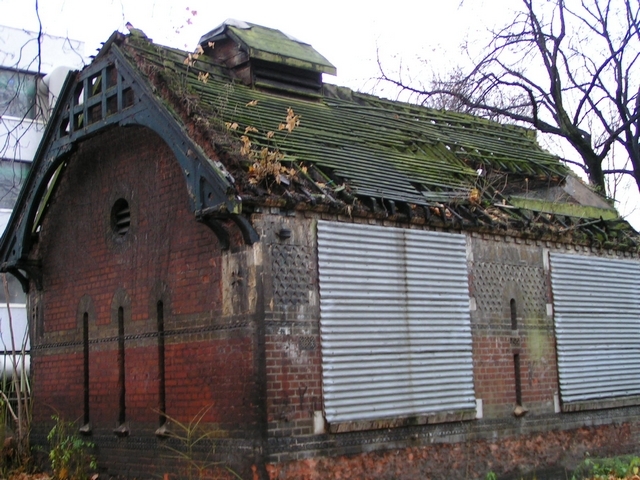 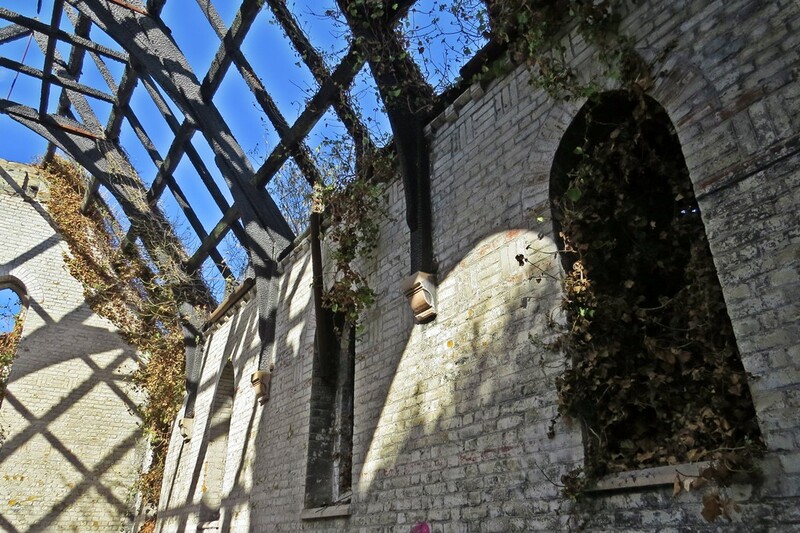 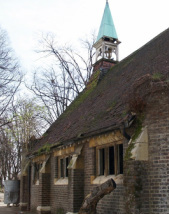 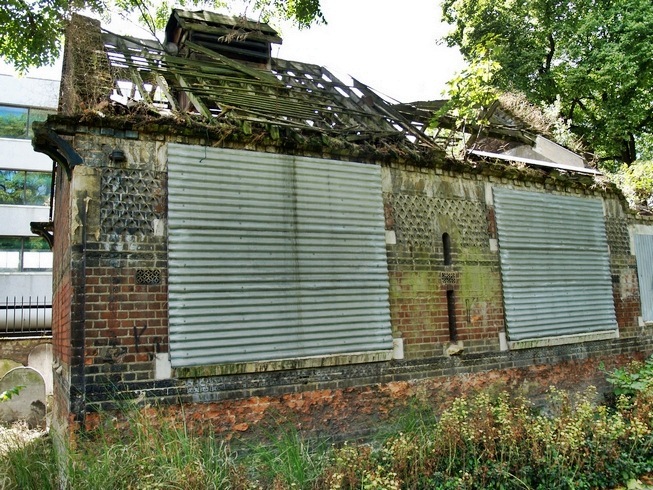 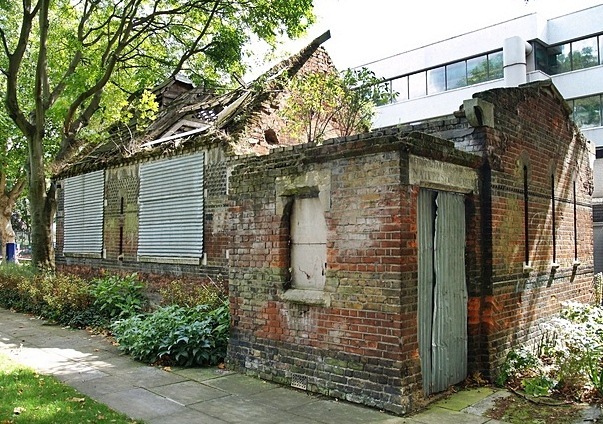 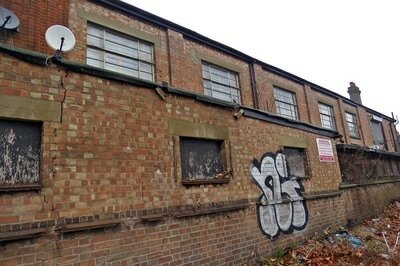 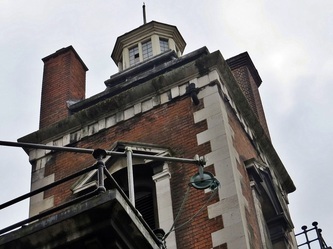 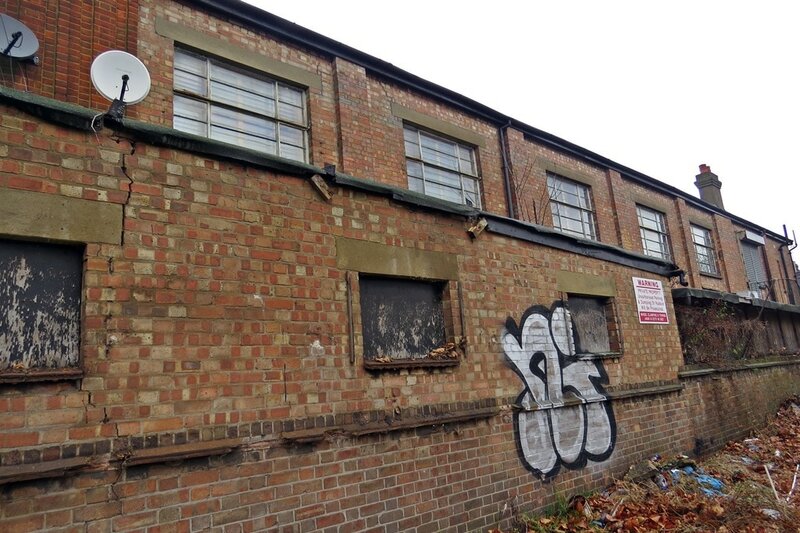 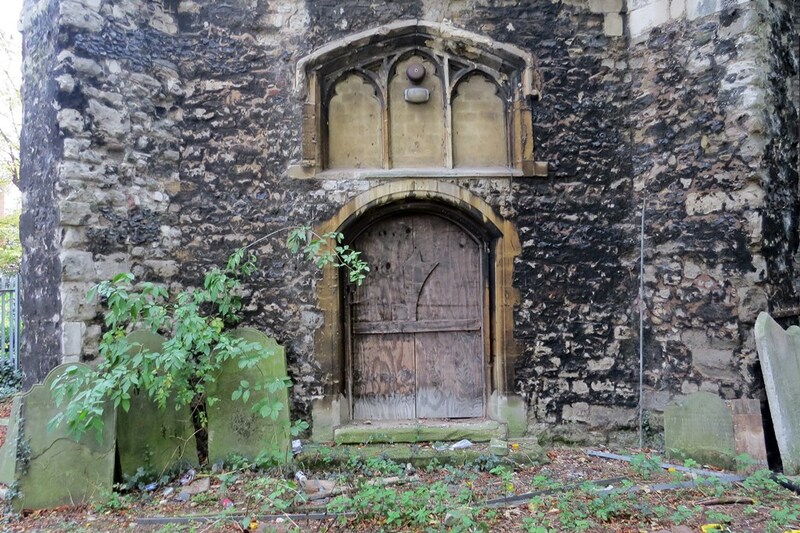 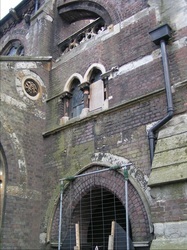 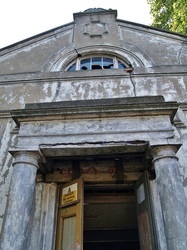 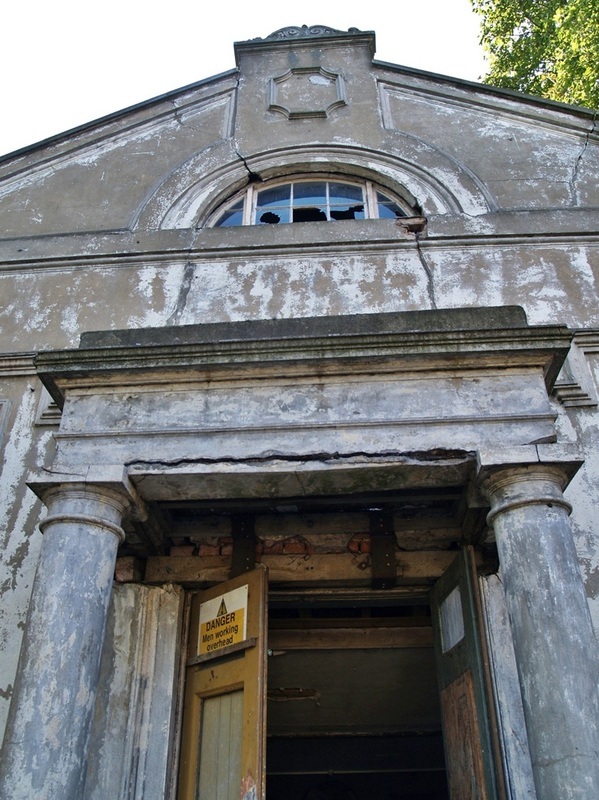 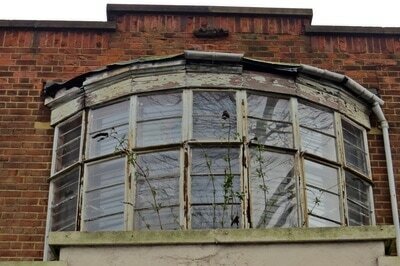 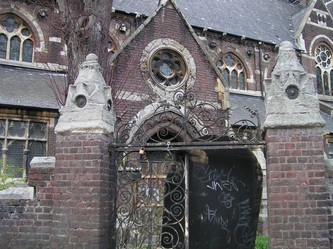 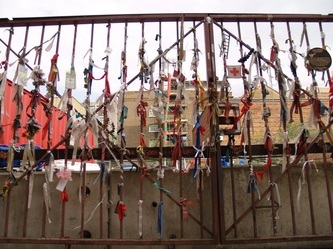 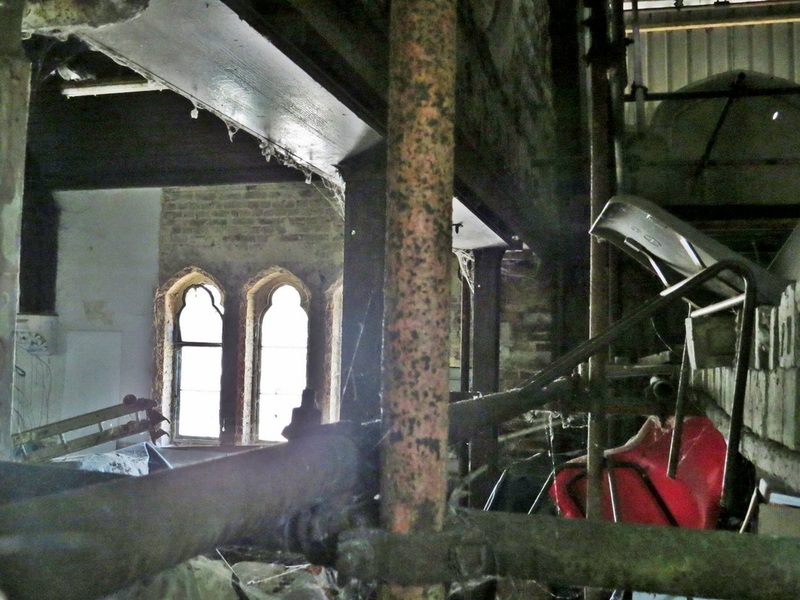 We cover this derelict mortuary/museum on my guided walking tours of the London Docks (Wapping). 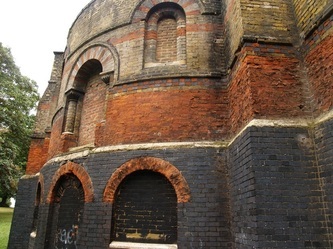 These exterior pics were taken a few years ago. 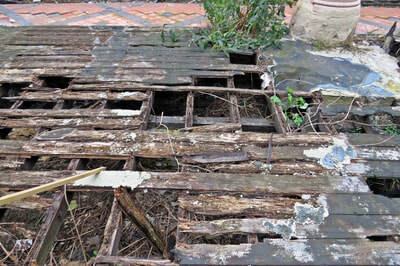 The condition gets worse every year. The rarely seen interior pics were taken in May 2016. 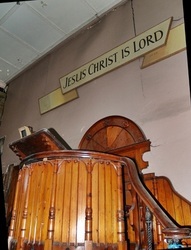 ​Used by the Salvation Army from 1875 to the 1960s. 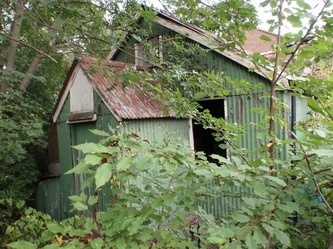 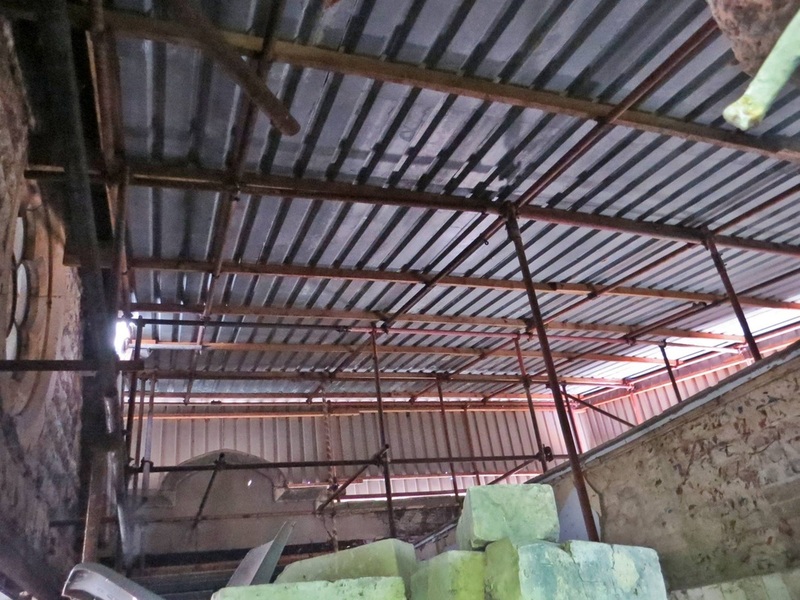 Until recently it has been used as a storage warehouse. 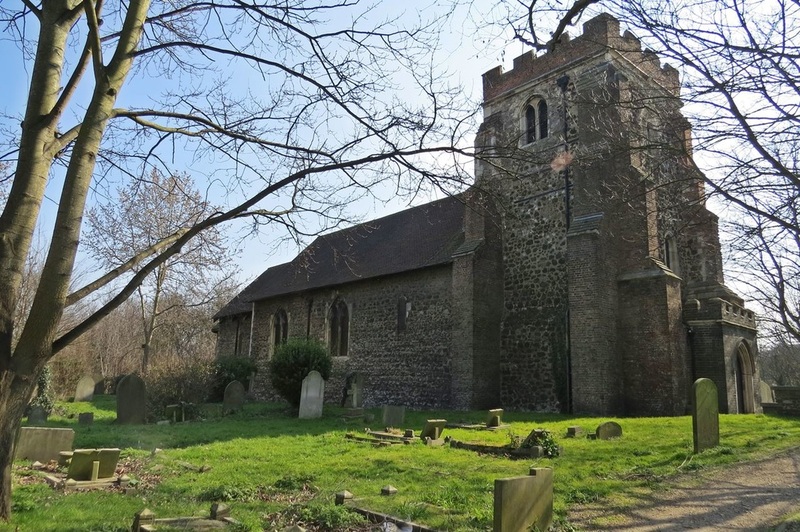 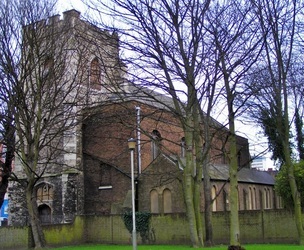 St Mary Magdalene Church built in the year 1137 is the oldest Norman church in London that is still in weekly use and has a 9½ acre churchyard (one of the largest in London) which is now managed as a nature reserve by the London Borough of Newham. 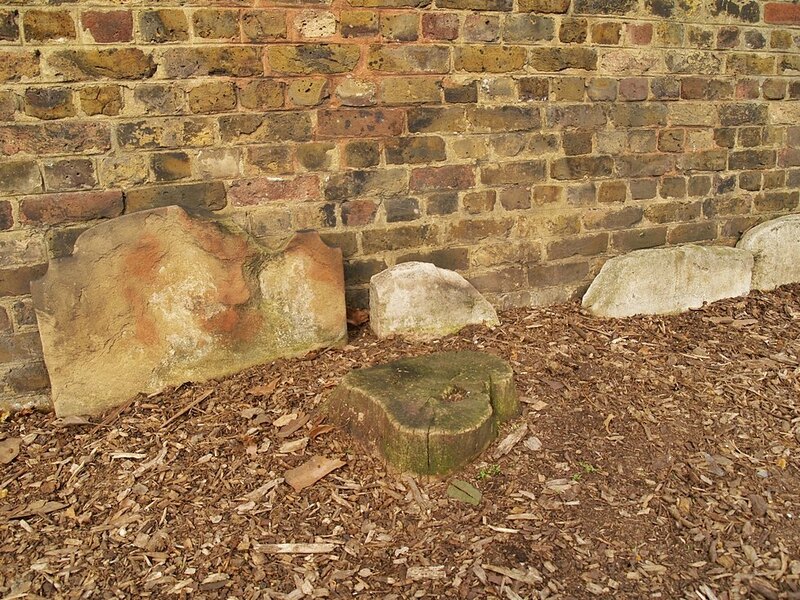 The Nature Reserve was formally opened by Queen Elizabeth II in 1983. 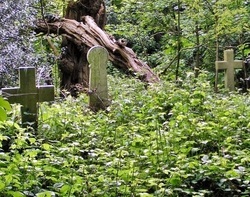 The churchyard was officially closed for burials in 1974 and became quite a wilderness before becoming a nature reserve. 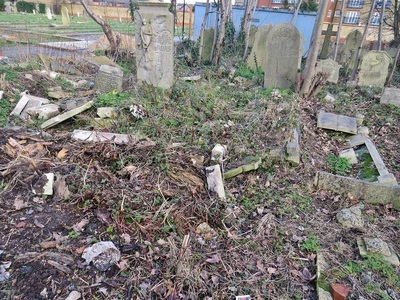 Indeed, these days much of the graveyard is still quite overgrown with volunteers always required to help manage the site. Many of the graves are subsiding probably due to the fact that this area was originally on the edge of marshland. consecrated in 1958. The remainder of the site was turned into this small garden. 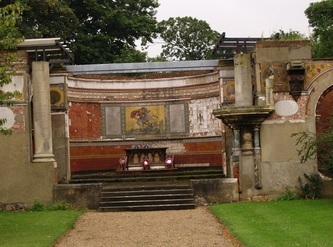 The crucifix at the end of the garden stands on what was once the altar of the original church. 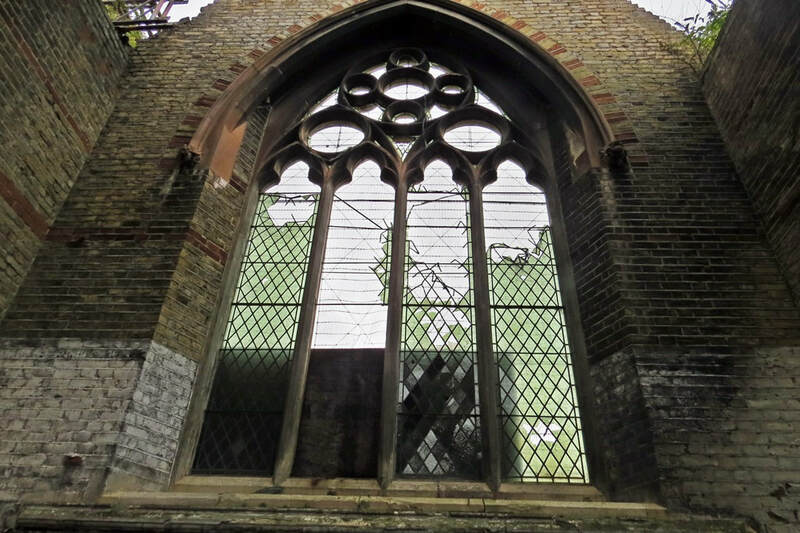 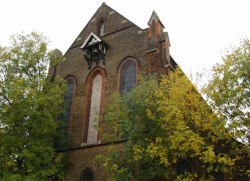 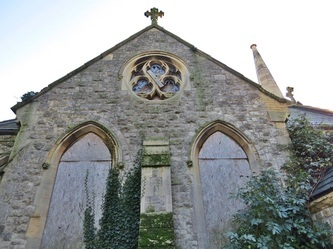 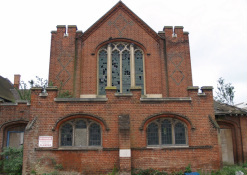 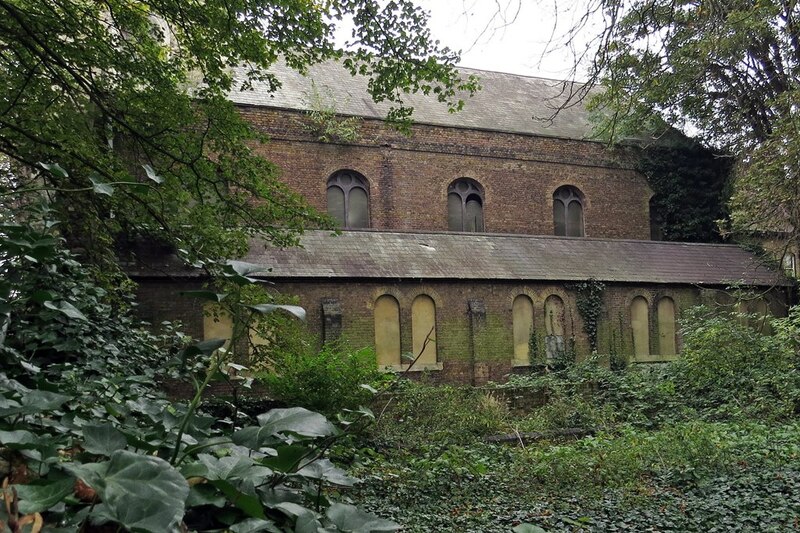 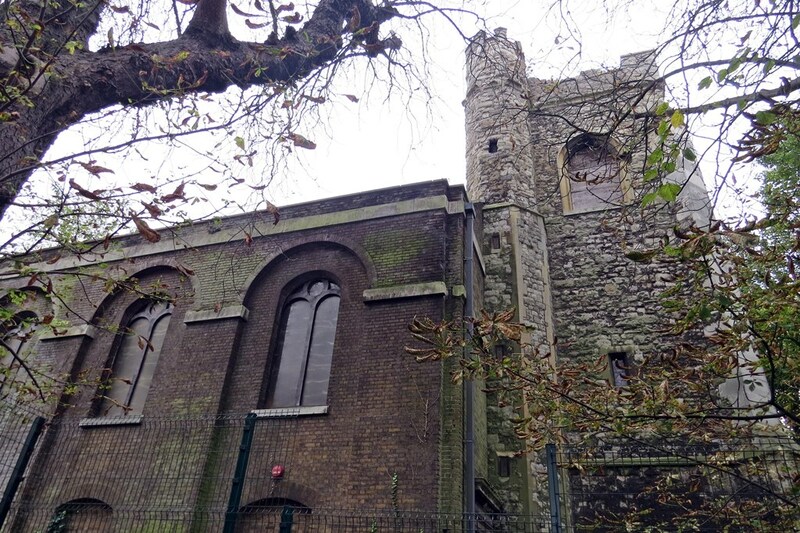 The smaller church closed in 1971 due to a dwindling congregation.In the early 1980s, All Hallows Church was converted into a recording studio - Blackwing Studios, where Depeche Mode recorded their debut album The studios closed in 2001 and the building has been empty ever since. 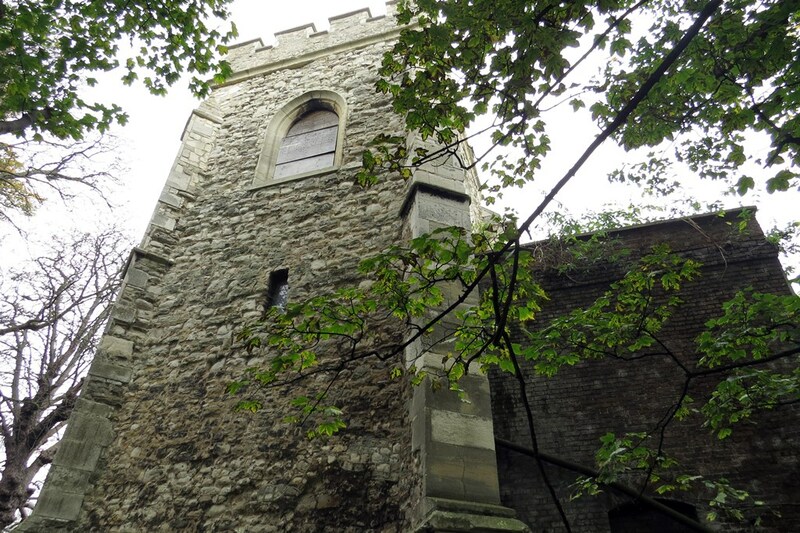 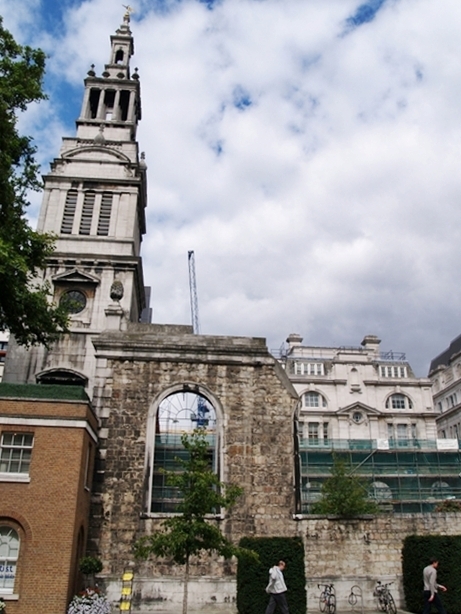 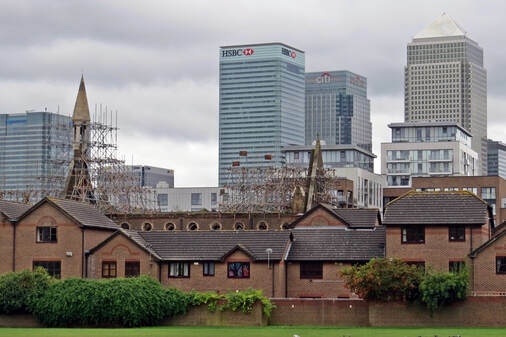 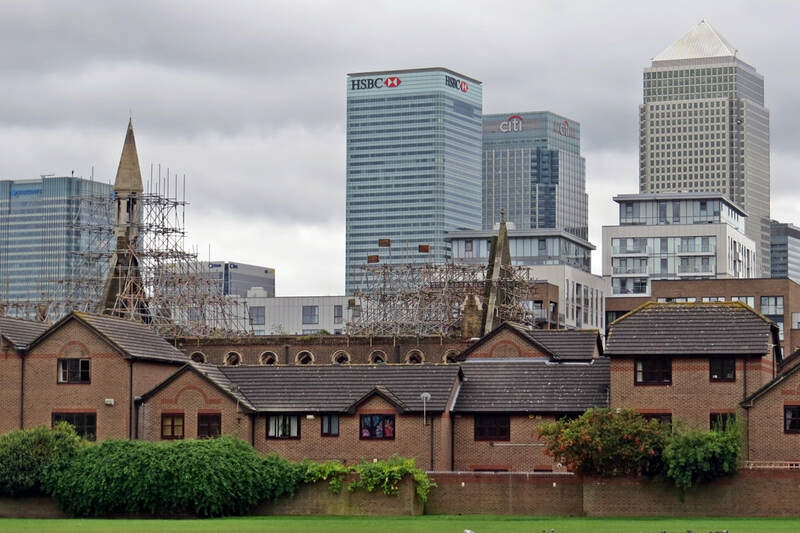 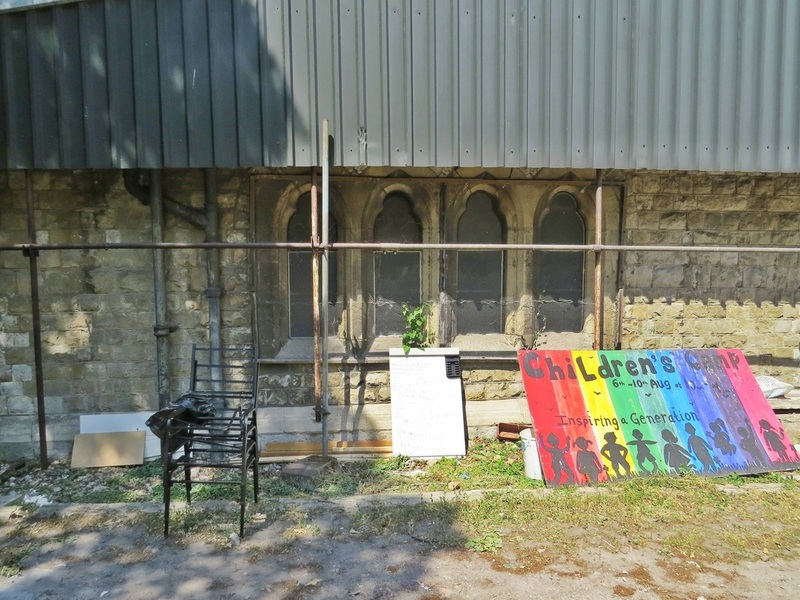 Southwark Cathedral has had several plans to demolish the church & redevelop the site rejected. 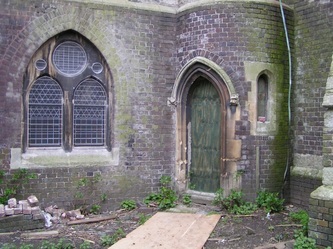 Hither Green Cemetery opened in 1873, This decaying chapel was built in the same year by a building contractor called William Webster. 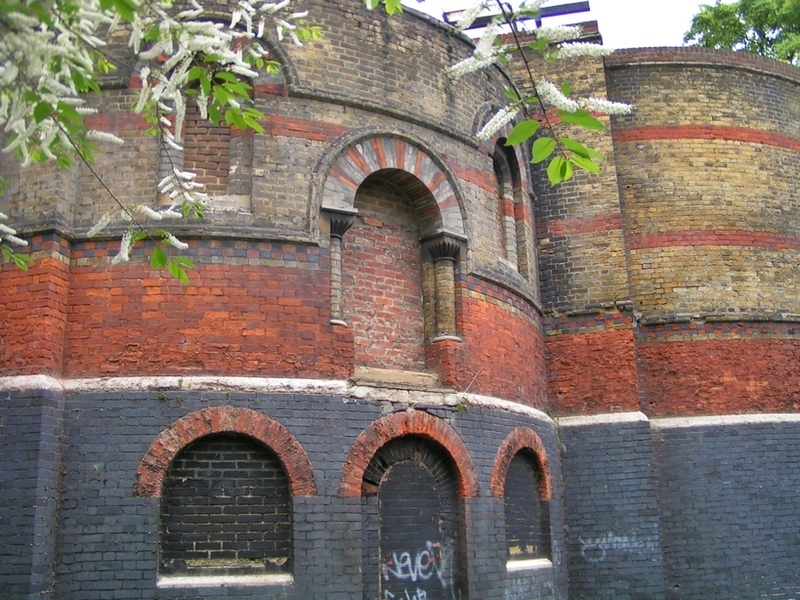 Webster was also the contractor for the formation of the Southern Outfall Sewer, the Crossness & Abbey Mills pumping stations,a portion of the Victoria Embankment, the whole of the Albert and Chelsea Embankments, the foundations of St. Thomas's Hospital, and the extension of the embankment of the Houses of Parliament. 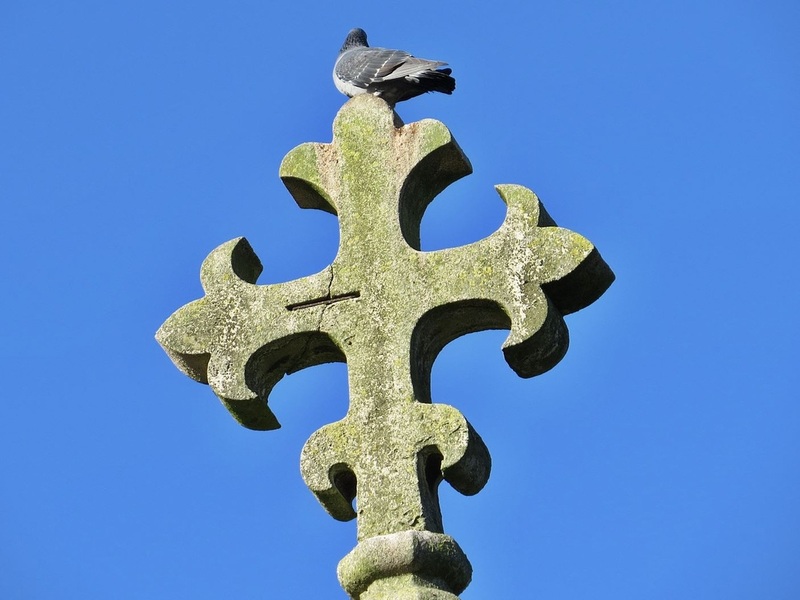 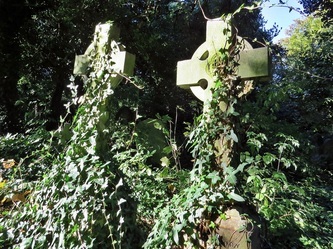 The cemetery itself is quite well maintained though there are a few intriguing overgrown areas.It is also home to one of the largest flocks of ring-necked parakeets in London. 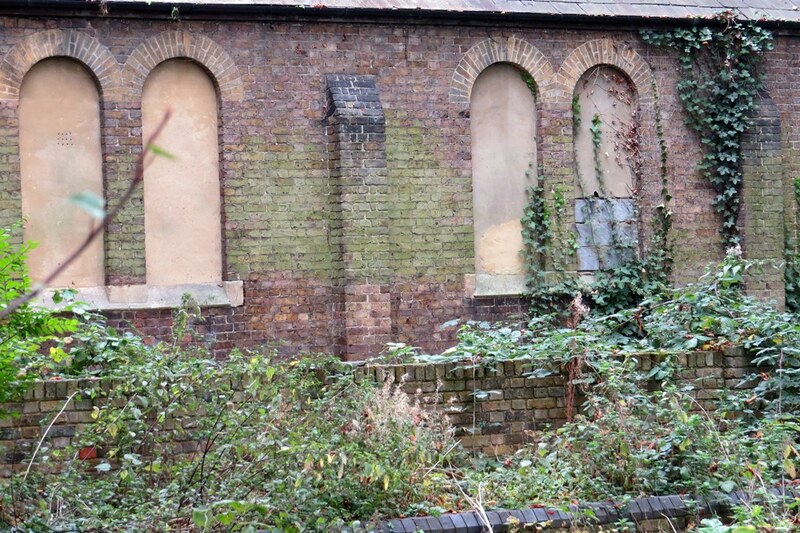 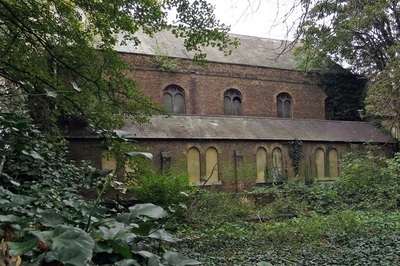 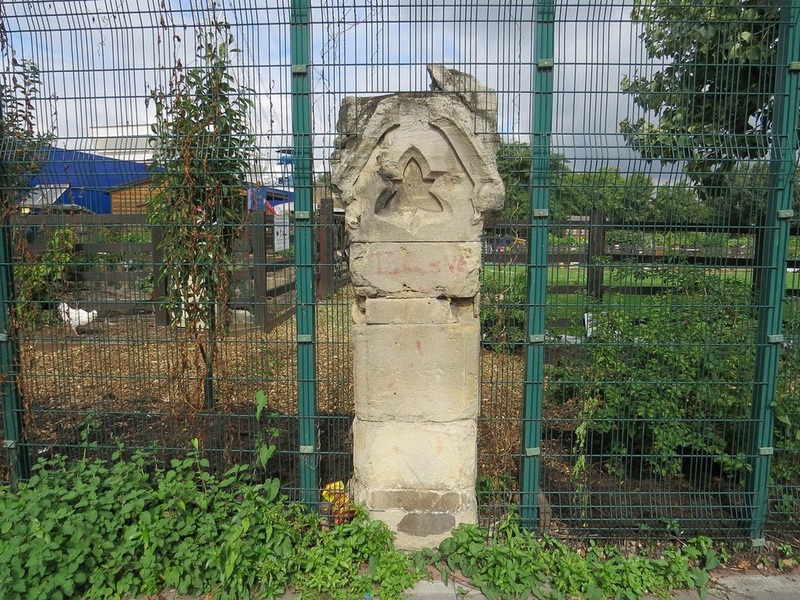 These are remains of the Congregational Church and now forms part of Stepney City Farm. 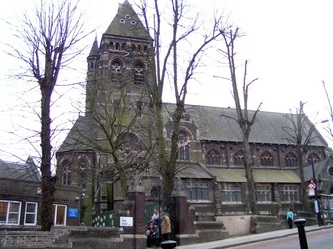 The Congregational Church was a large building and built in 1862−3 to replace Stepney Meeting House, which was previously on the same site. 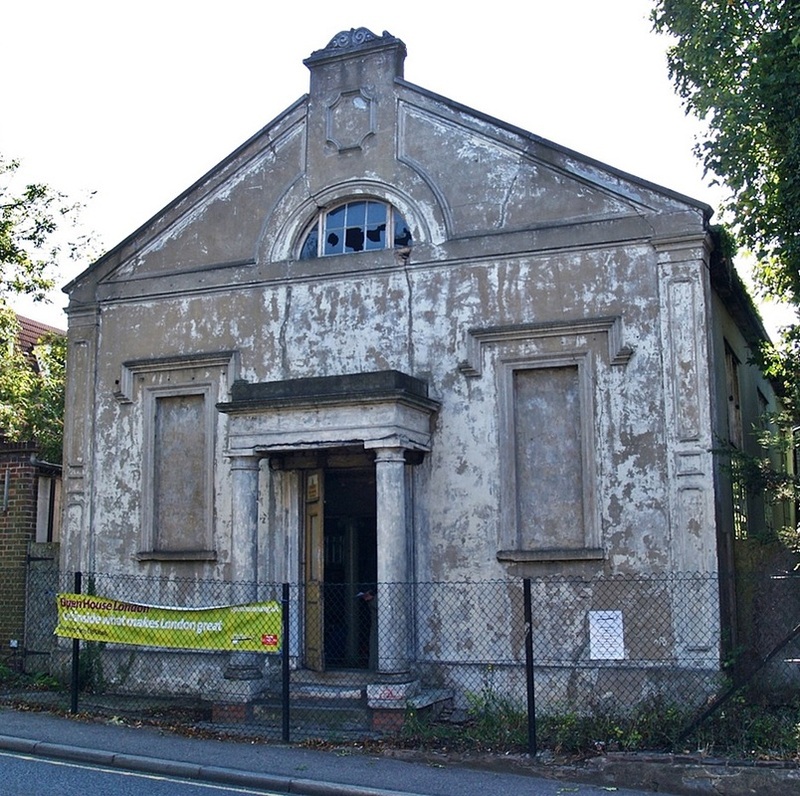 The meeting house was built in 1674 to serve the Stepney Meeting, a notably early congregation of Dissenters founded in 1644 (the first independent church in East London). The Church took a direct hit during Second World War bombing & was demolished in 1950−1, except for its rear wall seen here. 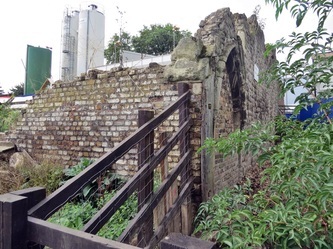 A stone gate pier surviving was at one side of an open passage that originally ran alongside the church where a doorway, surviving in the rear wall of the church, was subsequently blocked. 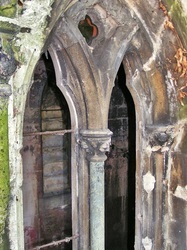 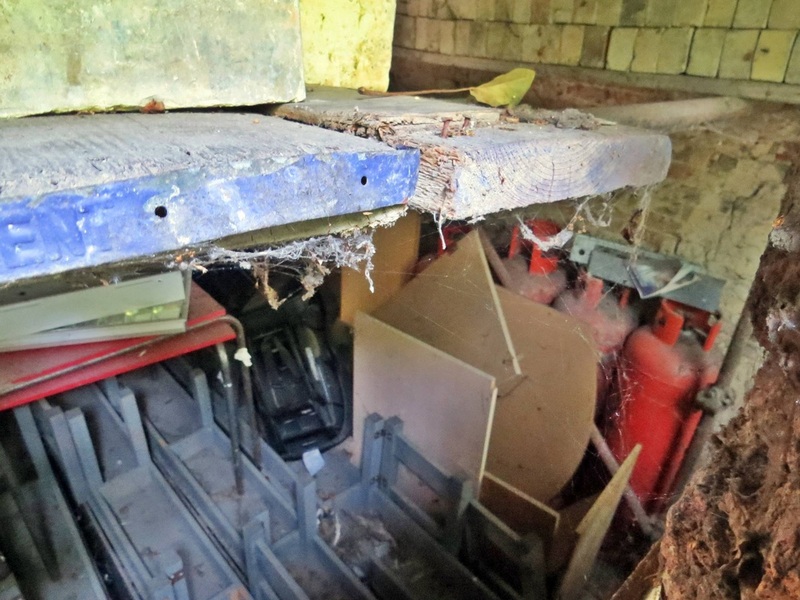 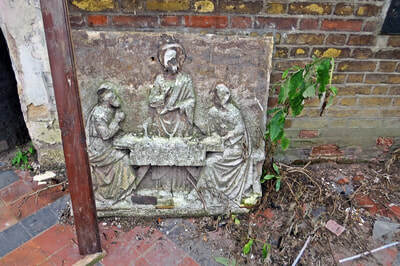 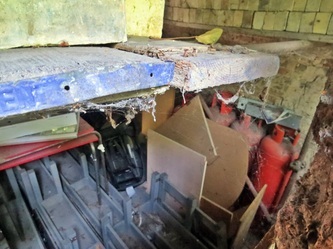 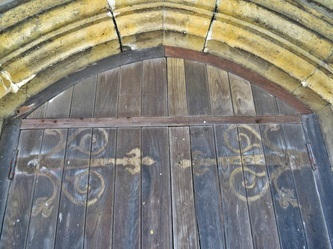 The church was known to have a basement and that is likely to have been sealed up using debris from demolition. At the opposite end of Stepney City Farm to the Congregational Church ruins is the front of a Baptist Chapel dating back to 1811 in the corner of the grounds of what had been Worcester House (locally known as King John's Palace), an aristocratic mansion of 16th century or earlier date. A terrace of houses already existed adjoining the gatehouse of Worcester House, which had sheltered several prominent 17th century non-conformists at times when they were subject to persecution. 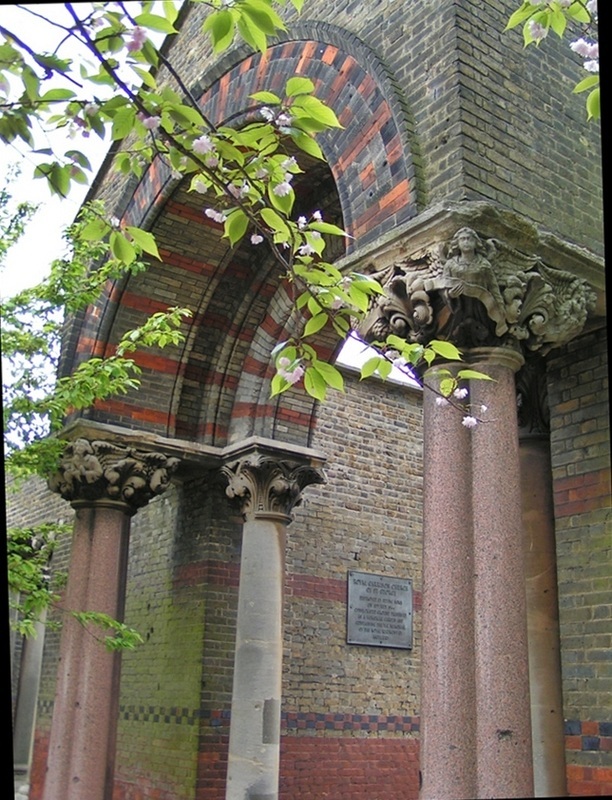 In 1809 a college was established to train Baptist ministers, known as Stepney College, and the chapel was built to serve the college. 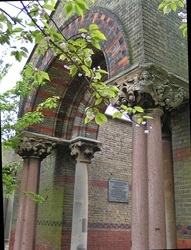 From the 1850s, when the college moved to Regent’s Park, the chapel was used by Plymouth Brethren (an Evangelical Christian movement whose history can be traced to Ireland). 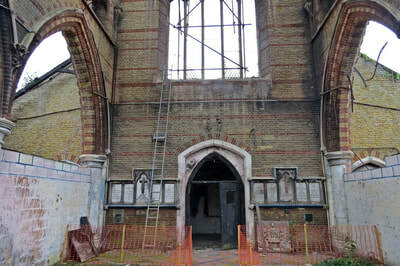 Like the Congregational Church above the Chapel was a victim of Second World War bombing The chapel was burnt out leaving only its front entrance and stair vestibule standing. 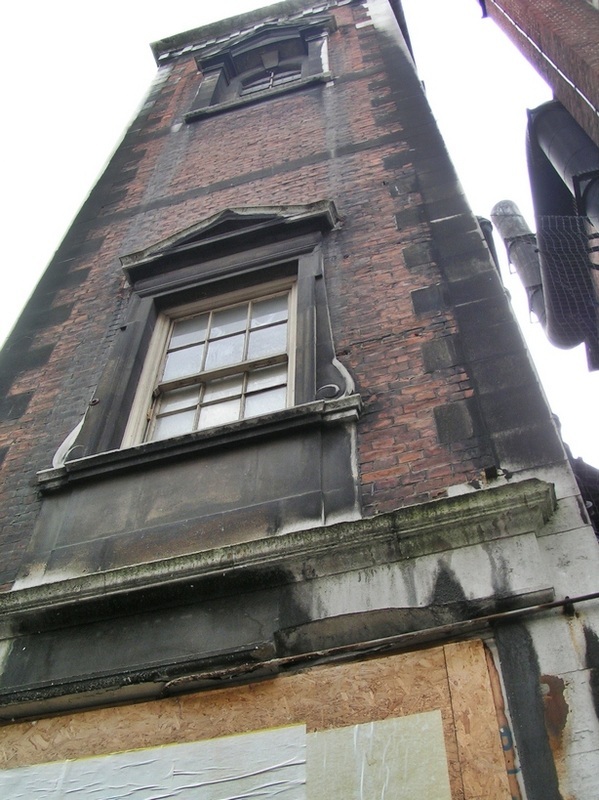 Crossrail is currently excavating a 150ft hole for a ventilation shaft around this site and discoveries include a courtyard and the foundations of the historic Worcester House . 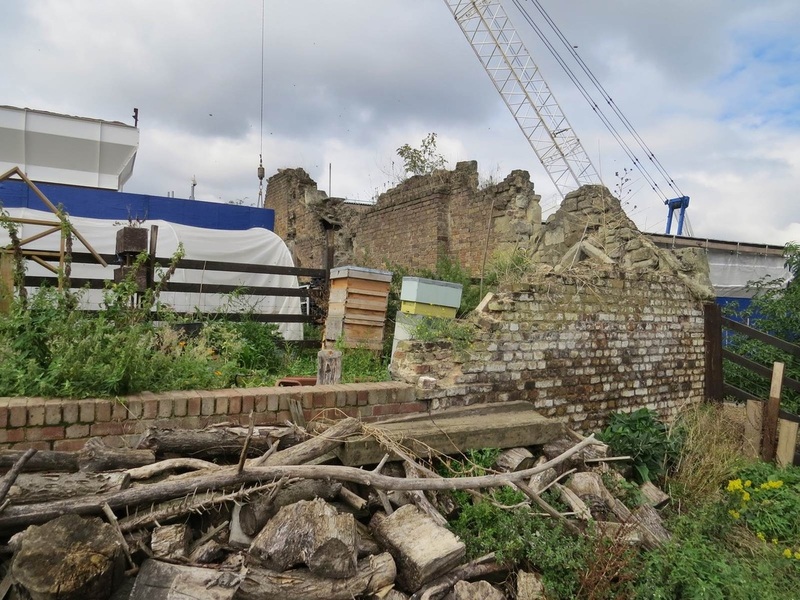 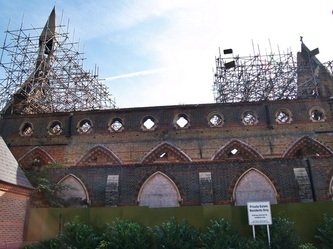 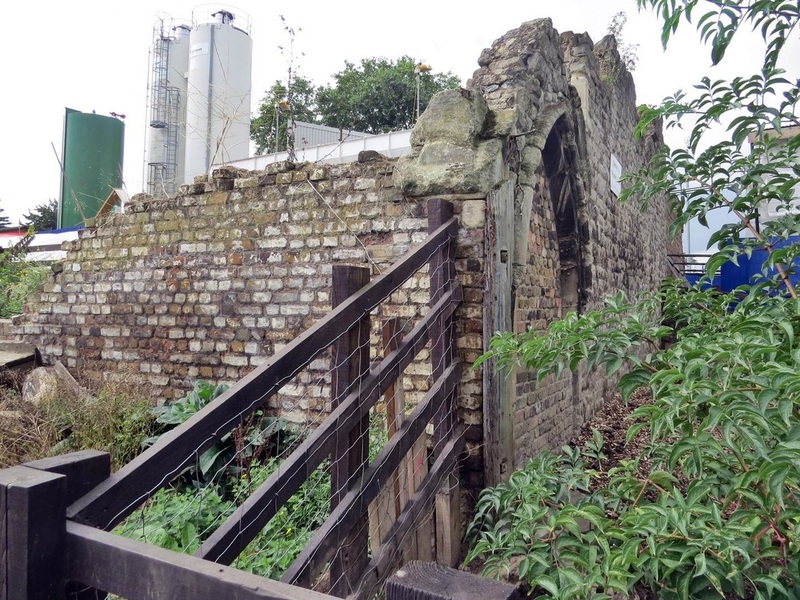 English Heritage has received four tons of brickwork found buried onsite which has had to be carefully removed by Crossrail and is being used to repair other Tudor buildings around the country with genuine period bricks. Situated adjacent to St Peter's Church (a huge former Anglican church, now an ecumenical centre) this hall was constructed in 1899. 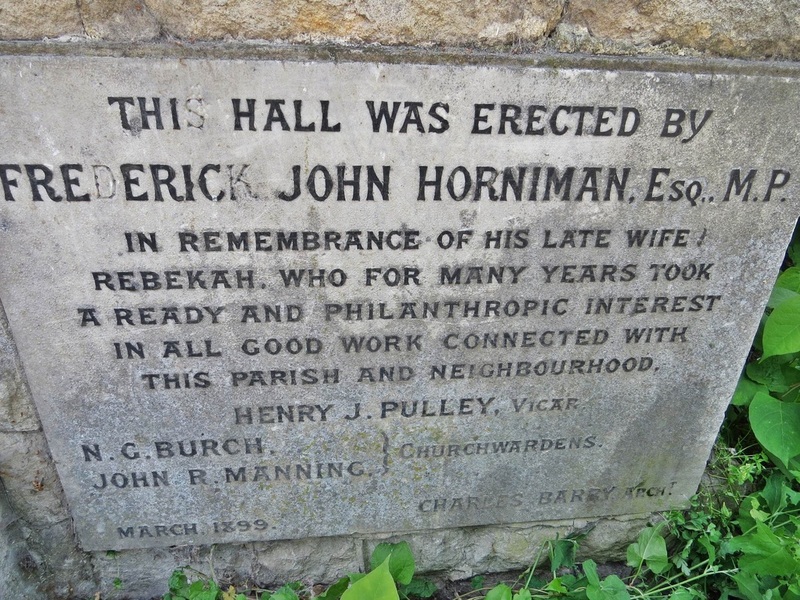 The hall was erected by Frederick John Horniman (a tea trader, collector, public benefactor & MP) in memory of his late wife. 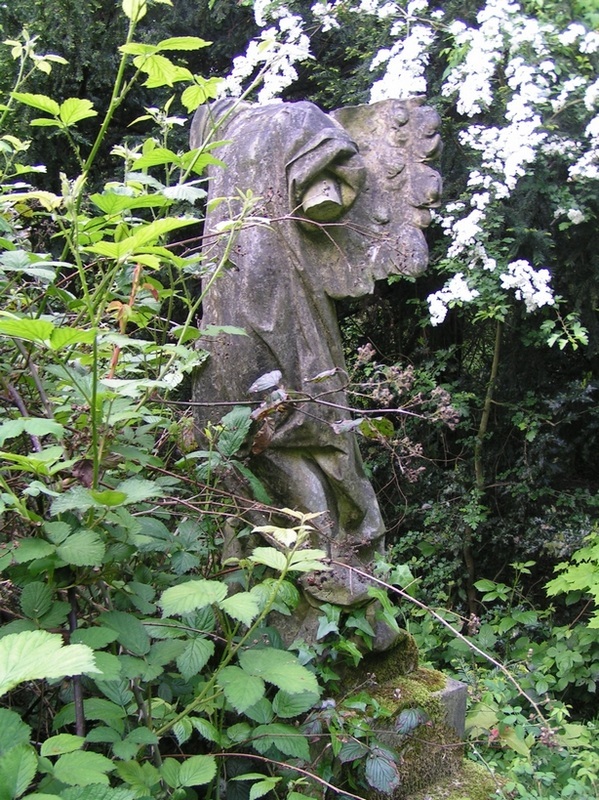 He is perhaps best known for founding the nearby Horniman Museum in Forest Hill. 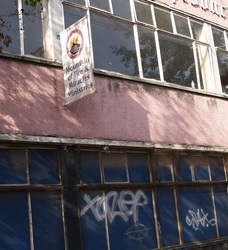 The building is currently vacant and is suffering from structural movement and lack of maintenance. 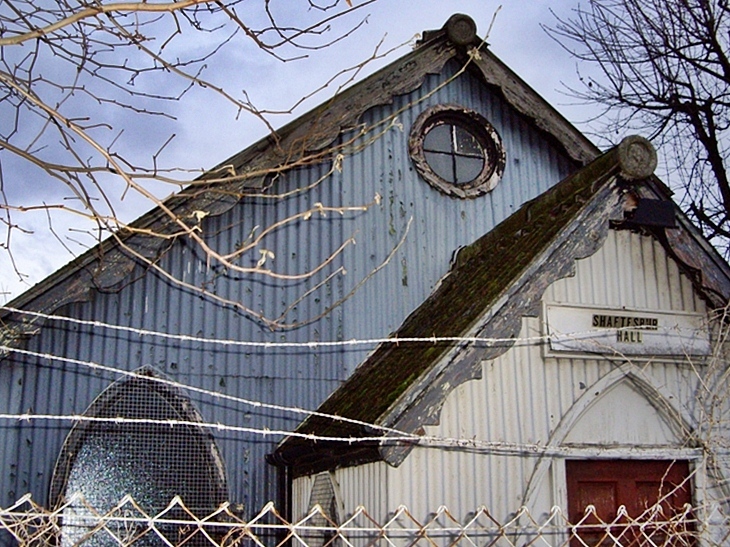 Half of the original roof has been replaced with metal covering, the ornate door hinges has been removed and the interior is full of junk. 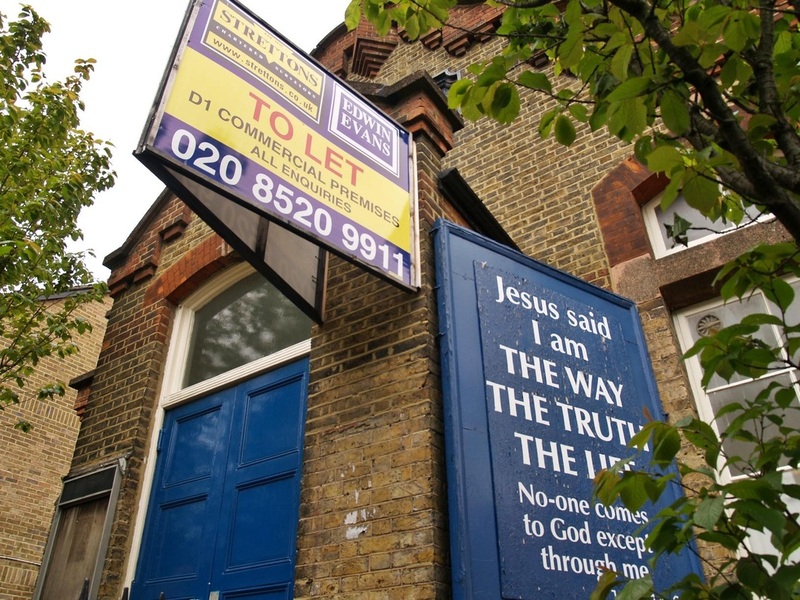 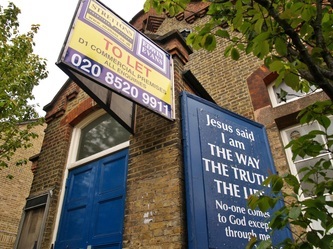 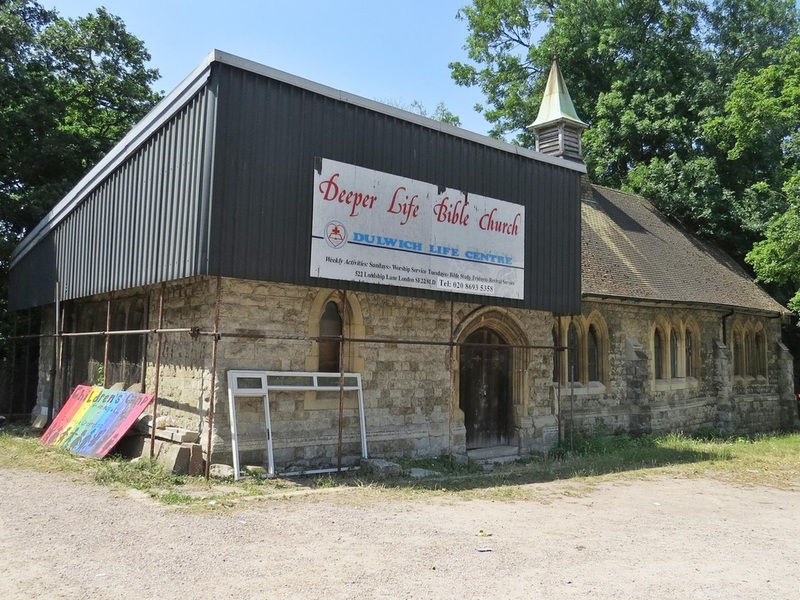 The hall's last occupant was the Deeper Life Bible Church Dulwich (aka Deeper Christian Life Ministry) an African church that (according to their website) does not fit traditional categories or classifications. 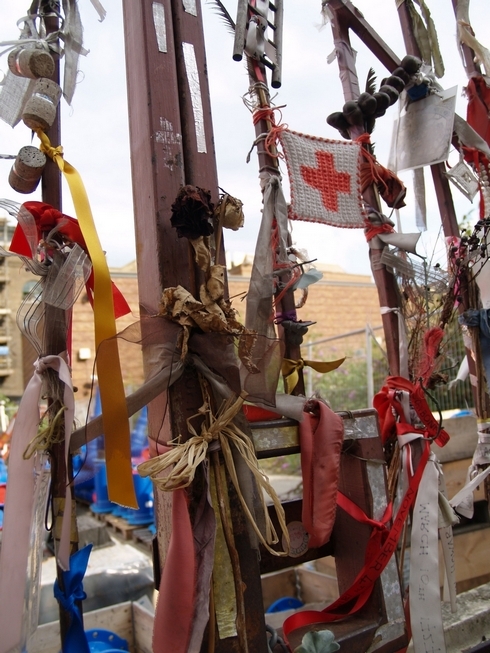 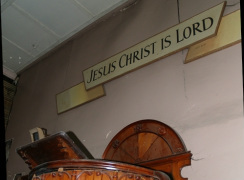 Their website maintains a set of testimonials from people who claim supernatural healings have occurred as a result of prayers being offered by Pastor Kumuyi. 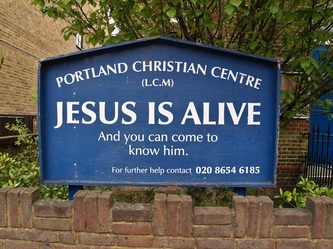 These claims include the reversal of paralysis, spontaneous growth of limbs, spontaneous disappearance of mental diseases, and such. 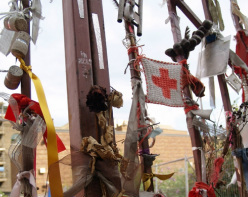 In August 2012, a Deeper Life Church in Okene was attacked by three gunmen, who opened fire on a Bible study group with Kalashnikov assault rifles, killing 19. In 2000, there was a lively correspondence about Woodgrange Park Cemetery and some of the headstones to be used on the Emmerdale [TV soap] set in Yorkshire,prepararatory to the sale of part of of the cemetery for housing. 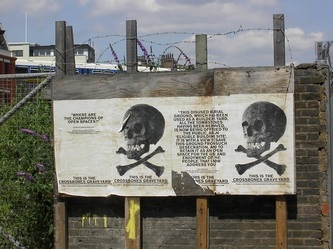 The London Evening Standard carried a full page report and pictures on the work of exhumation. The pictures are of a piles of discarded coffins and a large JCB at work as men sift through the soil for bones. 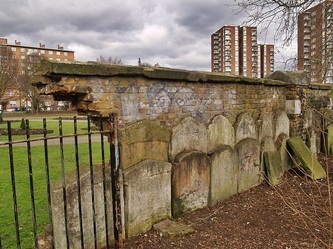 "The graves of East London civilians killed during the worst raids in the Blitz are being bulldozed to make way for flats. 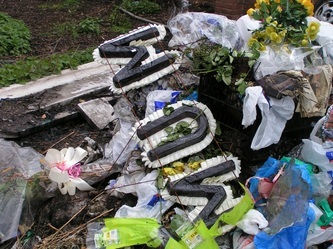 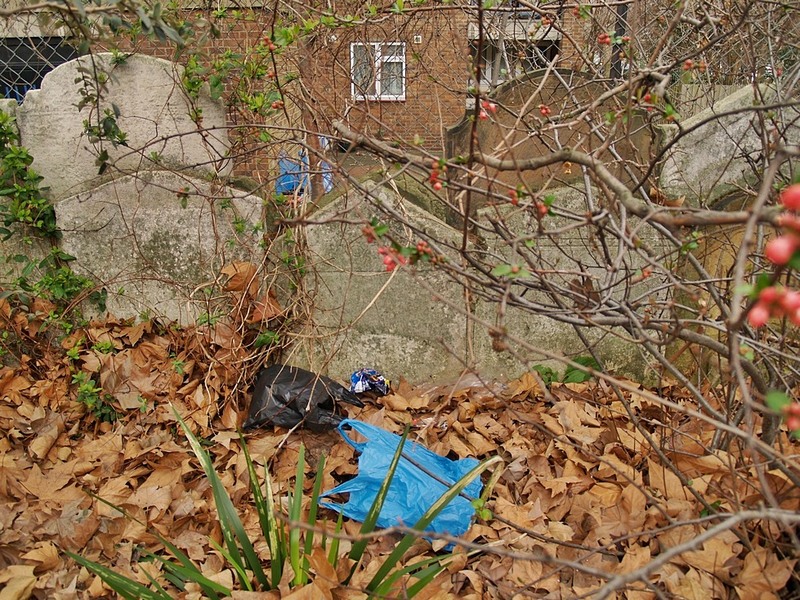 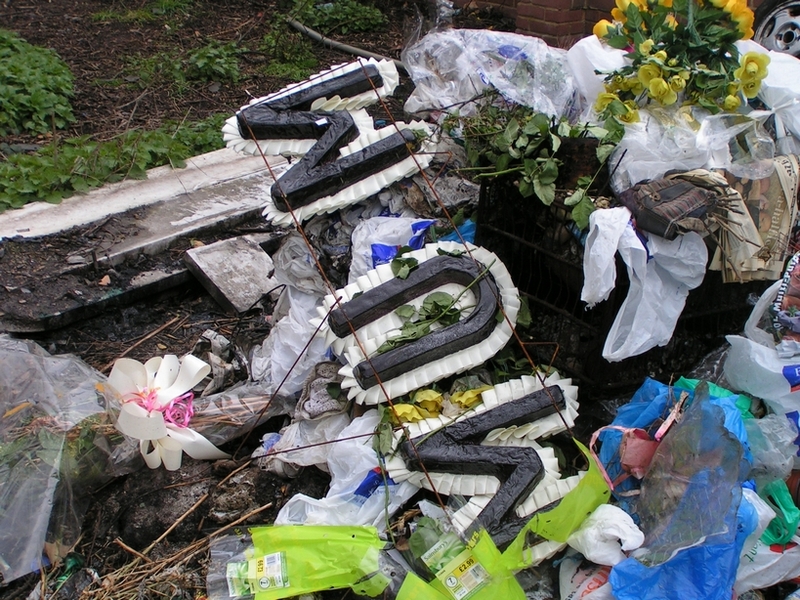 ...the remains of about 15,000 people are being dug up and bagged in plastic bin-liners. .....Screens were erected around the graves but residents of flats overlooking the site said they have been shocked to see skeletons unearthed by mechanical diggers . . 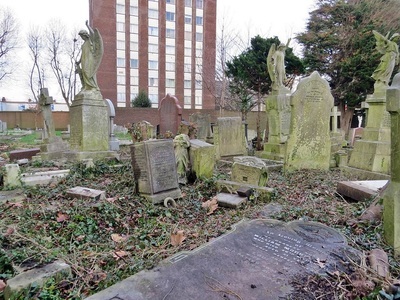 According to Council records the graves date back to the 1890s but during the height of the Blitz a a 20ft deep pit was dug to take the thousands of casualties. 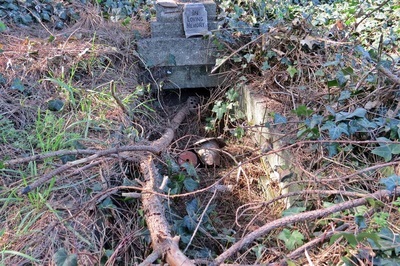 Most of the graves were unmarked, but details of the dead were entered in a burial register. 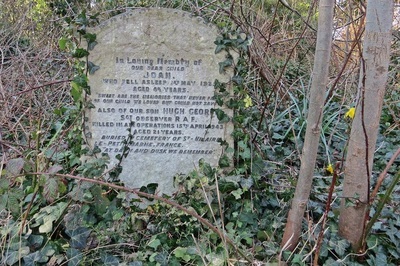 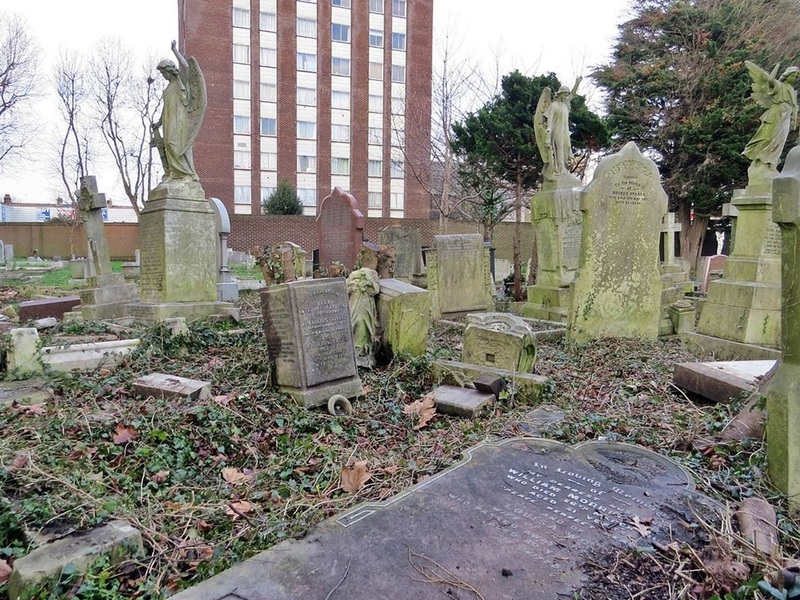 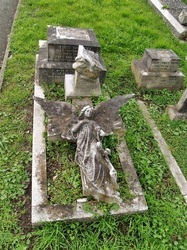 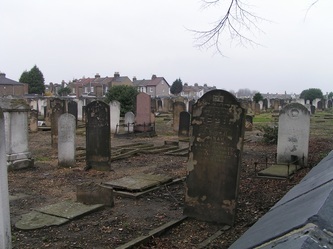 Newham Council contacted 21 families and their relatives were exhumed and re-buried in part of the cemetery still in use. 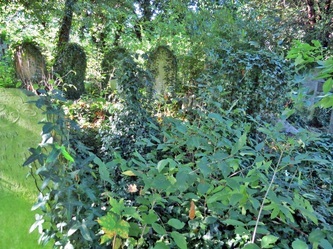 The 27-acre cemetery is privately owned. 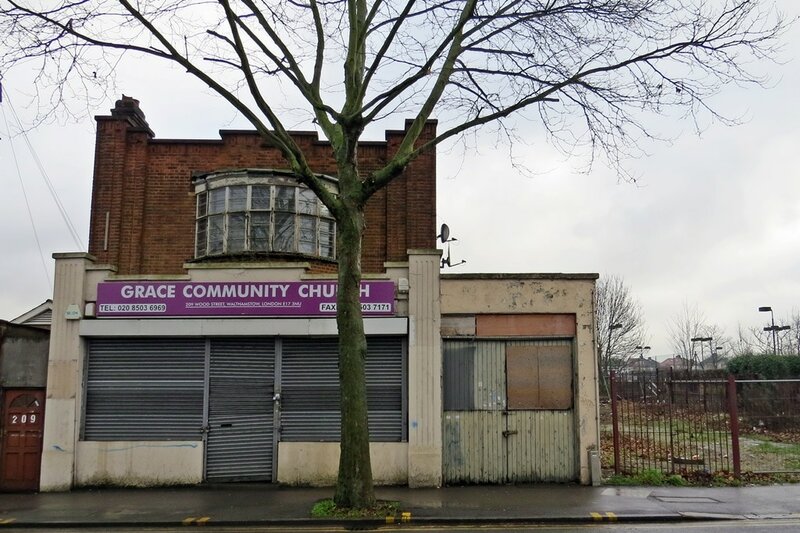 The deal to sell part of the site for residential development was done after Newham agreed planning permission for 120 two-bedroom flats." 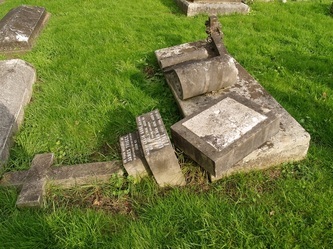 "The memorial stones used in Emmerdale were not sold ...they were taken off by the cemetery owners ready to be broken up and put in a skip ..but the chairman of the friends of Woodgrange cemetery knew the people from Emmerdale were creating a cemetery for the programme and they agreed that they would come down from yorkshire wrap each stone individually and transport them back to yorkshire .but if anyone came forward at a later date and wanted their memorial stone they would bring it back.The stones were not bought no money what to ever changed hands they were just saved from being broken up. 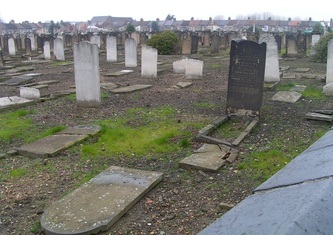 All of those buried in the squares used for housing have been re-intered within the cemetery ....mostly in mass graves ..but those that have been in touch with us or the cemetery since the begining and have wanted their relative buried in a seperate grave have their wish ..The fight was going on a very long time to stop the housing ,to the House of Lords and back in fact , but without success"
Patricia Langley writes to Derelict London: "A friend of mine moved into one of the new flats that were built on the site of the part-cleared cemetery. 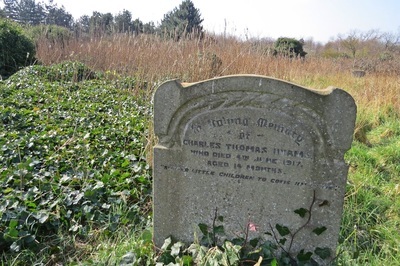 He told me that even though his vegetable garden was very fertile (anything would grow in it) he always seemed to always have bad luck and depression, not like Chris at all. 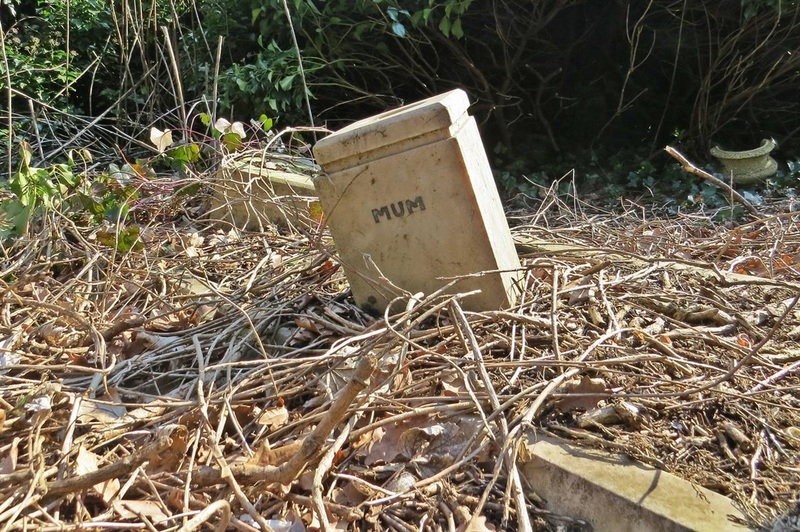 He decided to move out when poltergeist-like activity began breaking out in his home, and his baby was injured by a mug flying through the air and hitting him." 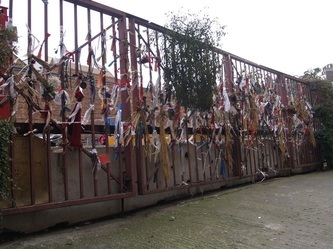 Now in 2014, the chapel is long gone after an arson attack and more of the cementery has been cleared to make way for further Muslim burials at the back in a fenced off area. 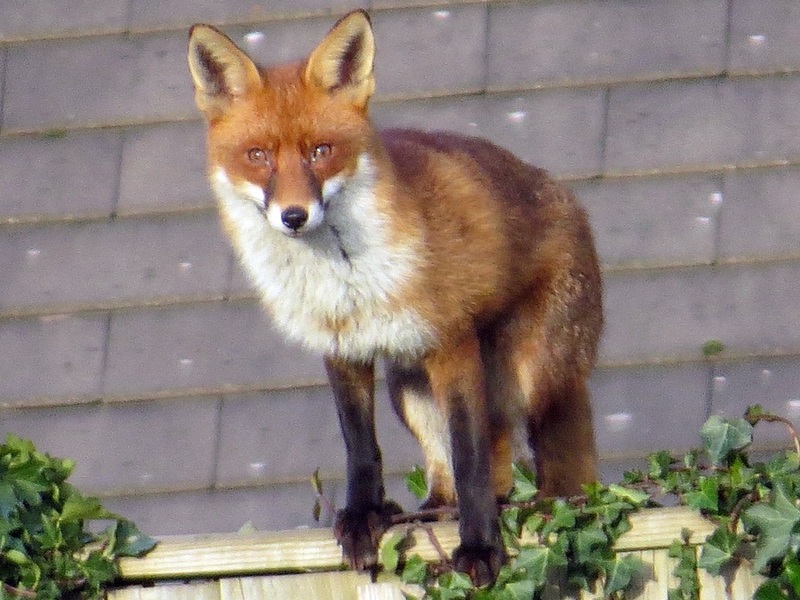 The cemetery has apparently been allocated money to help clean and tidy up what is left of it but as you can see in my latest pictures it looks in a sorry state with hundreds of damaged stones with perhaps only the foxes enjoying the environment. 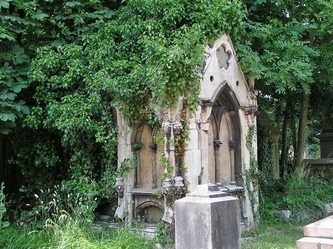 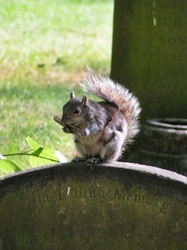 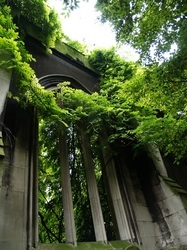 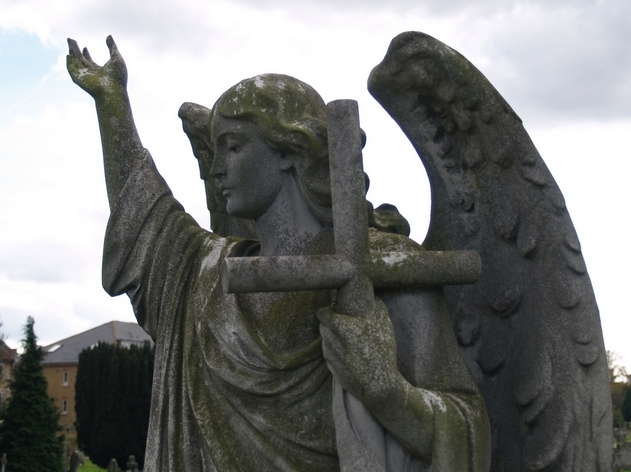 Abbey Park Cemetery is an eery, tranquil Victorian Gothic graveyard - a burial ground for dissenters and Nonconformists. 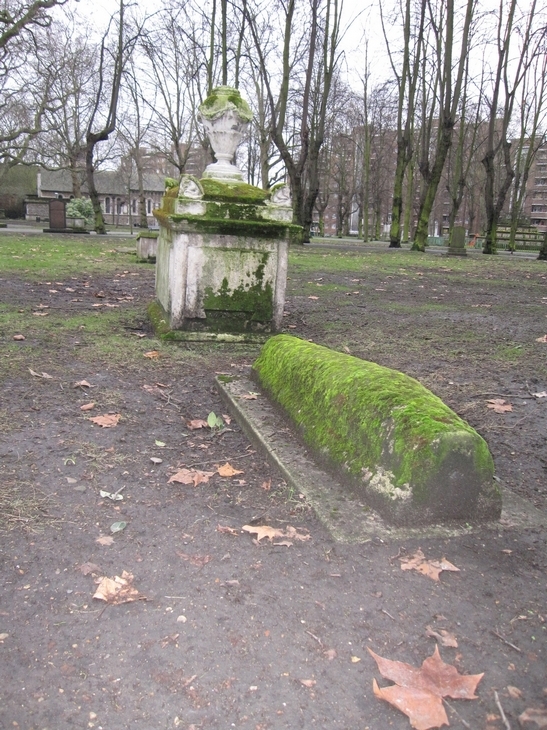 General Booth, founder of the Salvation Army, is buried here. 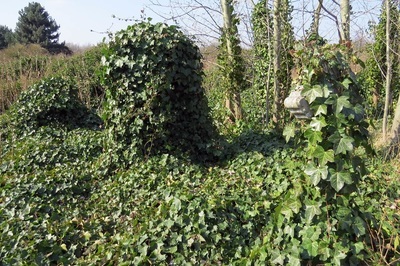 It is noted for its mature woodland, rich in wildlife. 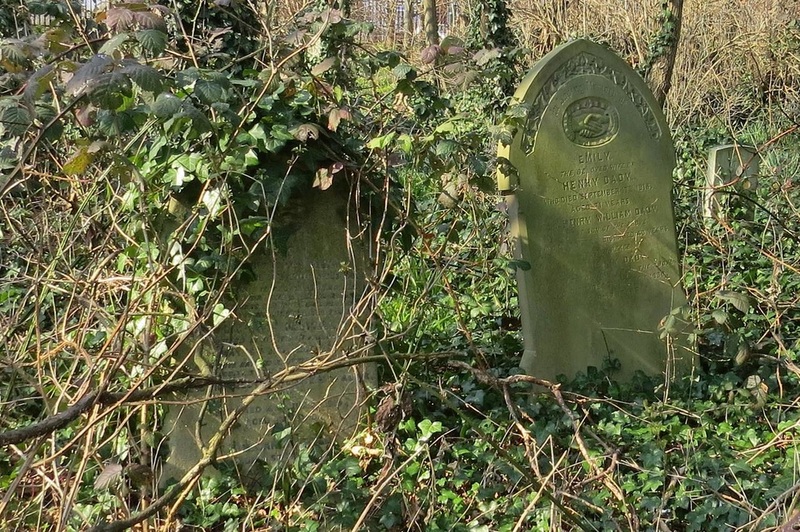 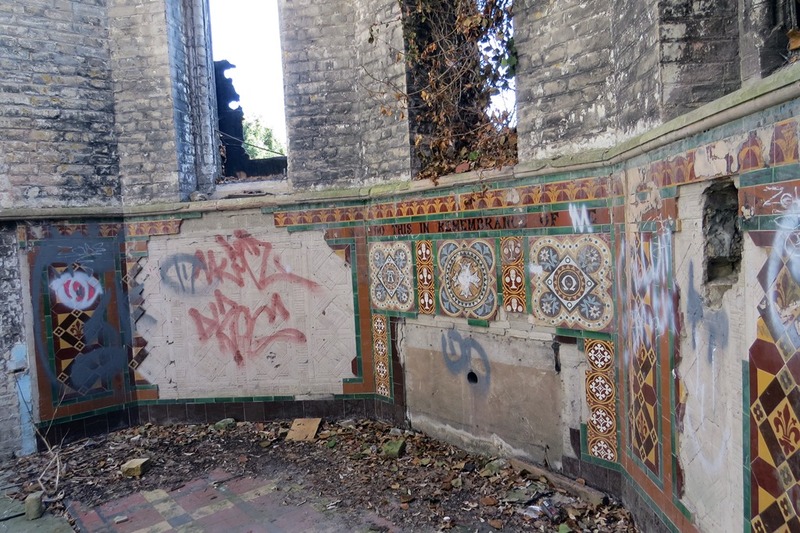 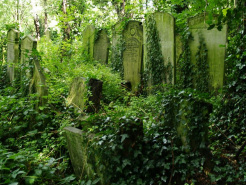 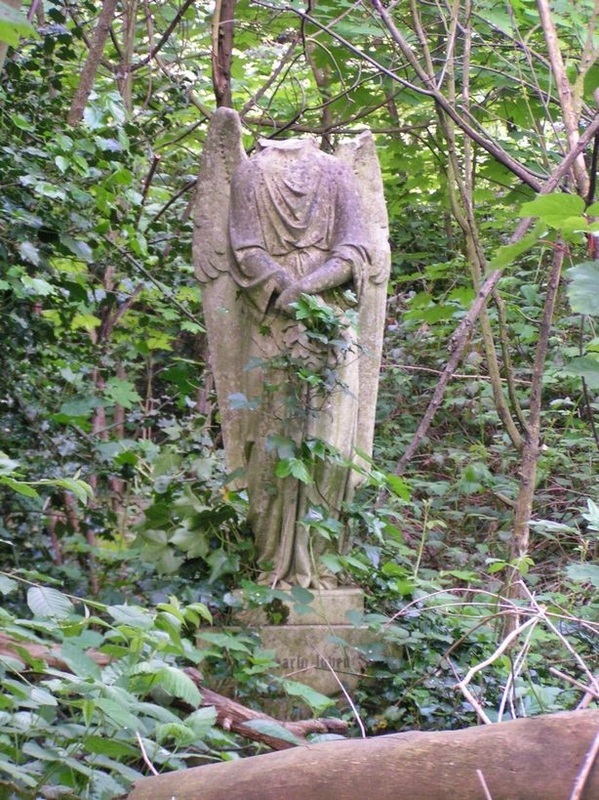 In its heyday it boasted 2500 varieties of shrubs & 1000 types of rose The cemetery was abandoned by the Abney Park Cemetery Company over 25 years ago, and became badly neglected but has now been taken overby a charitable trust who have done much improvement work. 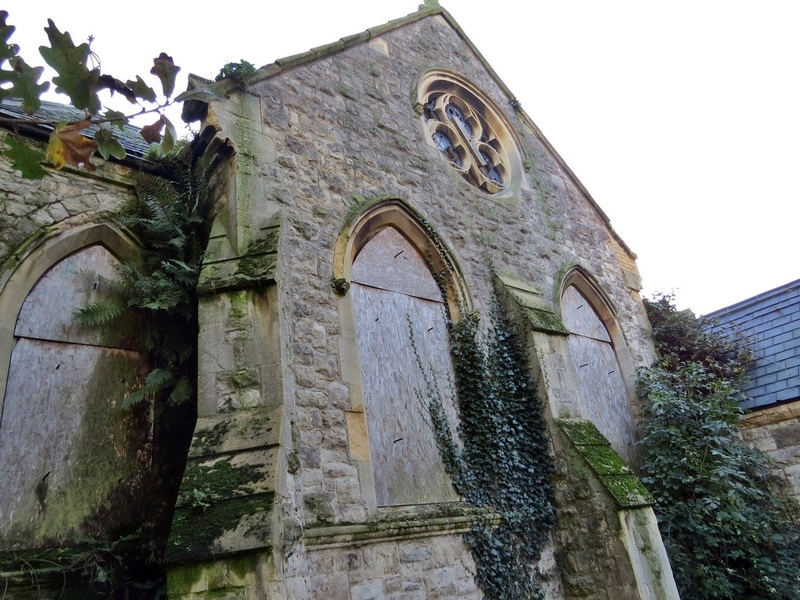 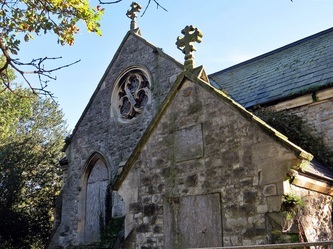 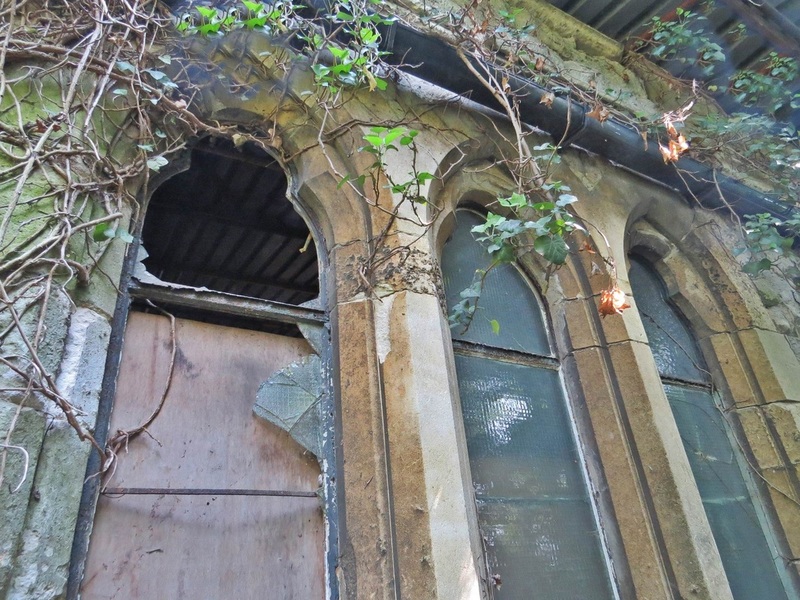 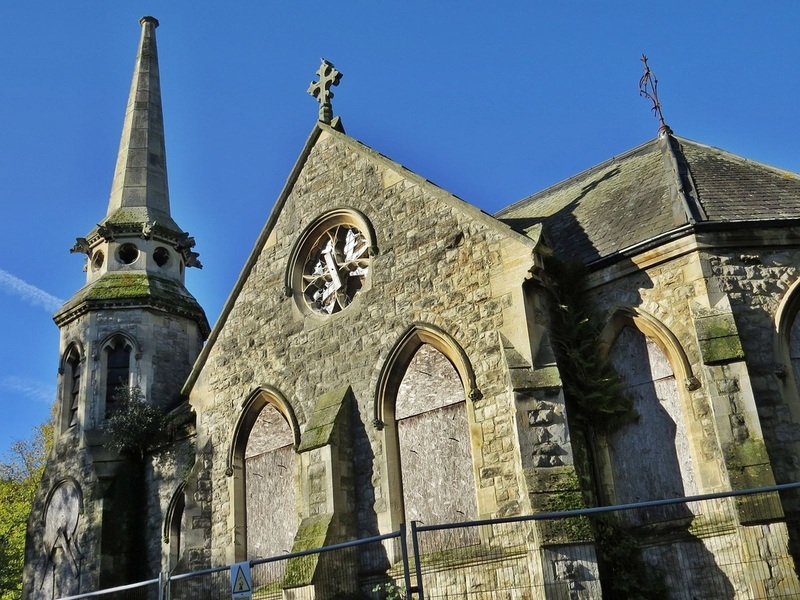 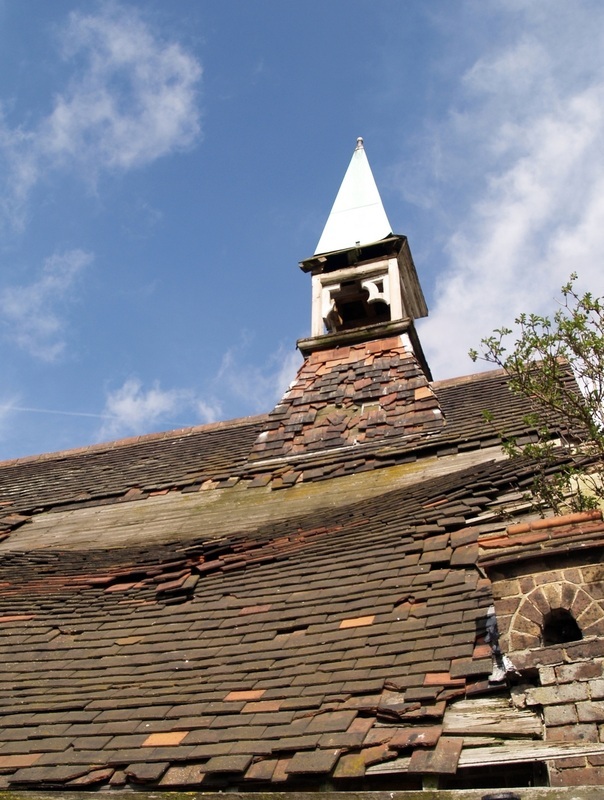 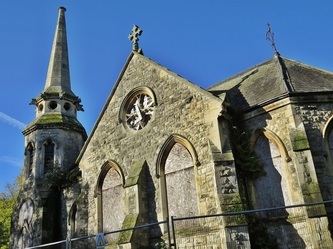 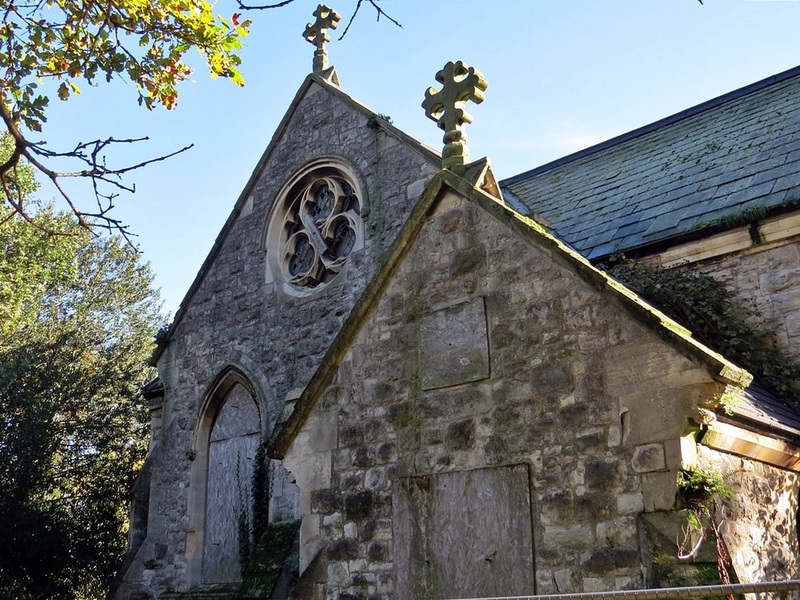 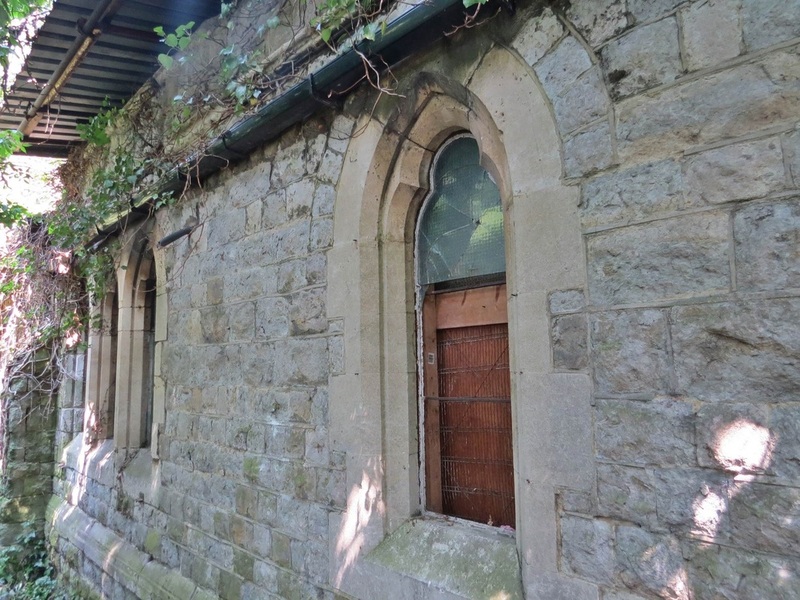 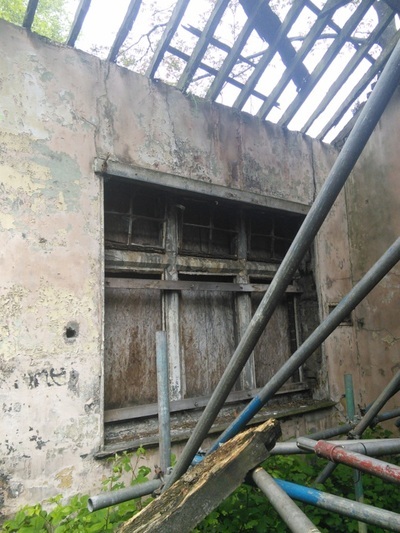 The trust is seeking funding to restore the chapel - this chapel has recently been used as a set for horror films. 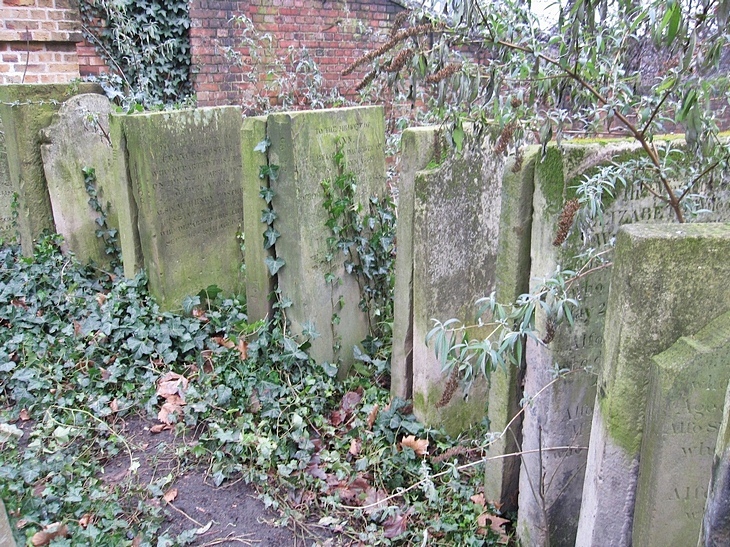 This Jewish part of the main cemetery walled off from the main cemetery opened in 1857 and closed to the public since 2002. 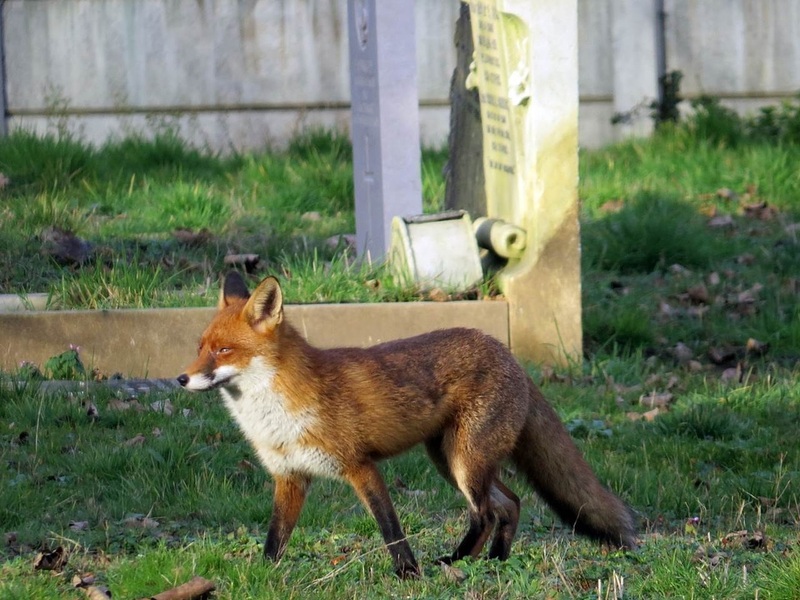 The main cemetery is fairly well maintained, full of grass, trees and flowers but this area is in bleak contrast with little greenery and an eerie atmosphere with just a solitary fox to keep me company. 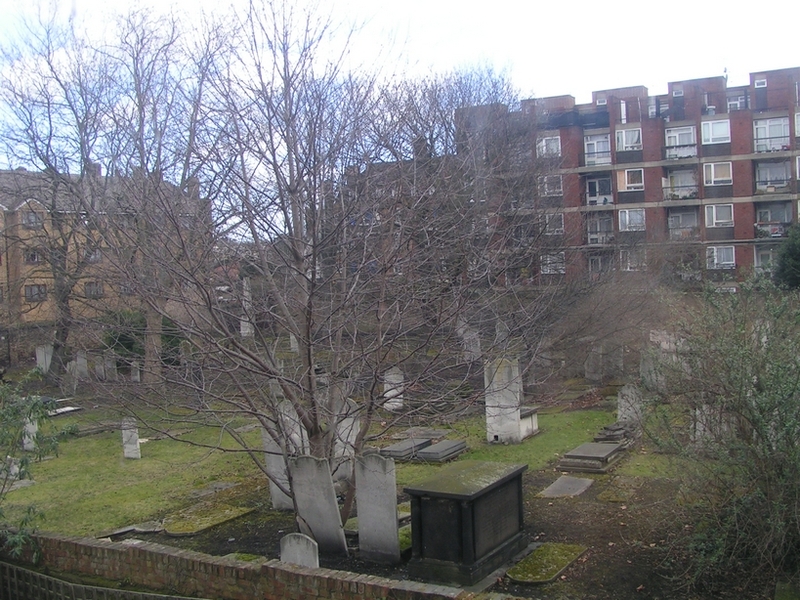 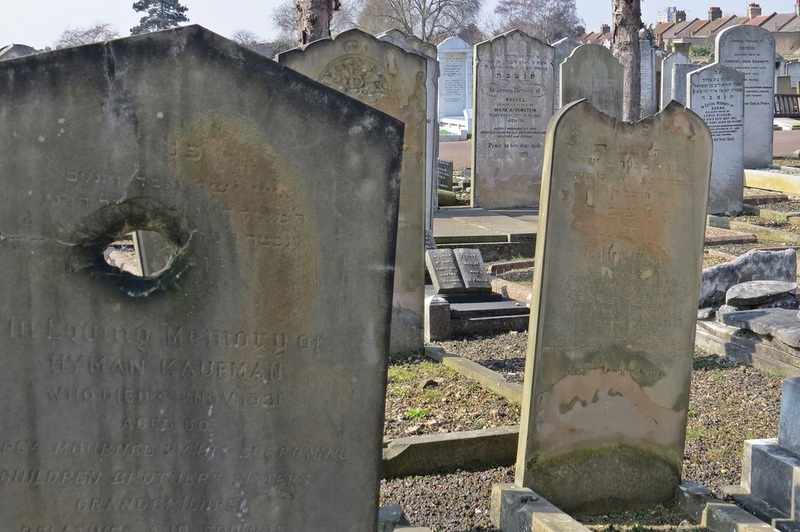 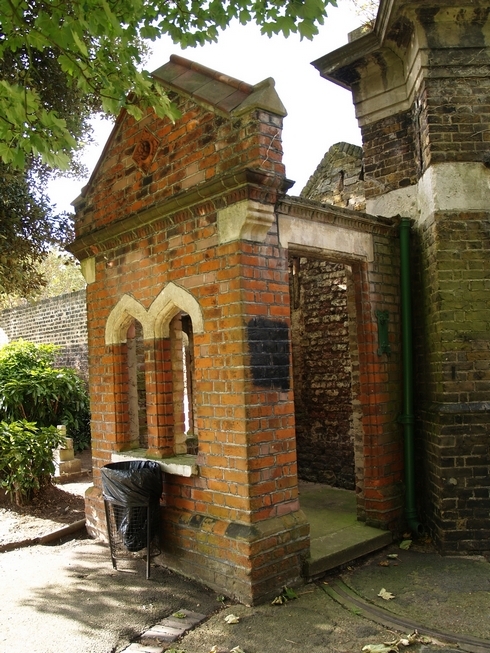 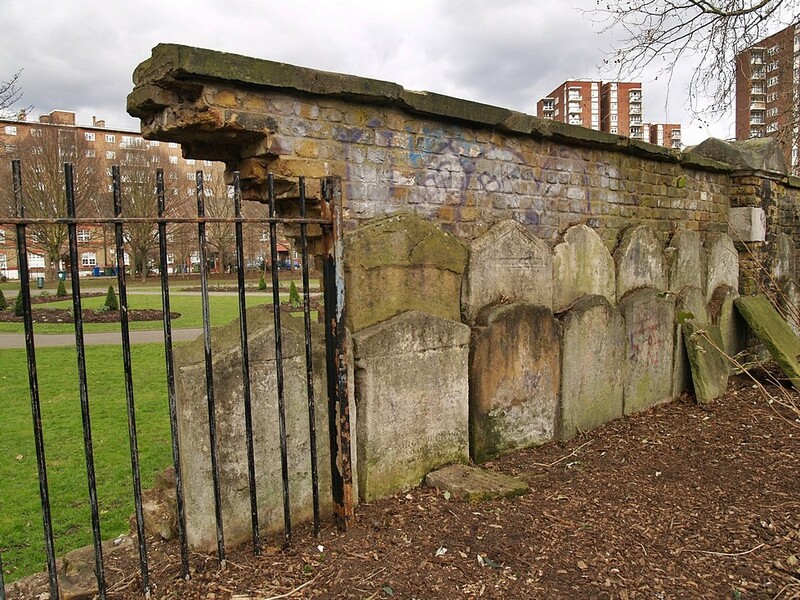 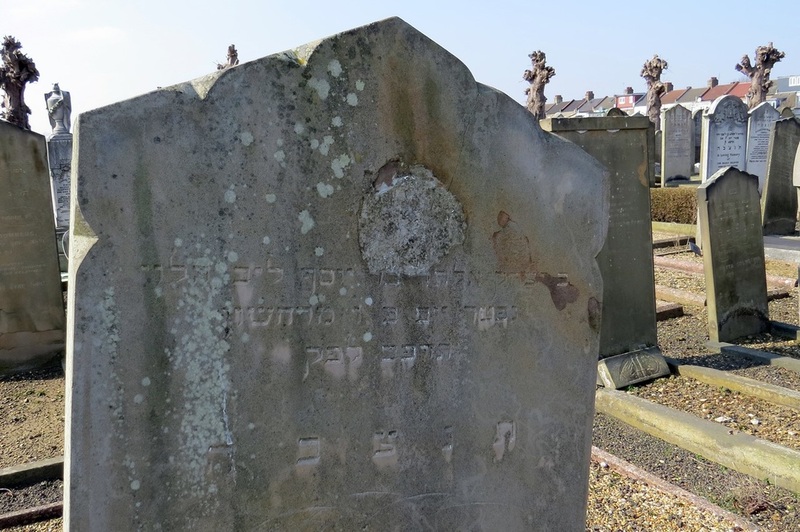 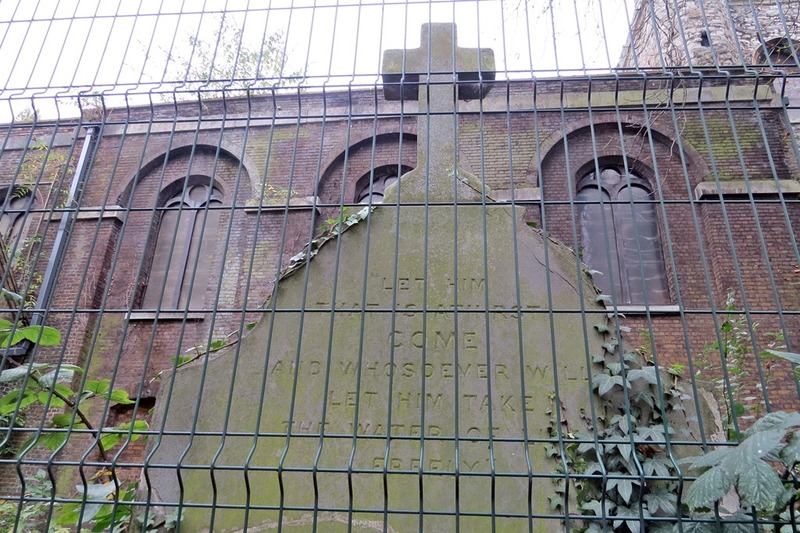 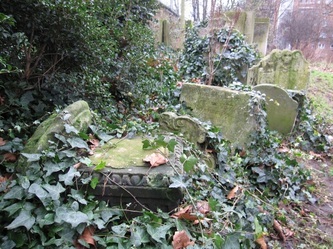 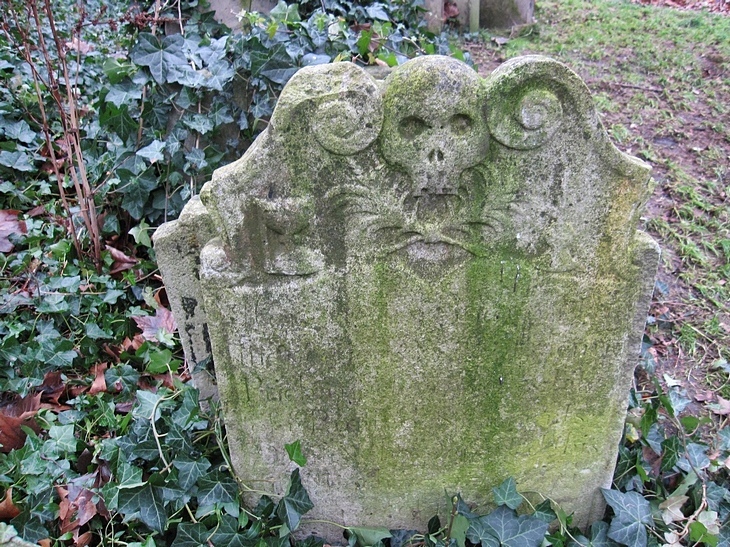 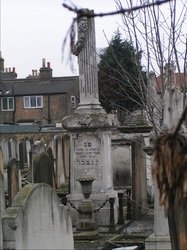 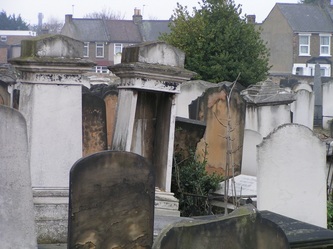 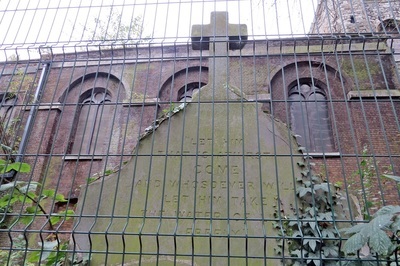 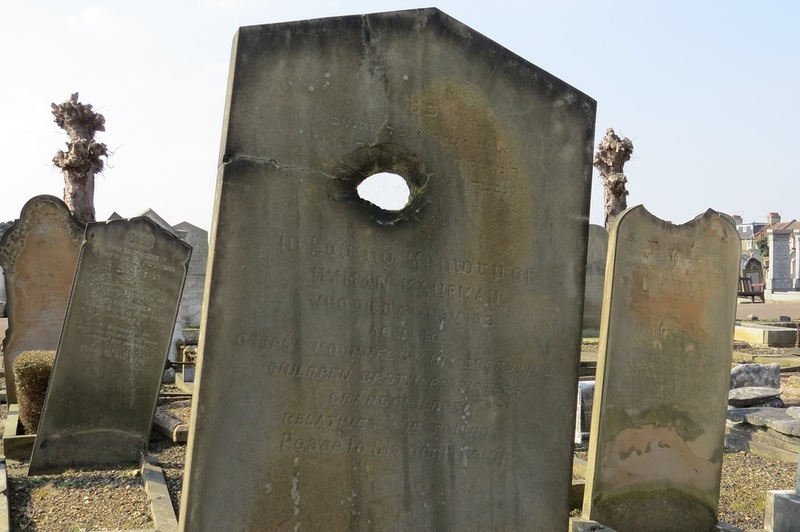 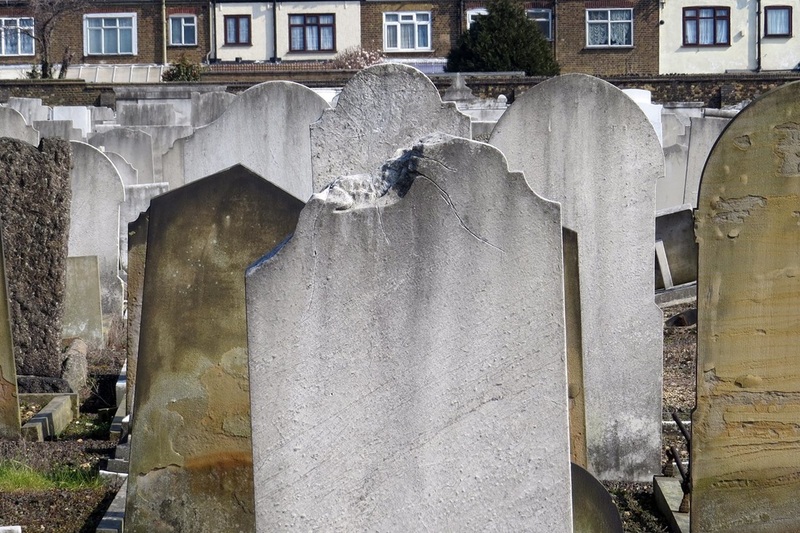 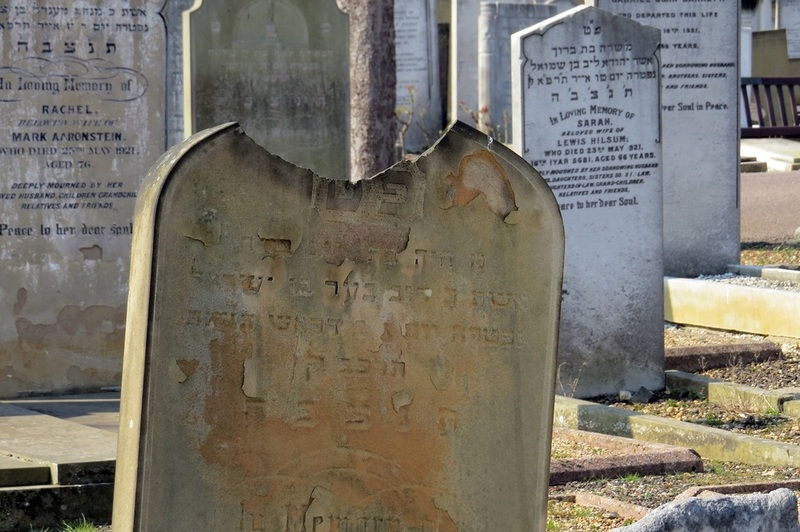 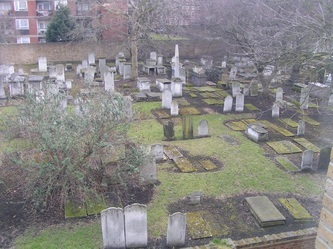 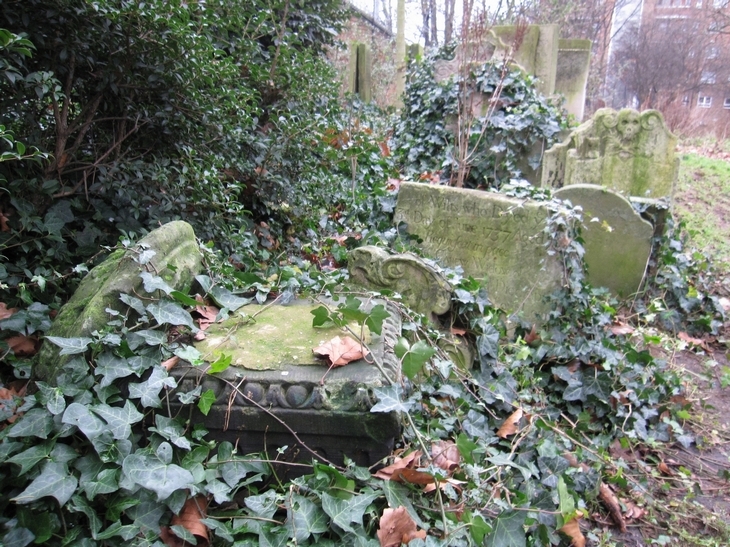 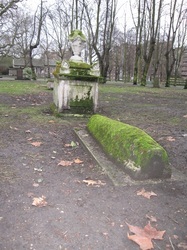 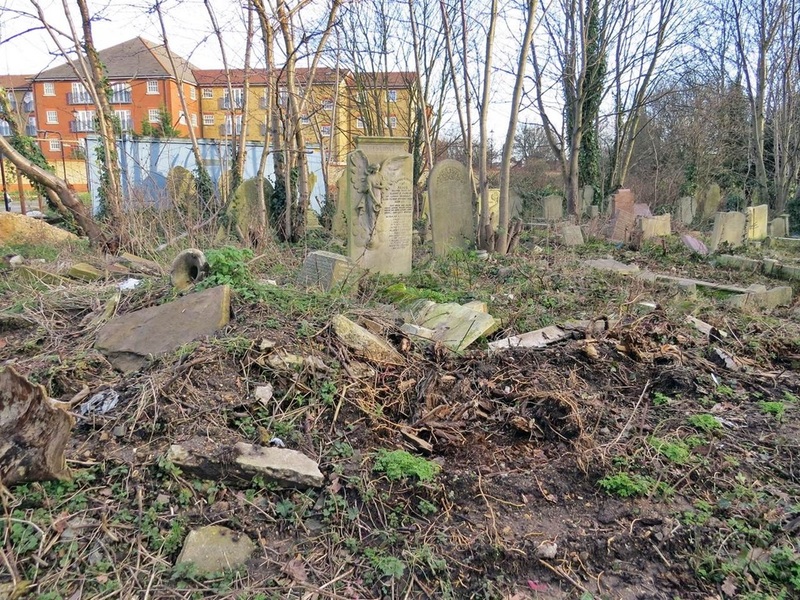 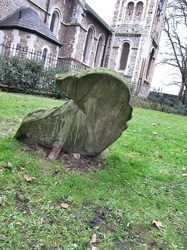 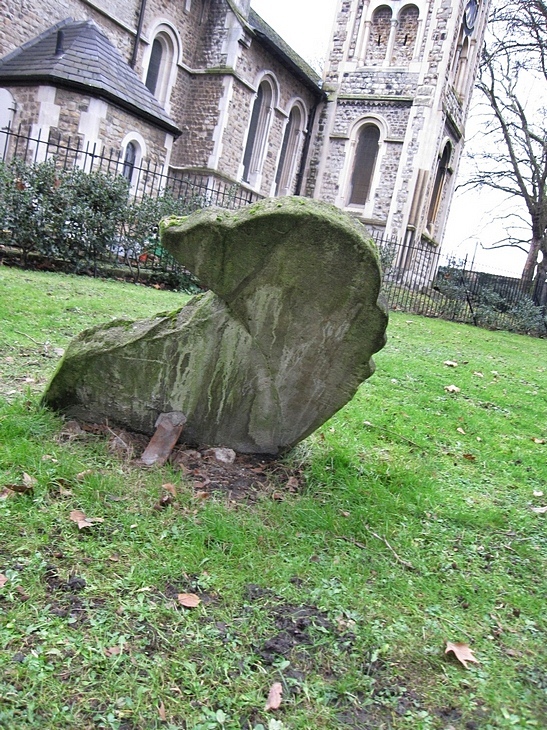 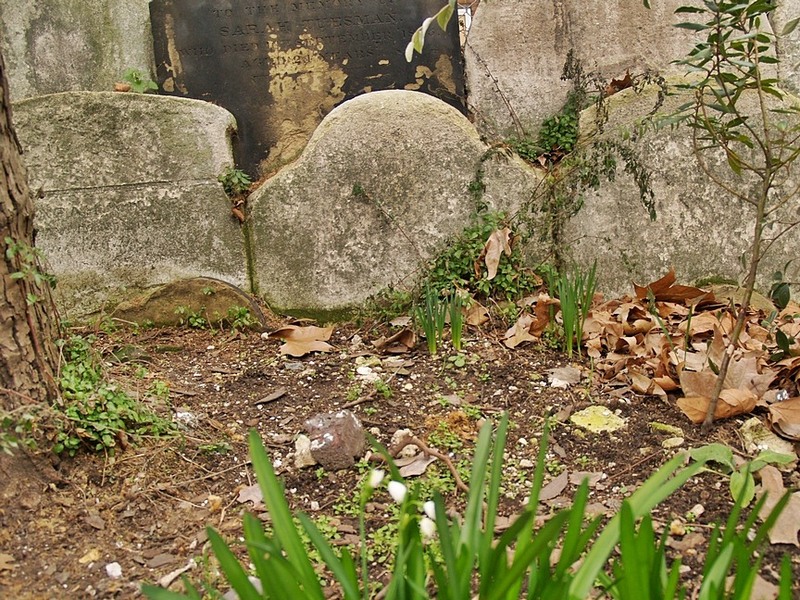 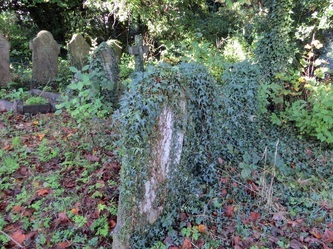 This cemetery also includes remains from the Hambro’ Synagogue Old Hoxton Cemetery, dating from 1707. 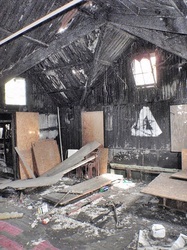 Serious vandalism, clearly anti-Semitic in intent, hit the national headlines in 2005. 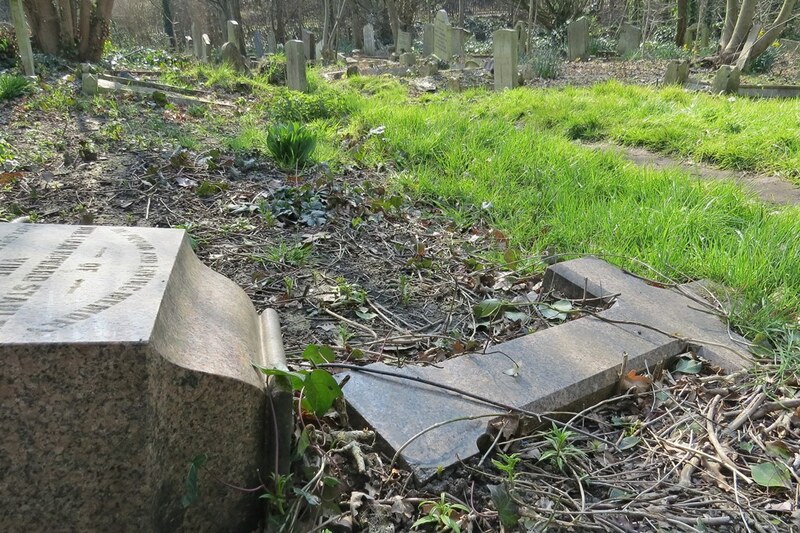 Some 100 headstones were toppled and smashed and swastikas and other hate graffiti scrawled on graves and walls. 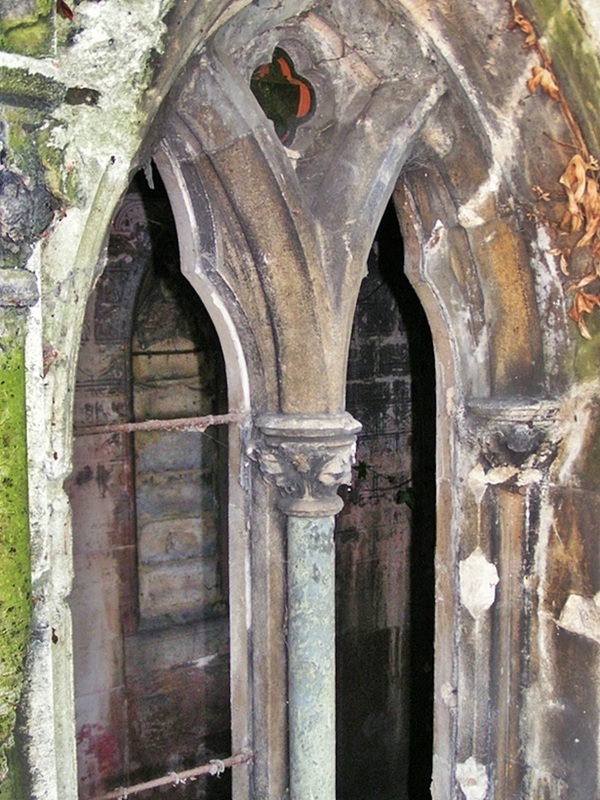 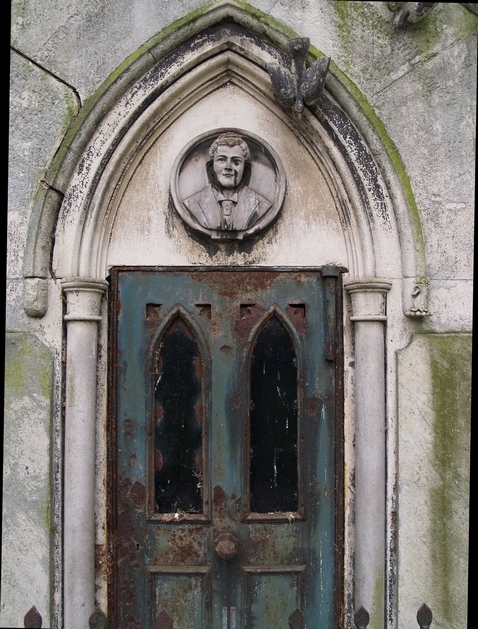 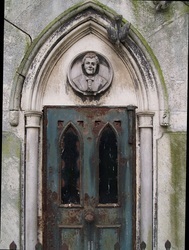 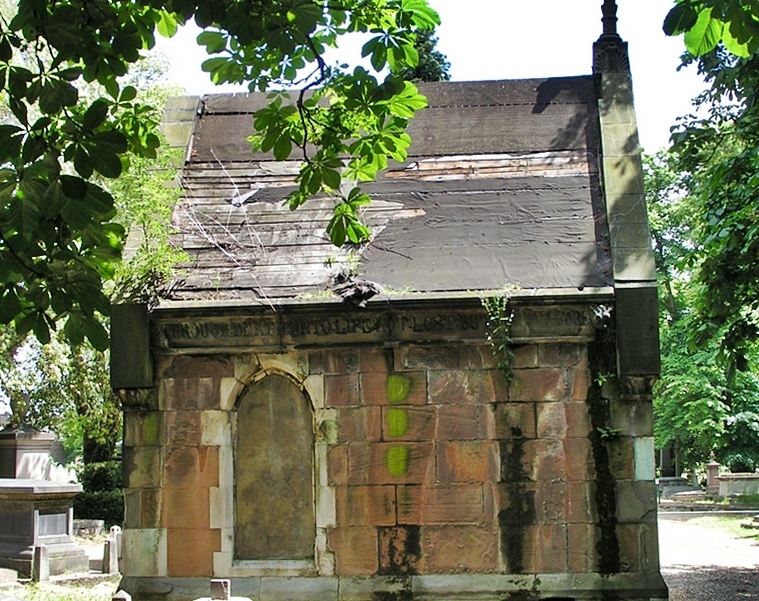 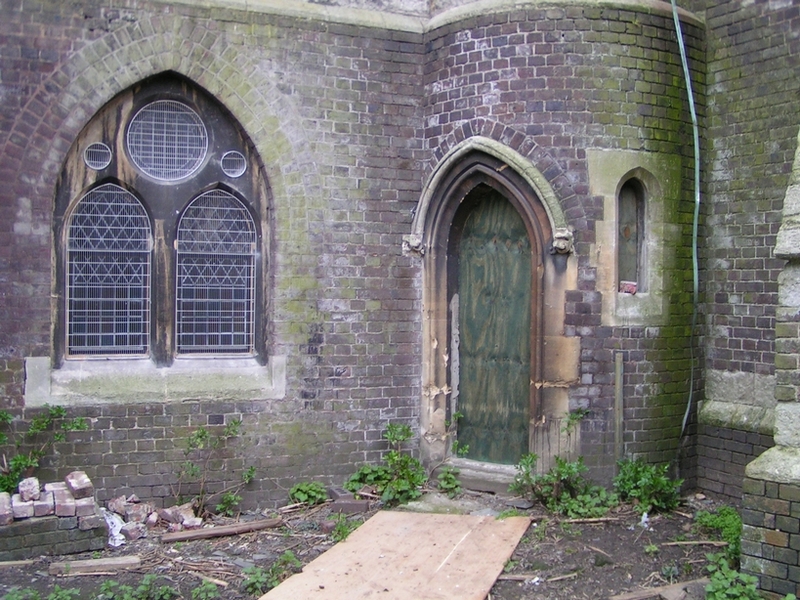 The doors of the fine Renaissance style Rothschild Mausoleum, designed by Matthew Digby Wyatt in 1866, were broken. 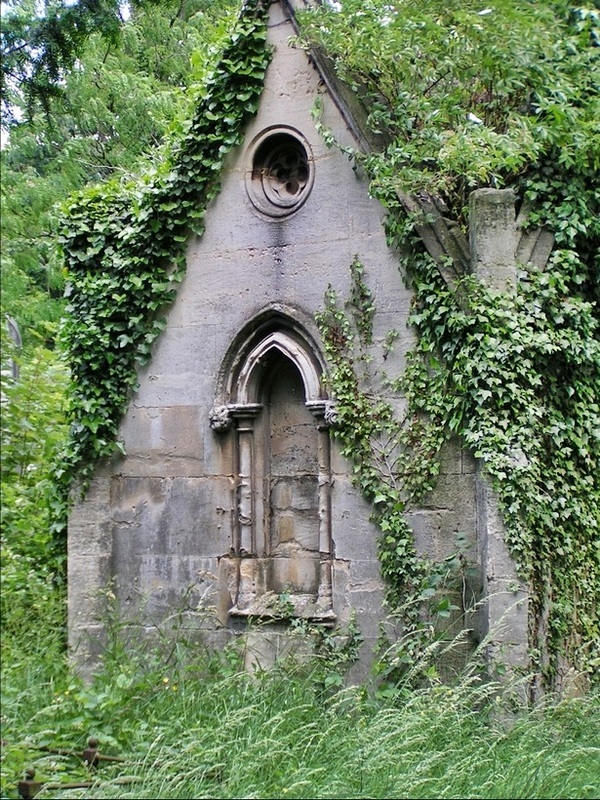 The mausoleum was commissioned by Ferdinand de Rothschild (1839-1898) of Waddesdon in memory of his young wife Evelina (1839-1866) who died in childbirth aged 27. 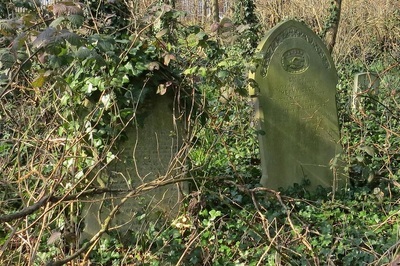 Both are buried within it. 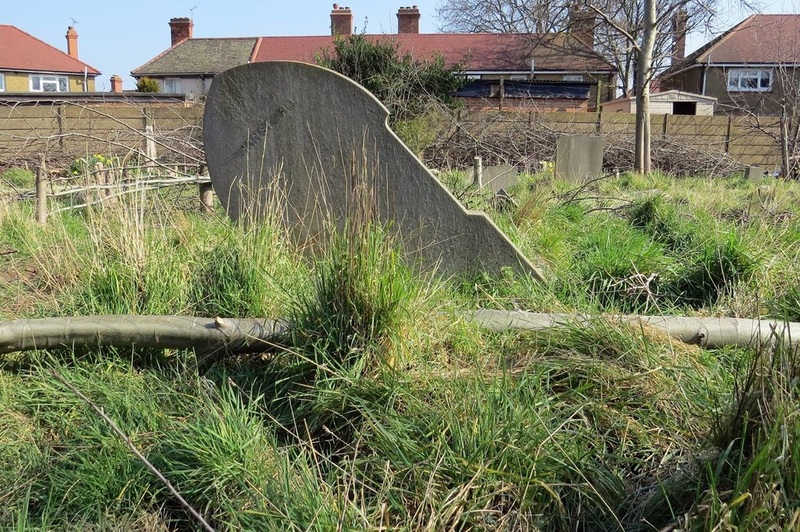 ​This cemetery was formed in 1855 and was nearly full when John Eustace Anderson was writing his local history in 1900 when he anticipated the need for a new cemetery. 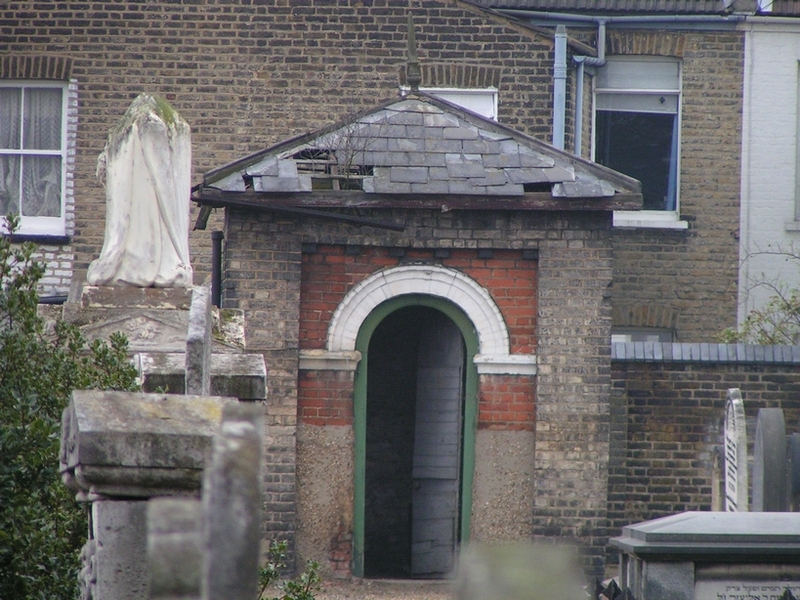 Anderson records that there was a mortuary chapel as well as the cemetery. 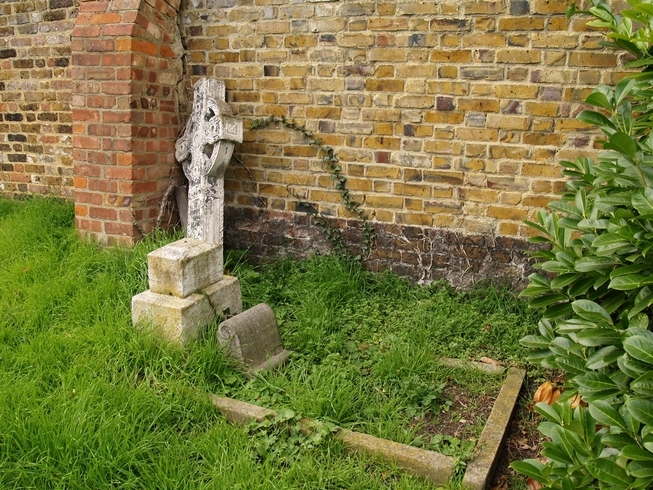 There is no more - the chapel was demolished, along with the boundary railings, soon after the cemetery officially closed in the 1950's. 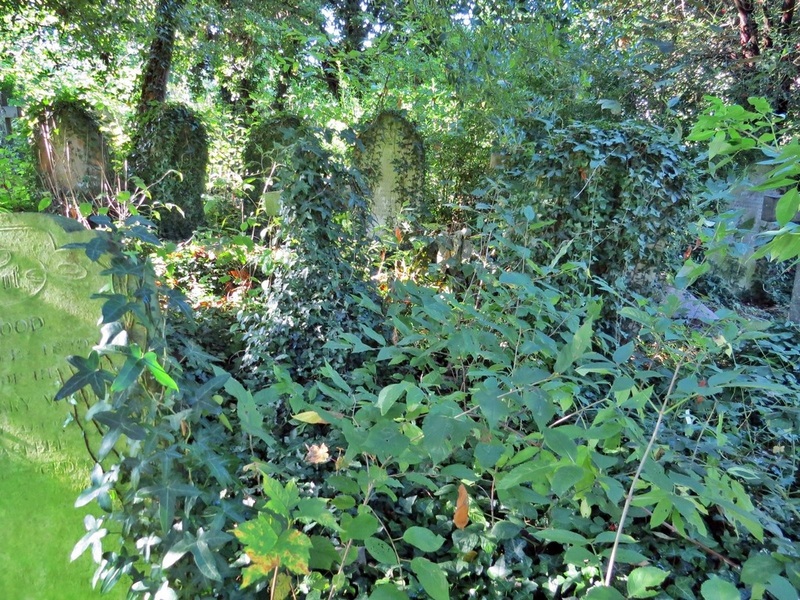 This really is one of London's forgotten cemeteries and people walking along one of the footpaths in these woods might be forgiven for not appreciating that this was once a cemetery at all. 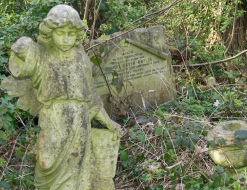 There are several ghostly tales associated with this place including a hovering nun who floats above a grave plus "Spring Heal Jack" a devilish imp with pointed ears and piercing eyes carried out a number of attacks on people as they crossed common at night during Victorian times. Mike Dixon writes to Derelict London: "Whilst looking for detail on Old Barnes Cemetery, I came across your excellent site. 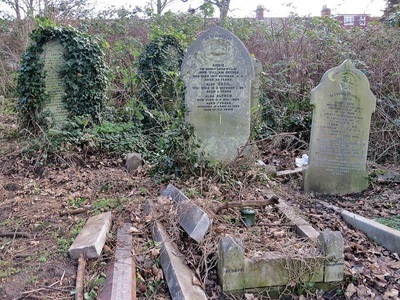 You may like to know that there are six war graves there, which are maintained, on behalf of the War Graves Commission, by the Friends of Barnes Common. 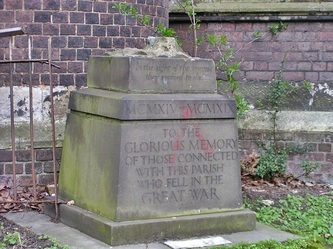 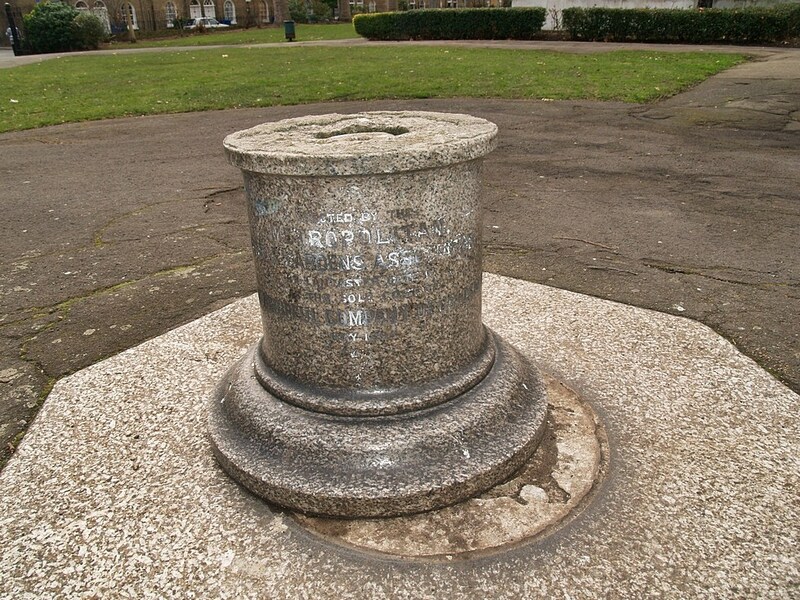 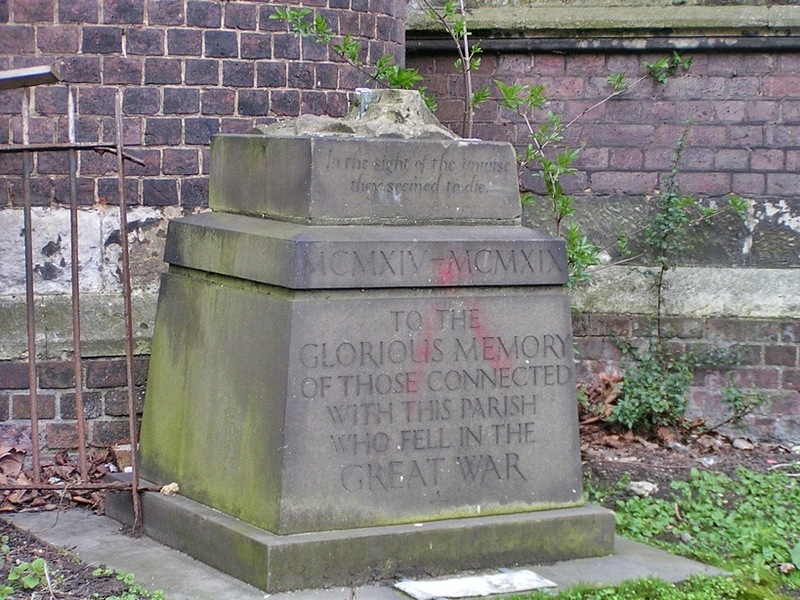 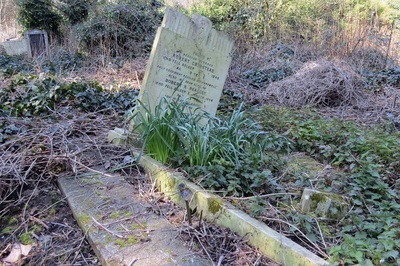 It is also the final resting place of Ebenezer Cobb Morley, recently celebrated by the Football Association as the creator of the first official rules of football". Apparently an ancient paupers & prostitutes' graveyard unearthed during work on the Jubilee Line extension.Now used as a builders yard. 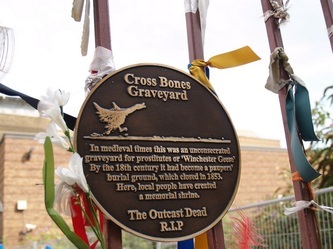 The site was a burial ground for hundreds of years, Roman remains and artefacts were also discovered by the Museum of London & its rumoured that plague victims were buried there. 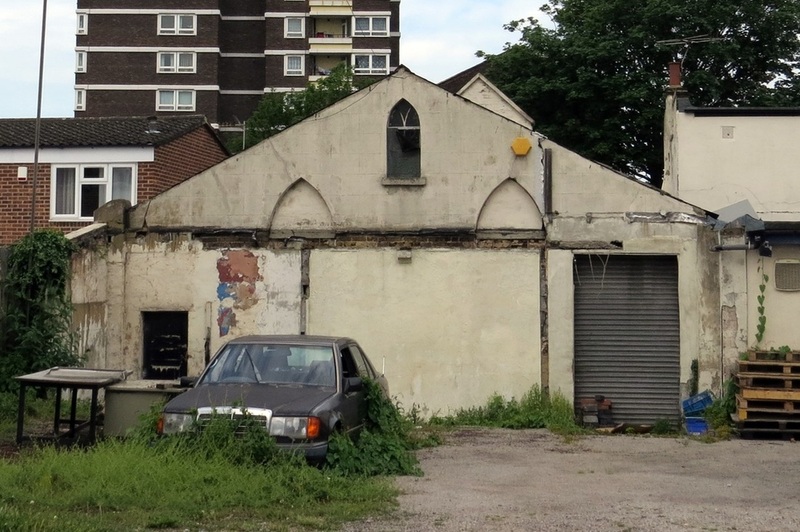 London transport who own the site want to build offices there, but Southwark council have refused planning permission. 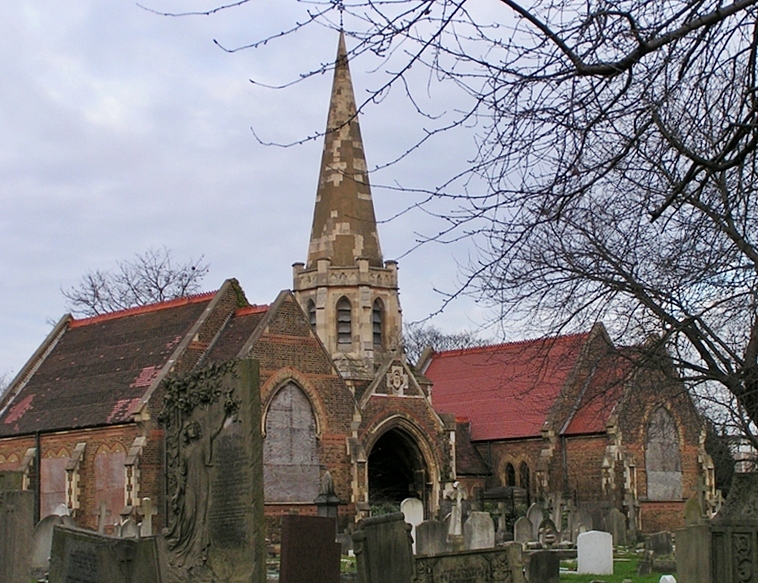 This, the 'Cemetery of all Saints', was the second (after Highgate) to be planned by the London Cemetery Company. 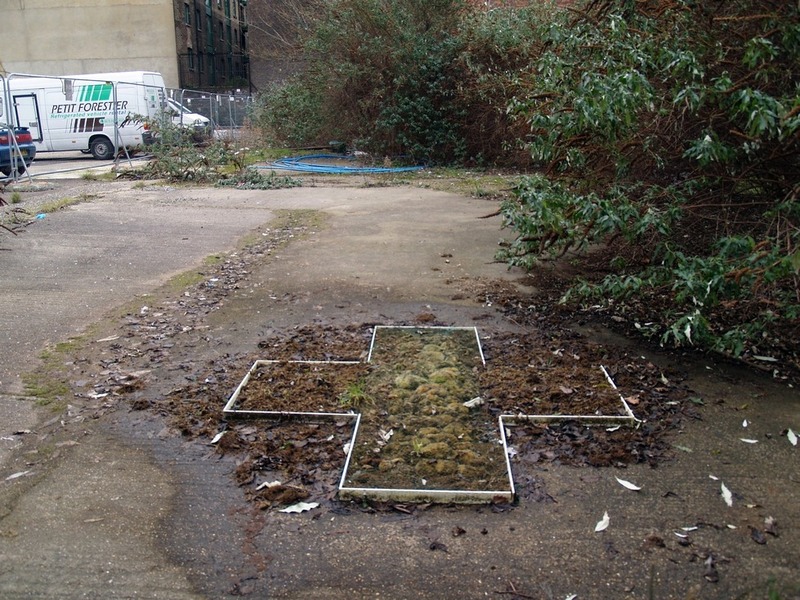 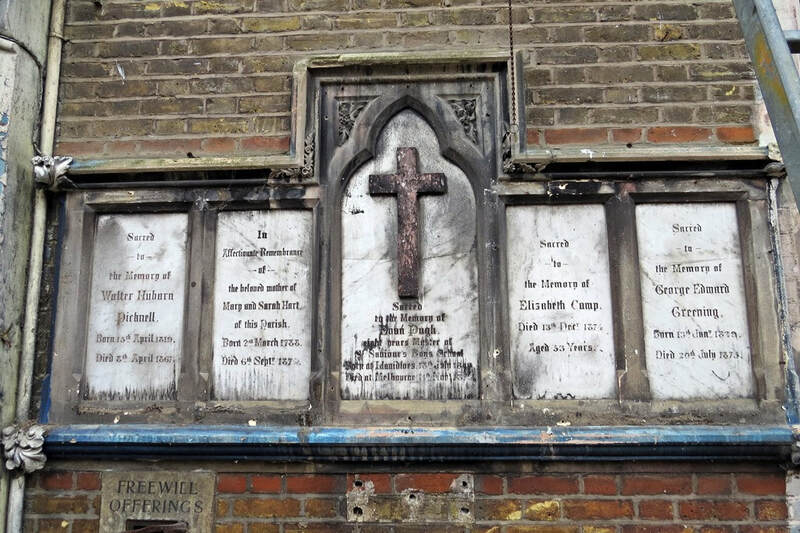 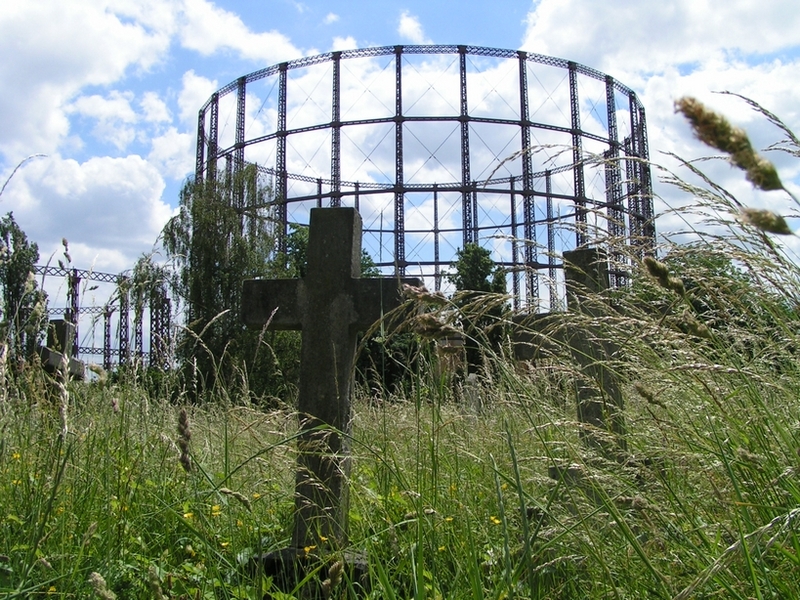 The 52-acre site was opened for burials in 1840. much used by the better off folk in South London.Also buried at Nunhead are heroes who fought at the battles of Trafalgar and Waterloo, and later a gallant airman who lost his life chasing an enemy Zepplin across London's skies. 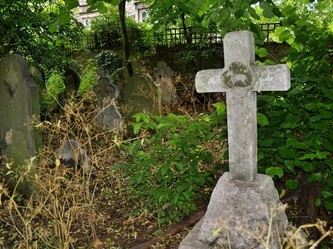 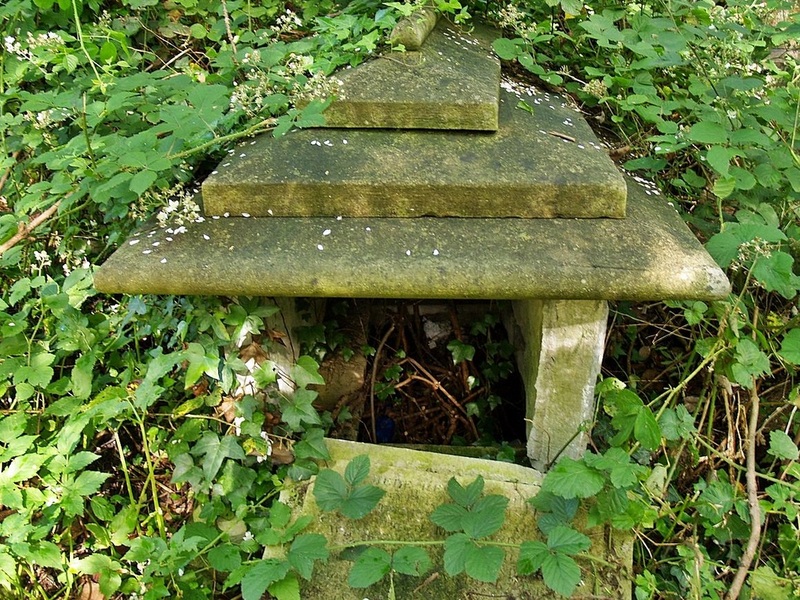 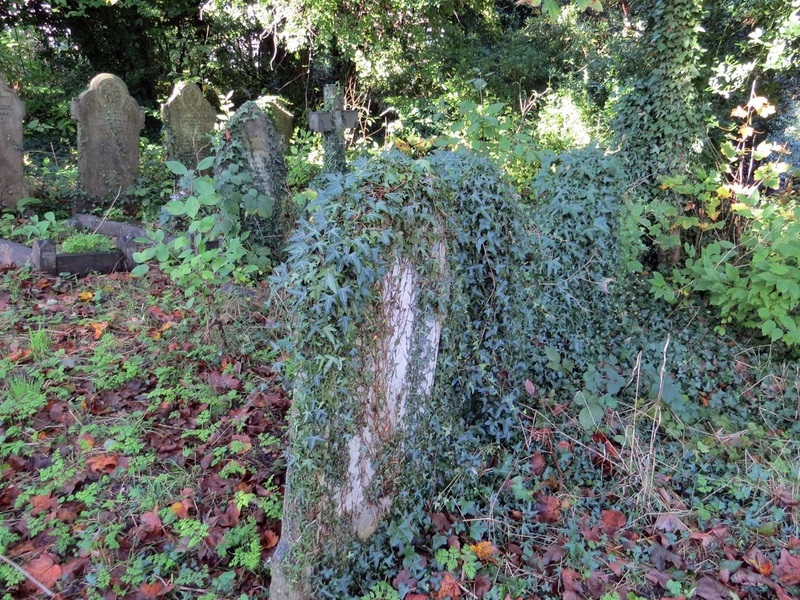 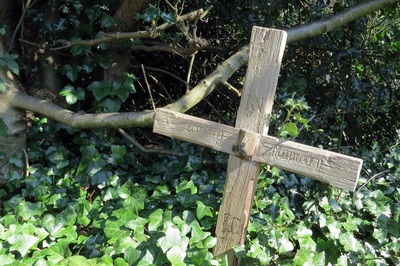 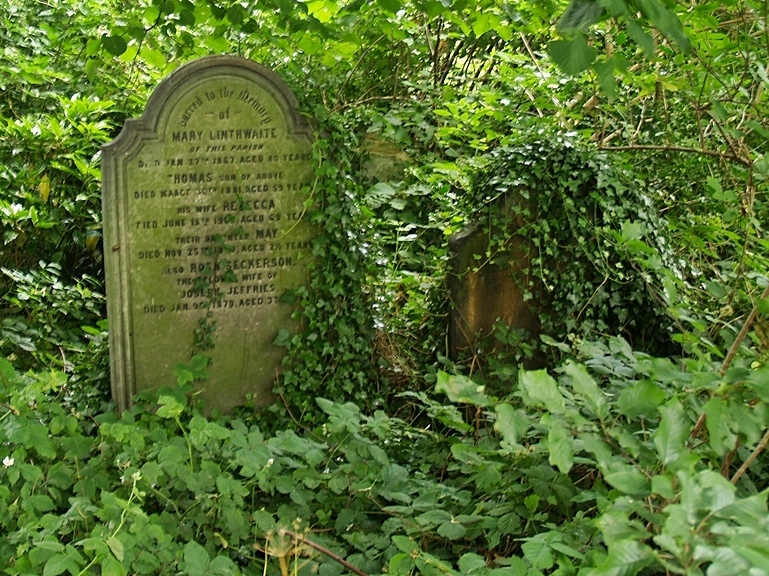 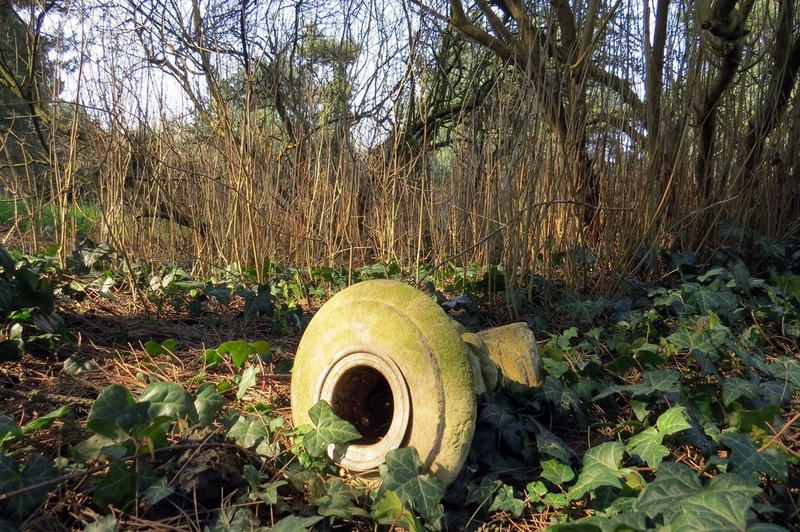 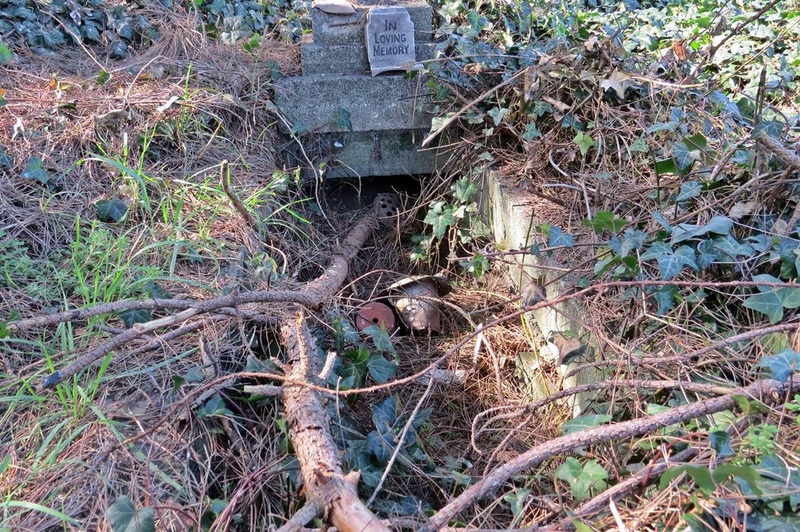 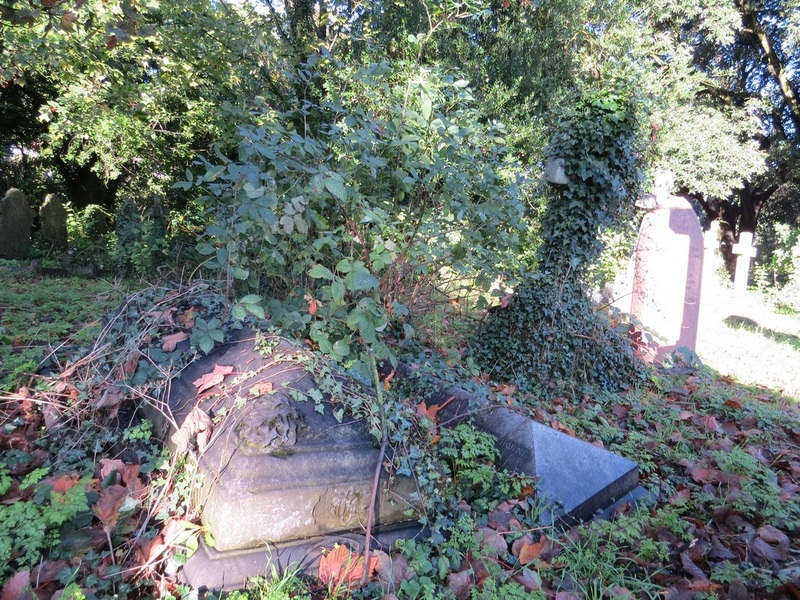 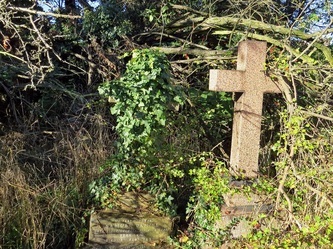 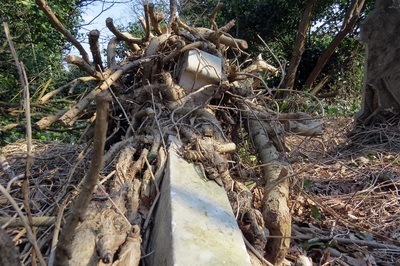 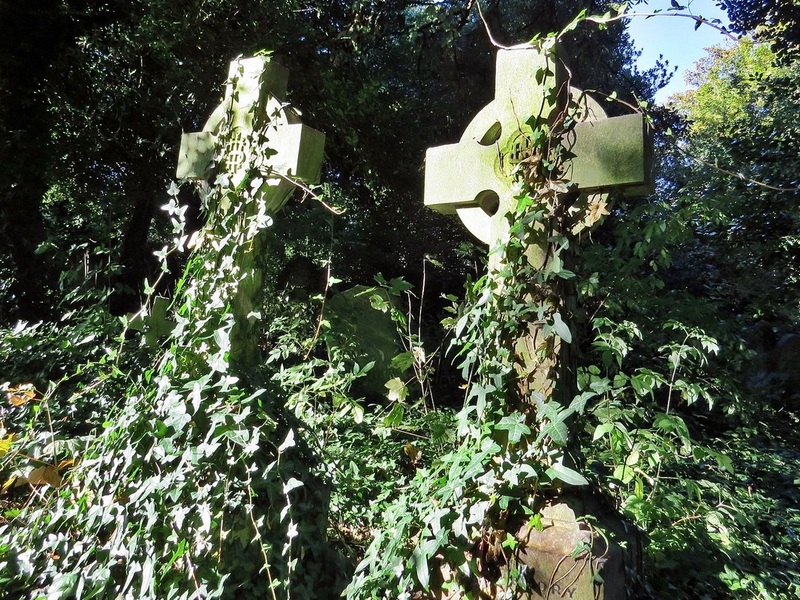 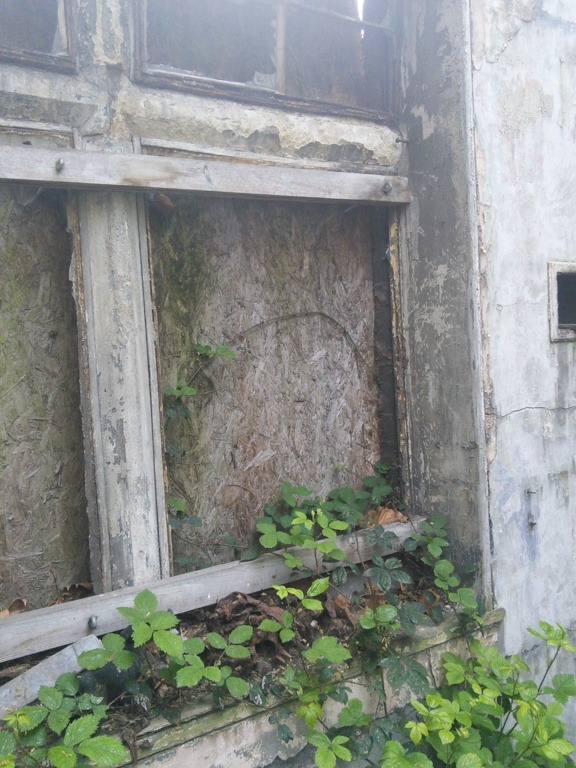 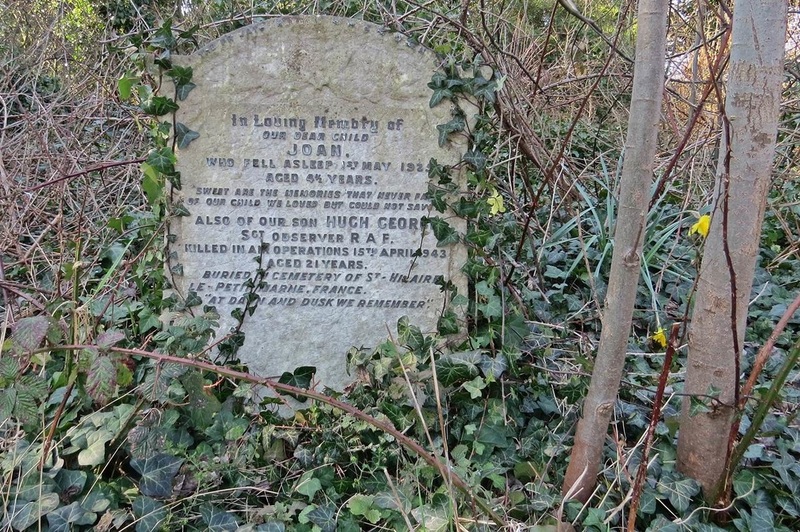 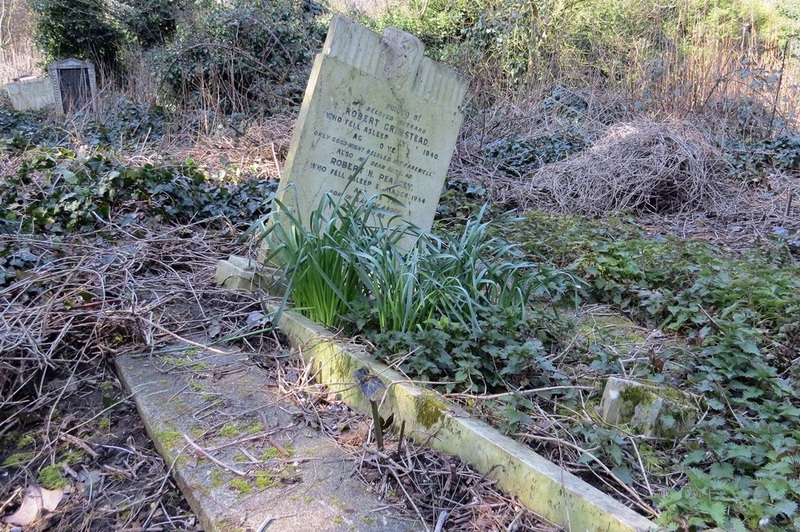 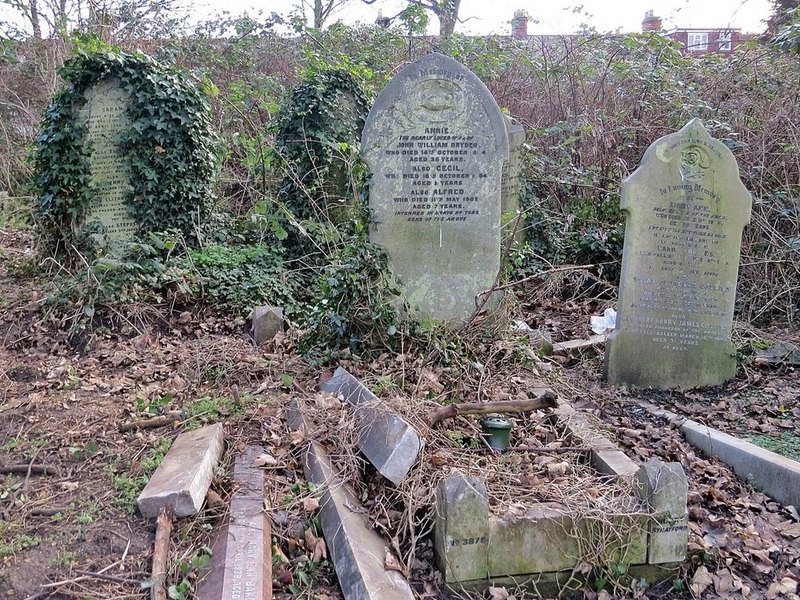 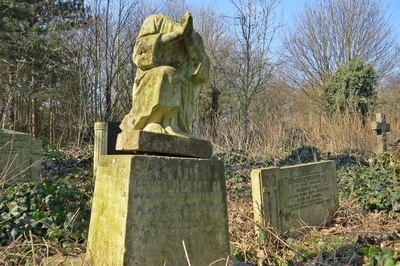 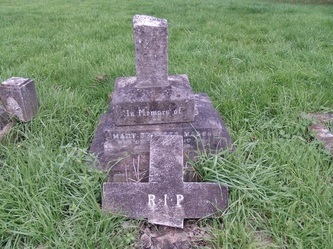 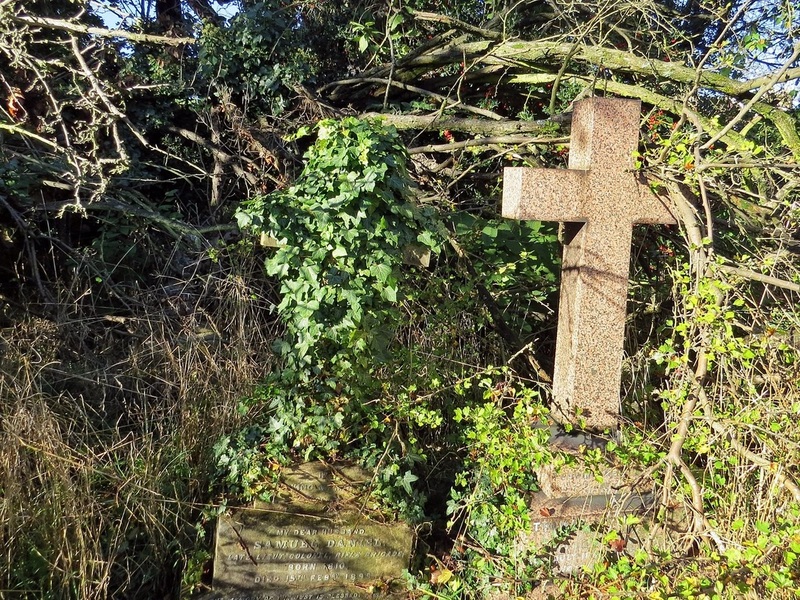 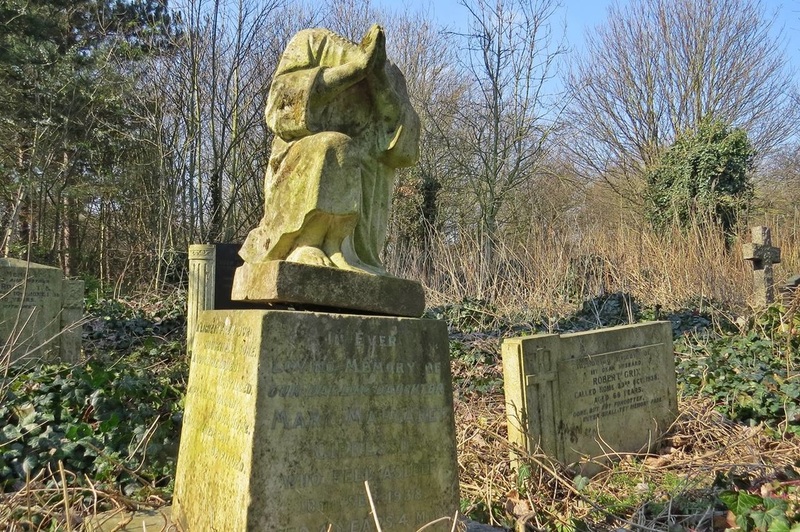 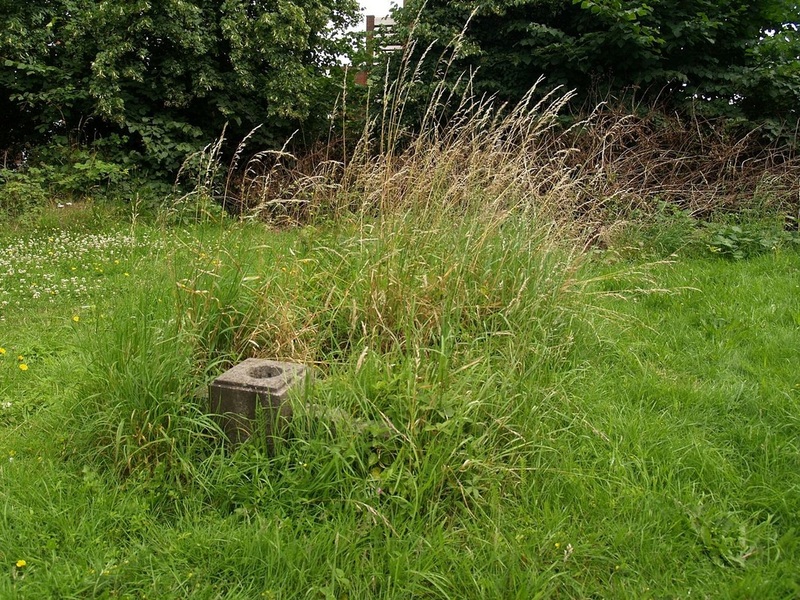 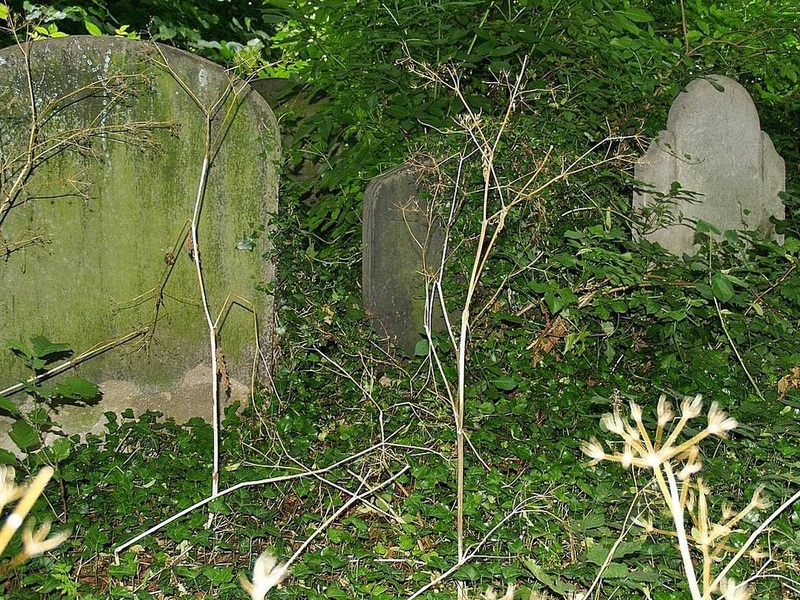 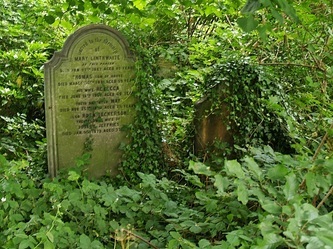 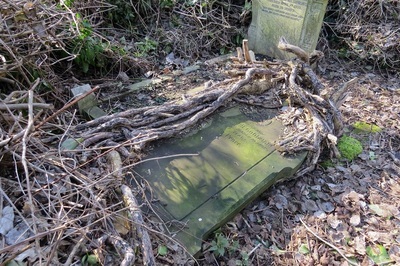 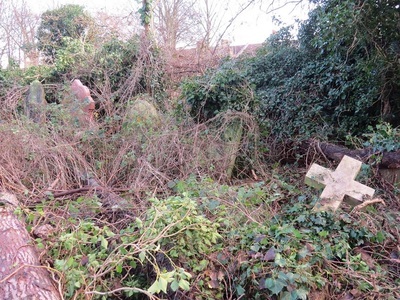 It became extremely overgrown and neglected - it was a jungle in there the first time in 2003 but the Friends of Nunhead Cemetery have been cleaning it up and trying to transcribe as many of the memorials as possible and making the cemetery more usable for the public to walk. 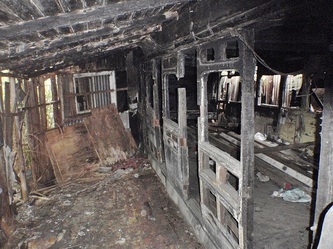 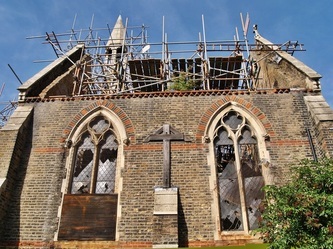 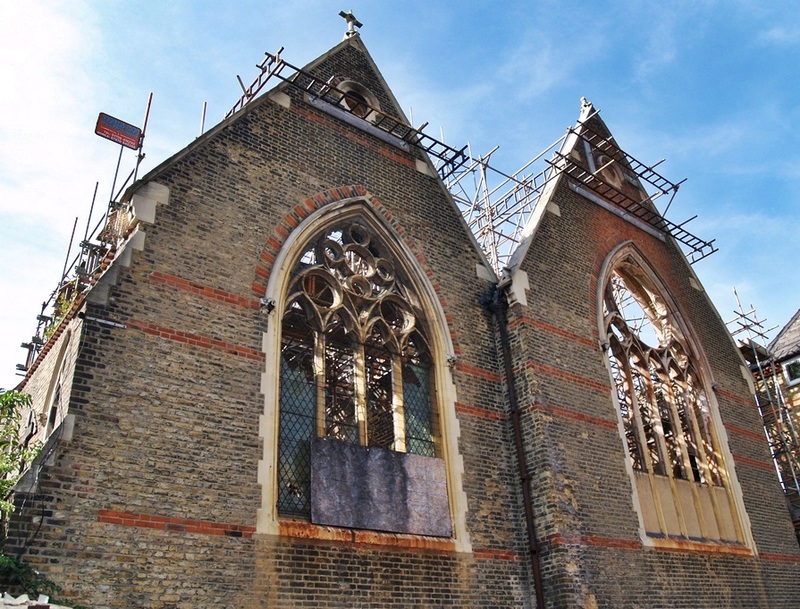 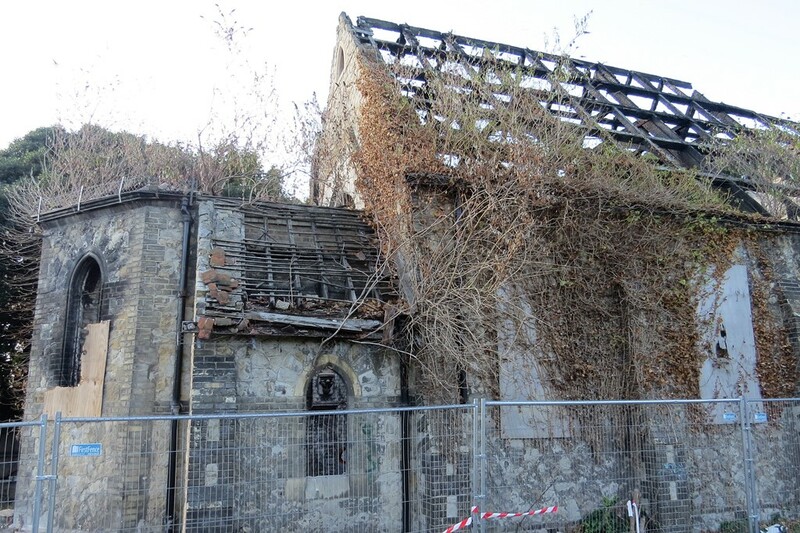 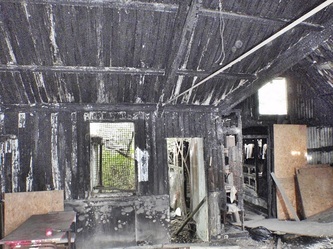 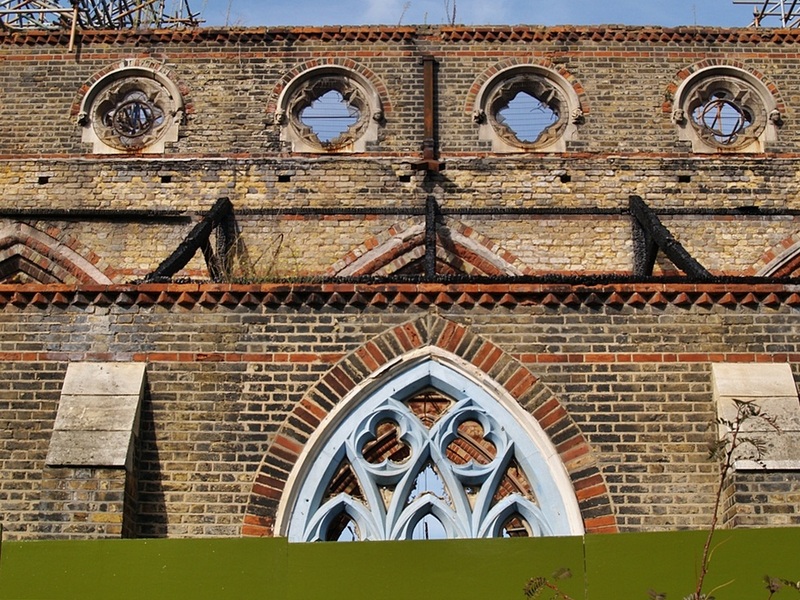 In the late 1970s the Anglican chapel, which dates from 1844, fell victim to an arson attack, and the interior and roof were completely destroyed. 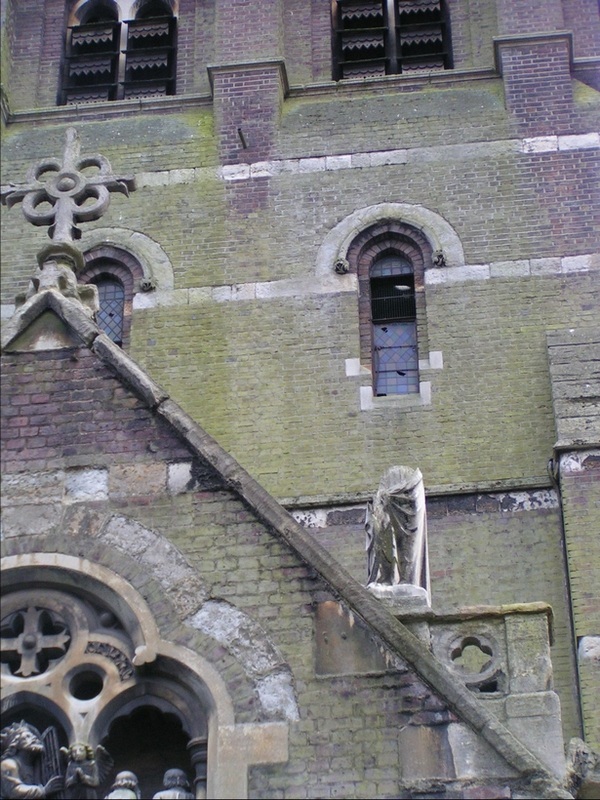 These photographs were taken in 2004 when the church had been derelict for around 25 years but the restoration of St Stephen's Church is now complete. 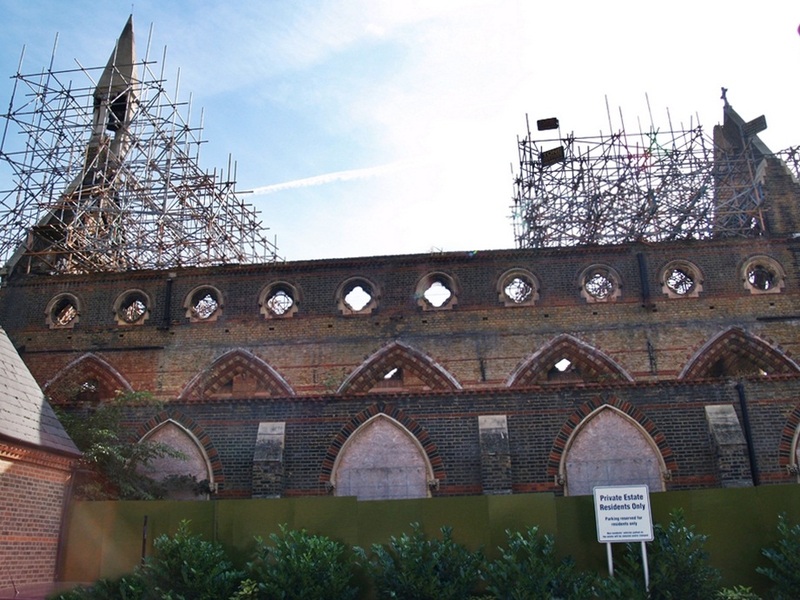 The total cost of all the work is was around £4 million... 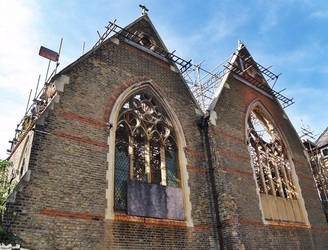 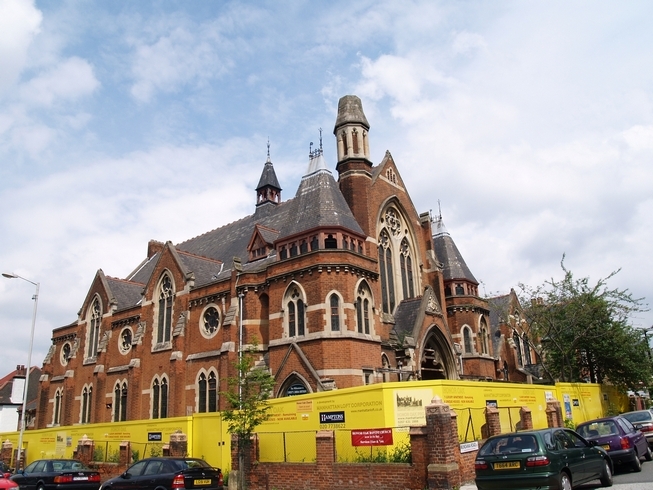 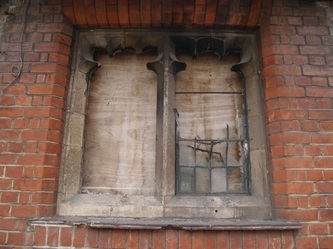 The main aim of the building work was to restore St. Stephens as closely as possible to its' pre-war condition, including all of its stained glass windows and railings. 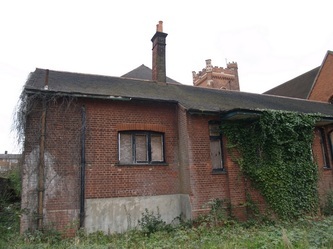 It was saved from demolition to provide a carpark for the hospital or being split into flats by being made a Grade 1 listed building in the late 1970s. 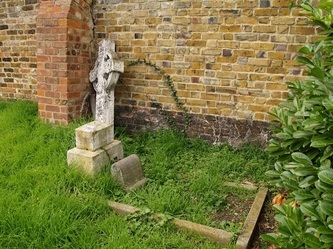 However, it went into slow decay, with squatters, whilst discussions for a new used for it dragged on.Tom The Tramp, was a well-known character who slept in the churchyard during the 1980s and 1990s. 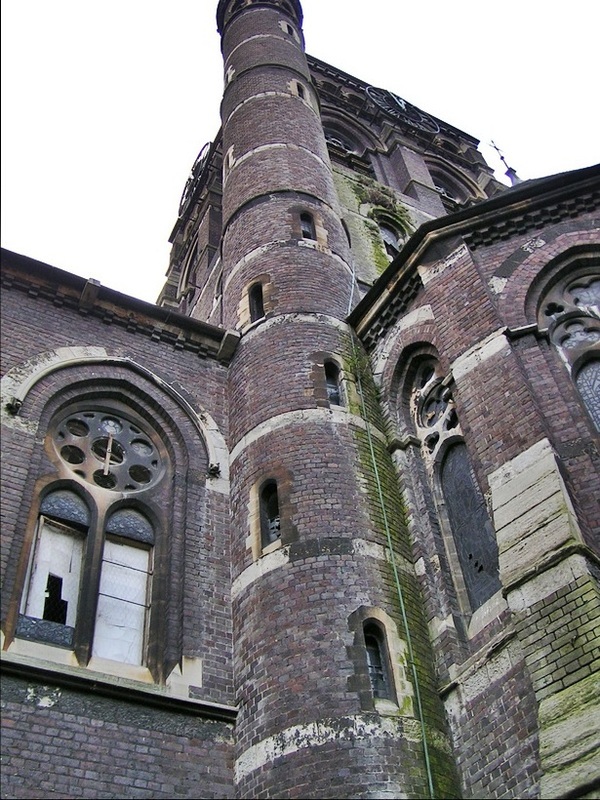 A lease on it was awarded to the St Stephen's Restoration and Preservation Trust in 1999 who restored the building. The main church has been stripped of its fittings and is now used as a community space and hall. 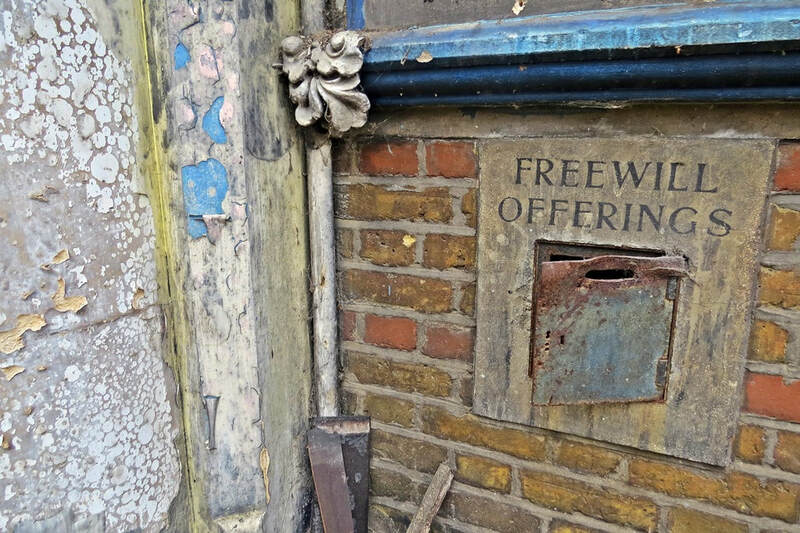 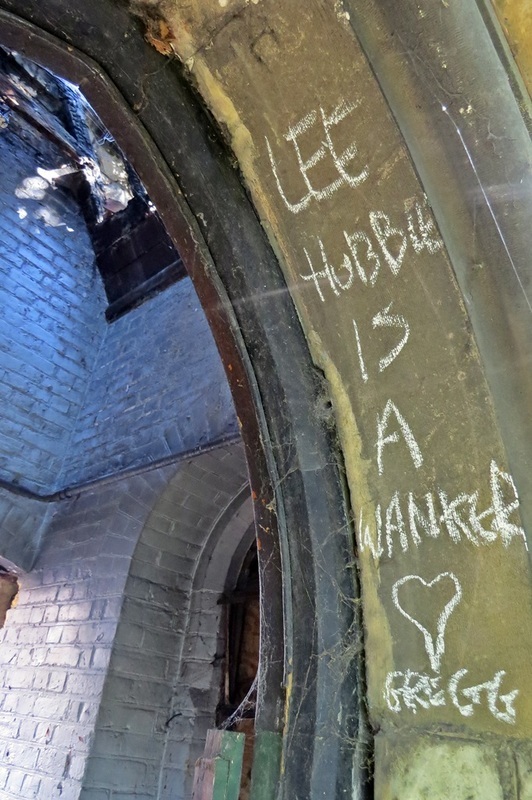 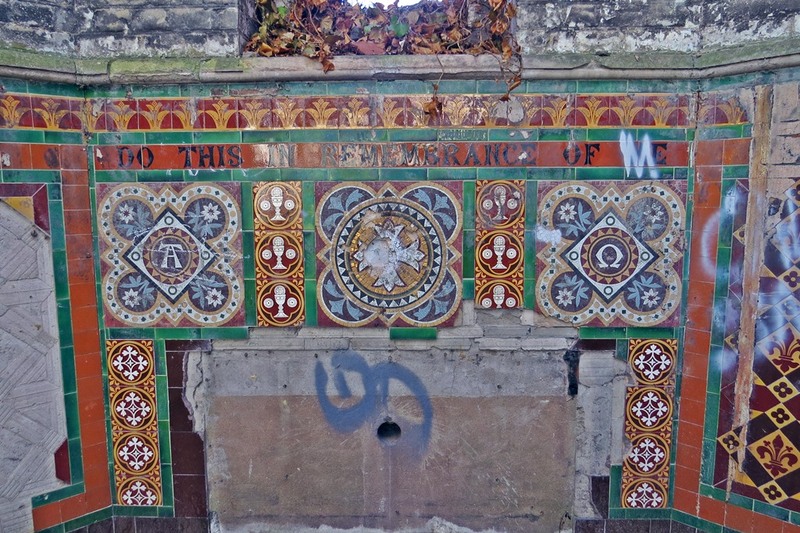 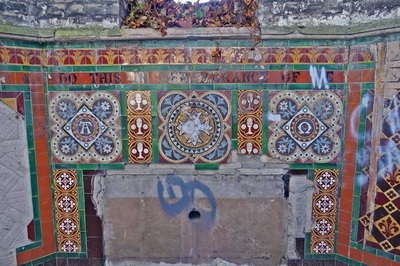 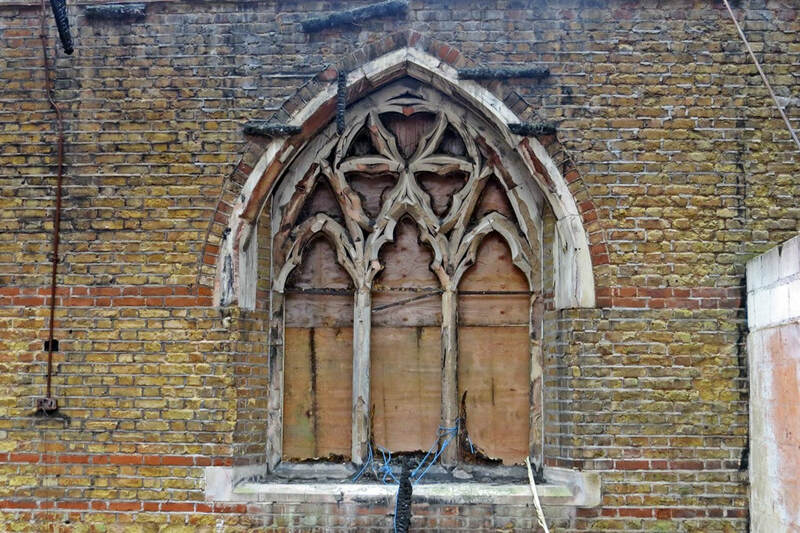 Doreen MacAninch writes to Derelict London: "As a child I worshipped at St Stephen's Church. 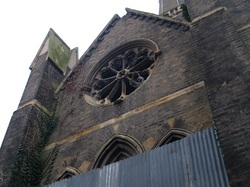 I was rather dismayed at the sad state of the old church. I remembered it was a busy church with the usual church activities. Church bazaars, Girl Guides & Brownies,Mother's Union, Sunday School etc. 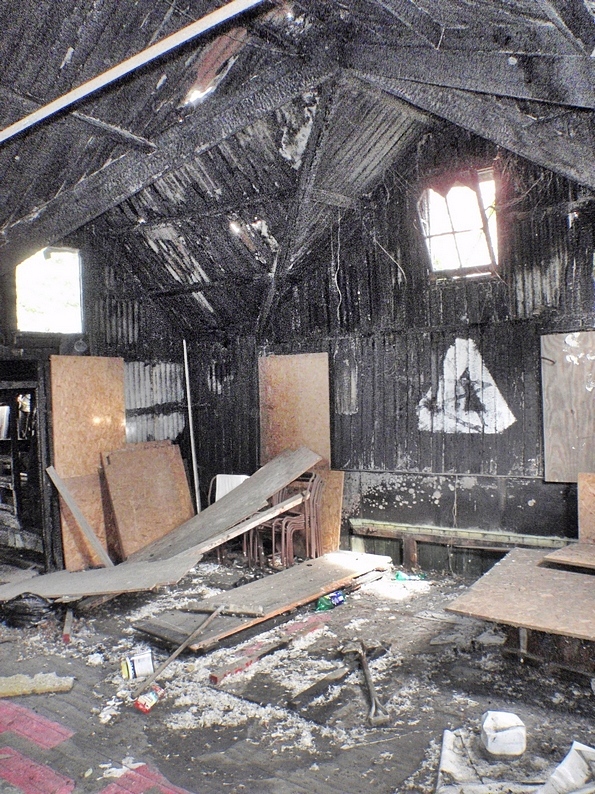 I used to attend Brownies and later Girl Guides so I spent a lot of hours in the church hall. 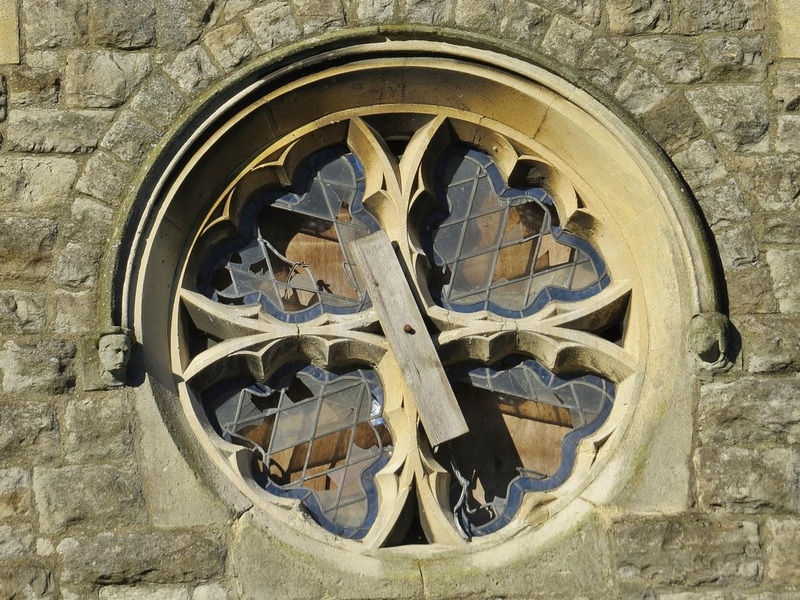 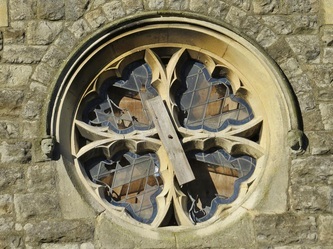 I remember the stain glass windows .Were they removed and placed somewhere else? The Vicar at the time lived near by with his family in a house that went with the Chuch. 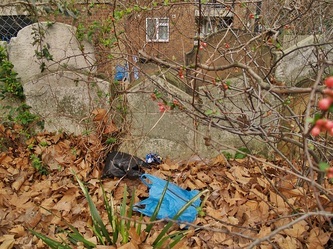 The gardens were always kept neat & tidy. 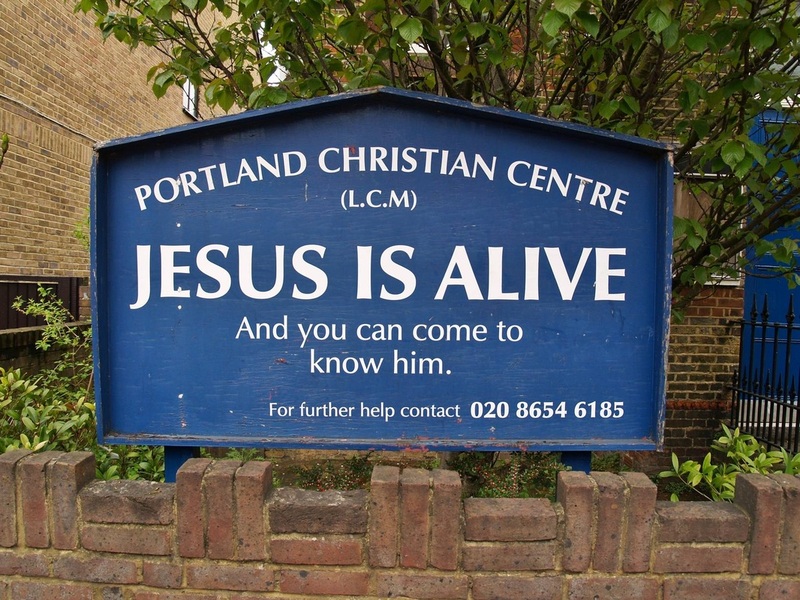 I am now 57 yrs old and have lived in Australia for 29yrs." 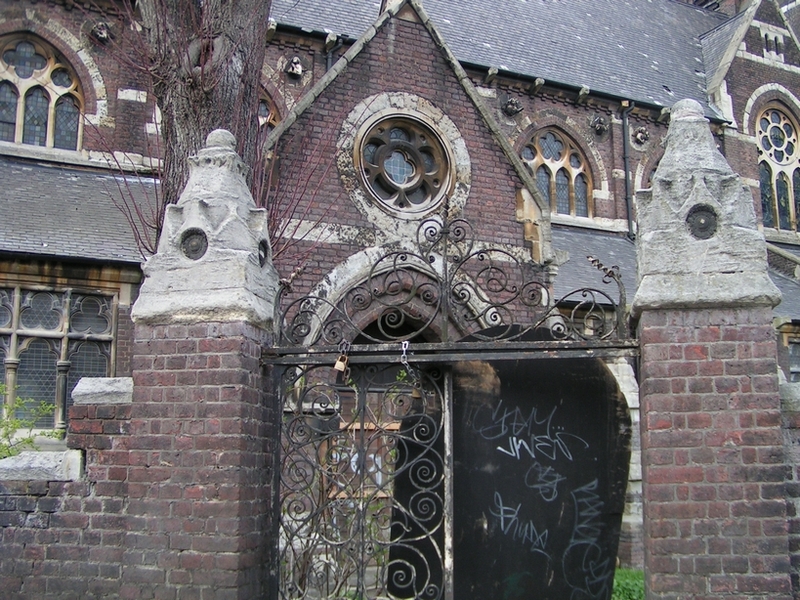 Sue Bates writes to Derelict London: "My great-aunt Ethel Jones married Henry A.Shepherd here on May16th 1928. 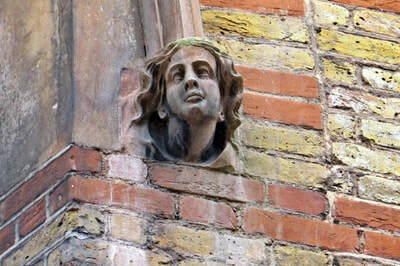 She was a hotel receptionist & lived on Constantine Rd. 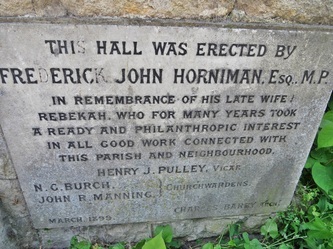 (poss.lived in hotel?) 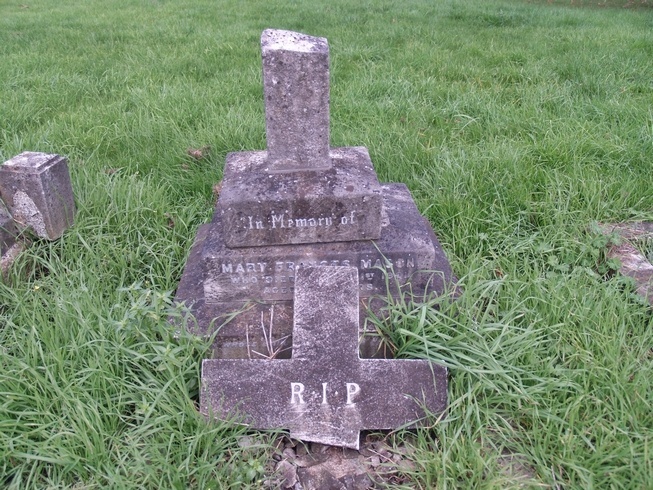 She was 27,he was 60 (His 2nd marriage; widower) He died 1942; She committed suicide 1945. 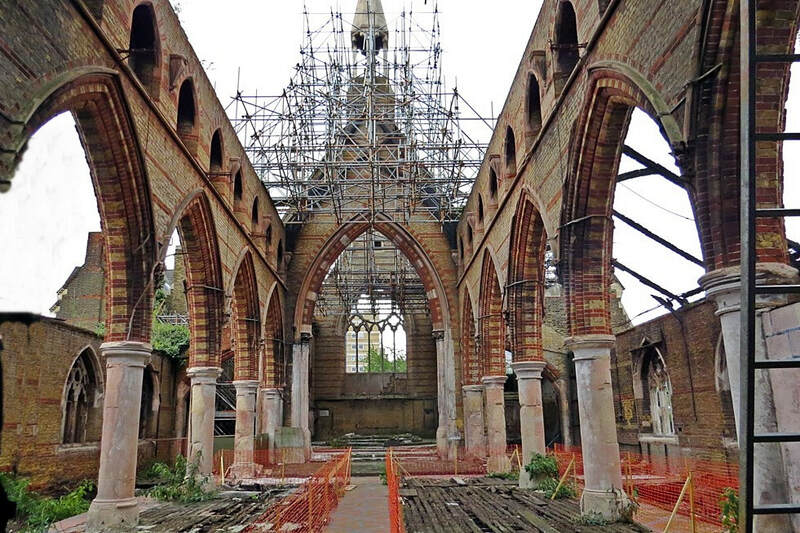 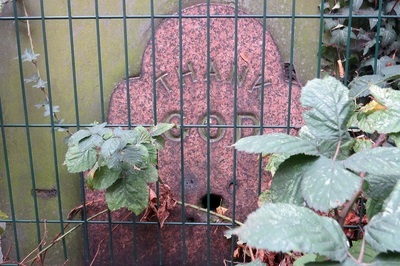 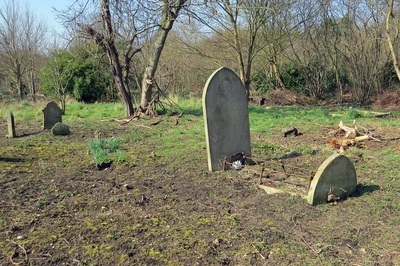 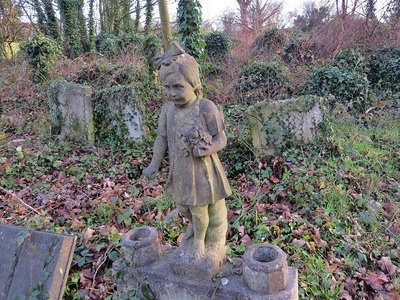 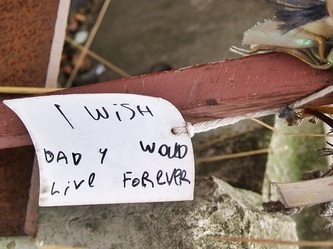 Such sad photos but heartening to note its restoration"
Tower Hamlets Cemetery (known locally as Bow Cemetery) consists of 29 acres & is the largest area of woodland in east London. The cemetery was one of the first seven to emerge in London in the 1830s, opening as the City of London and Tower Hamlets Cemetery in 1841. 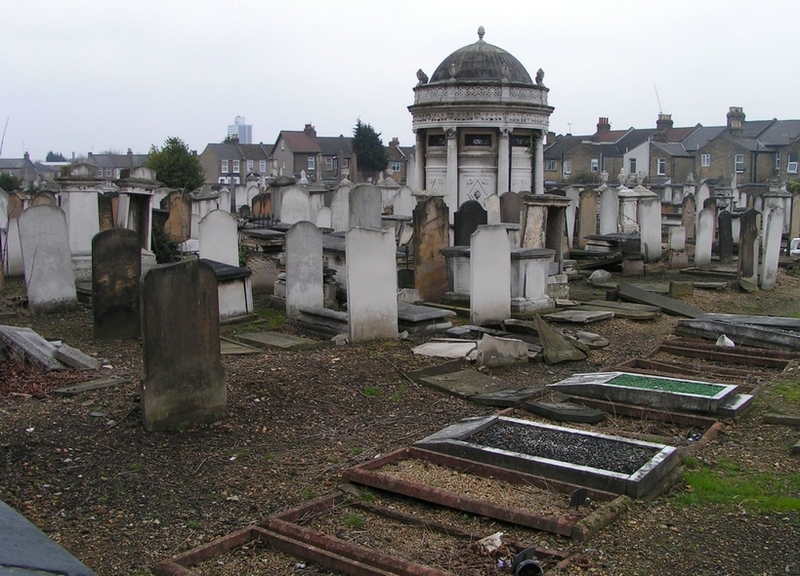 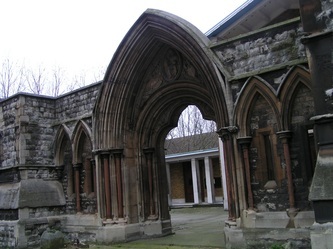 It closed for burials in 1963 and eventually passed into the ownership of the London Borough of Tower Hamlets. 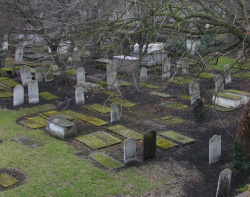 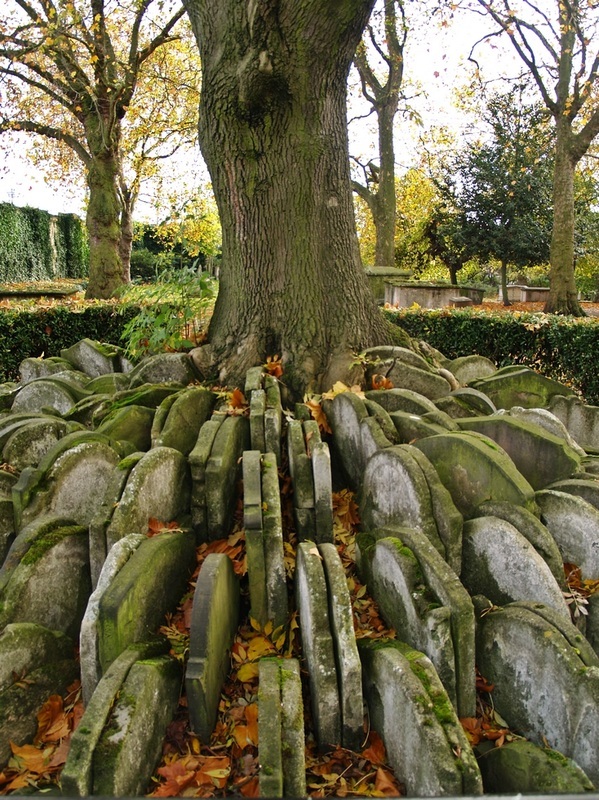 The Cemetery opened in 1841 by an Act of Parliament and is one of London's Magnificent Seven Cemeteries. 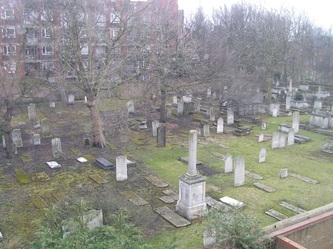 The Cemetery closed to burials in 1966. 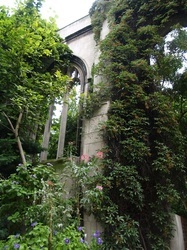 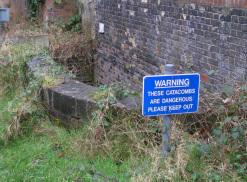 It became Tower Hamlets first Local Nature Reserve in 2001. 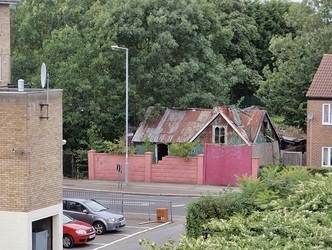 Near-by land was added in the mid-nineties, known as "Scrapyard Meadow" and Ackroyd Drive Green Link. 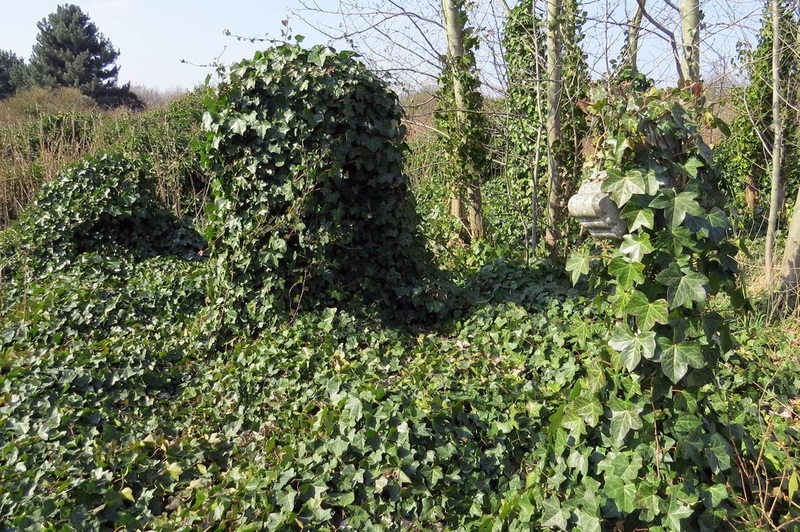 Today it is "managed" mature, broadleaved woodland and meadow. 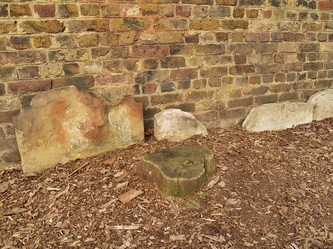 It is also a educational resource to 7000+ school children every academic year who use the Park as an outdoor classroom. 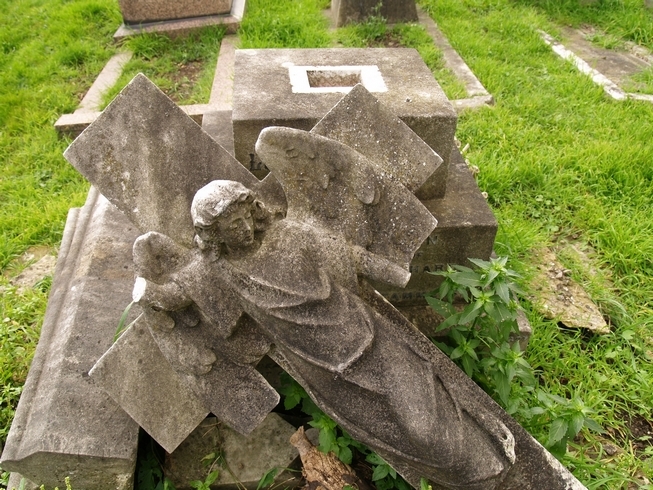 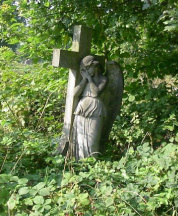 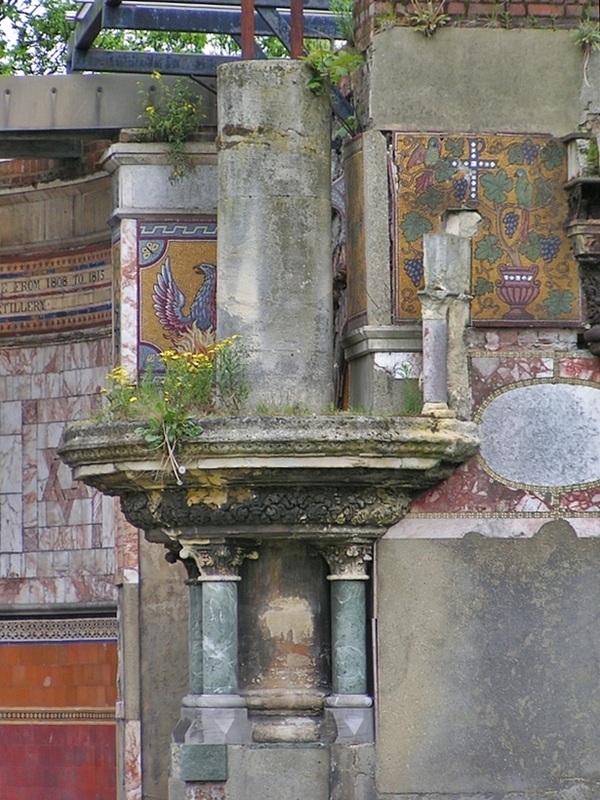 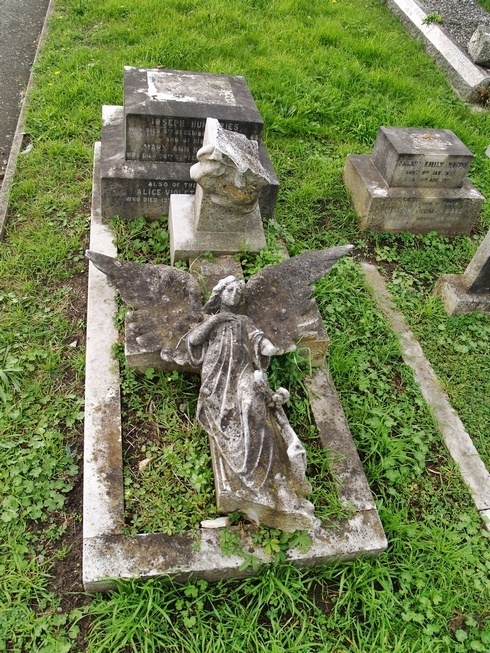 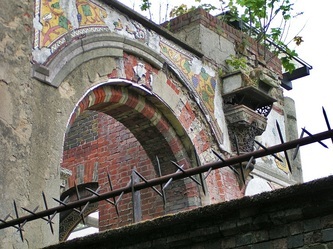 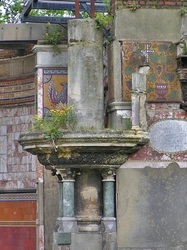 Kensal Green cemetery is London's oldest public burial ground and has an eclectic mix of architectural styles across its 79 acre site with quite a few overgrown areas. 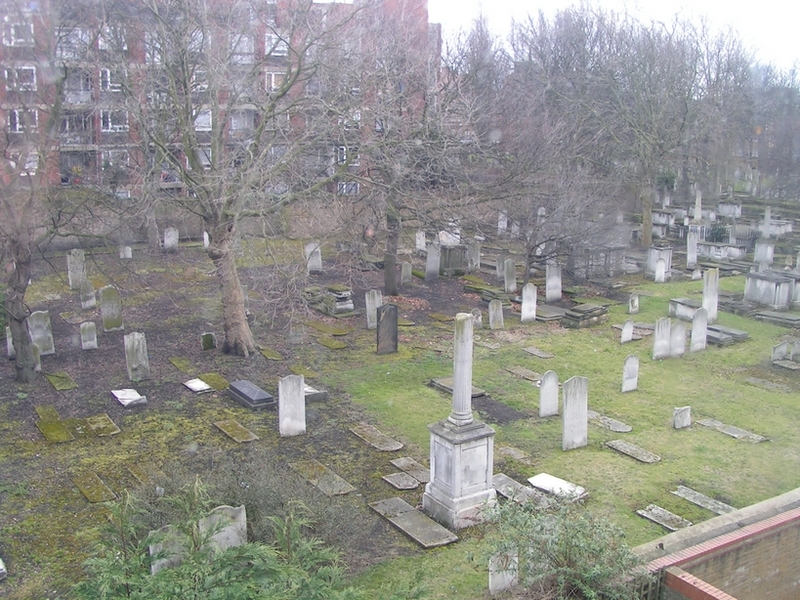 The cemetery was established by Act of Parliament which had its final reading in July 1832, during a cholera epidemic. 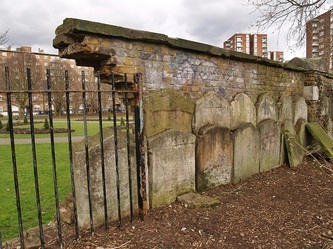 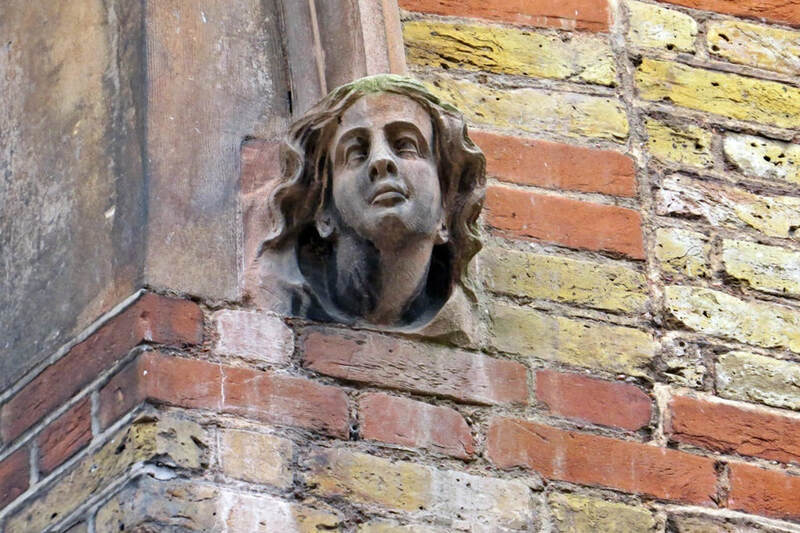 The famous buried in Kensal Green include writers Anthony Trollope and William Makepeace Thackeray; Oscar Wilde's mother; engineer Isambard Kingdom Brunel, Charles Babbage and Niagara Falls tightrope walker Blondin. 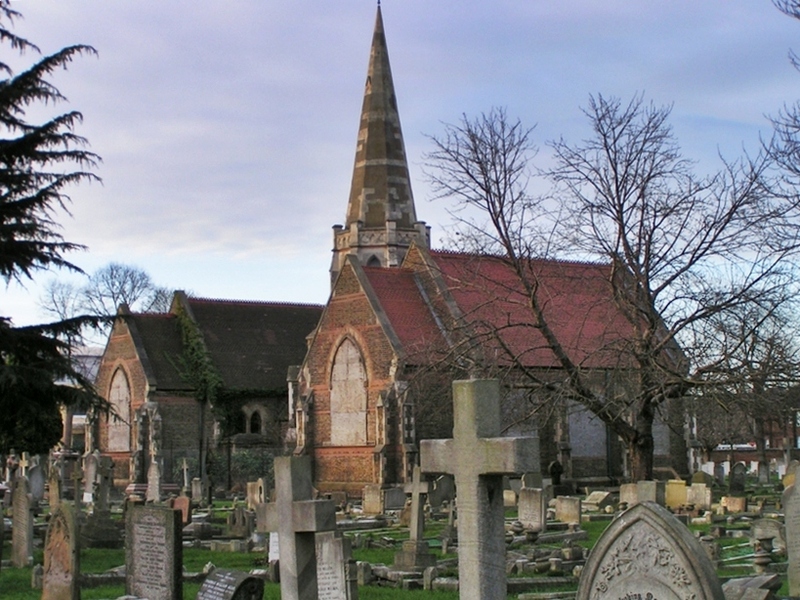 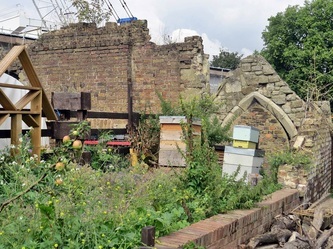 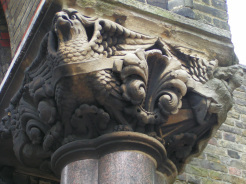 Kensal Green now serves as a conservation area harbouring flora and fauna rare elsewhere in Greater London.Eighty-five species of bird have been recorded within the cemetery and 33 species nest there. 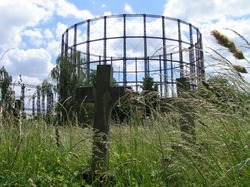 The east end of the cemetery is set aside as a butterfly and bee garden. 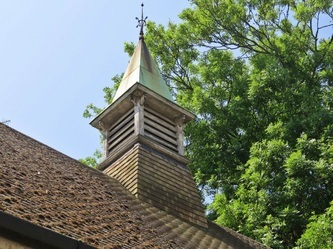 The mission halls, chapels and churches were built economically and quickly to service the needs of small groups of worshippers from about the 1870s onwards. 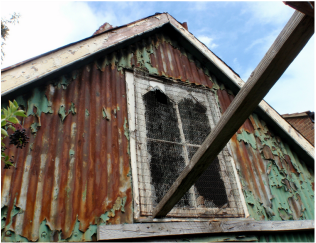 Often referred to as 'Tin Tabernacles' they were built as temporary accommodation and the vast majority of them have already disappeared. 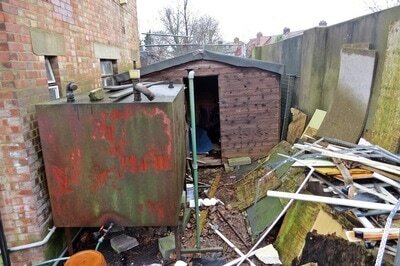 Many were built as prefabricated kits bought from builders merchants. 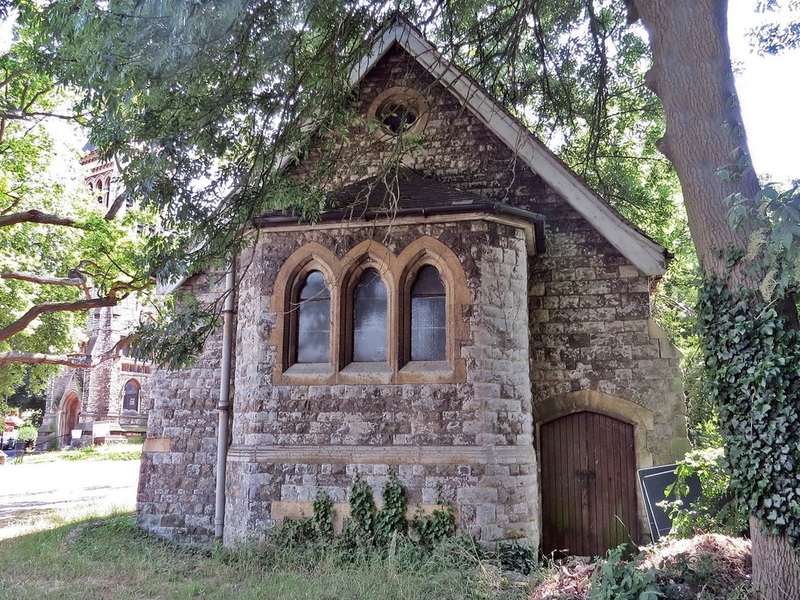 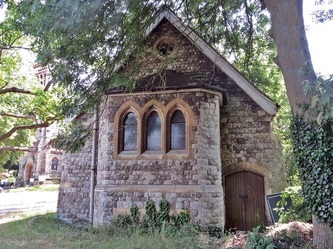 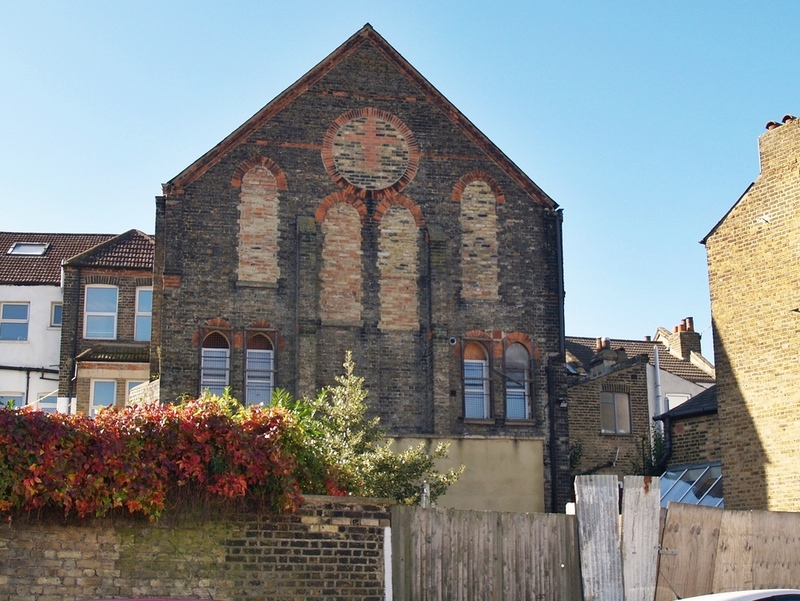 This Ponders End chapel was established in 1875. 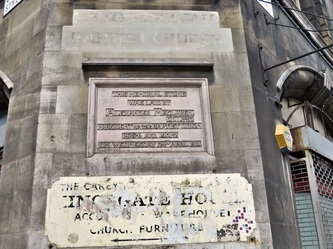 It had early links with the local Congregational Church (now URC) but for most of its existence was run entirely as an independent church and known locally as Archers Mission, after the family who were prominent in it. 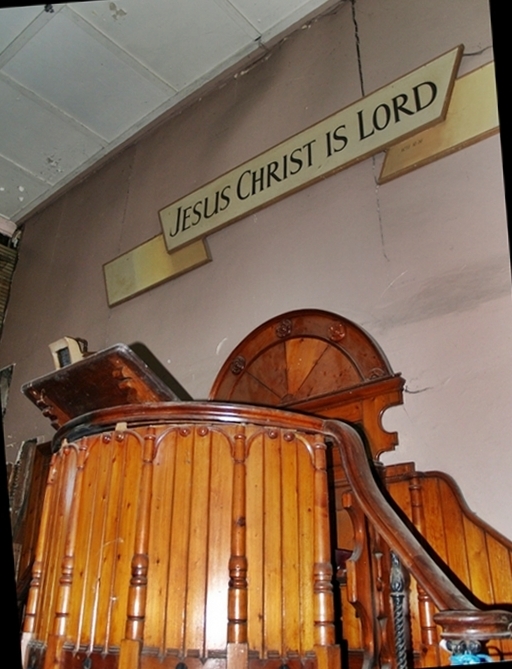 In the late 1980s the then Superintendent, Mr Bert Hope, handed the building over to the New Testament Church of Christ. 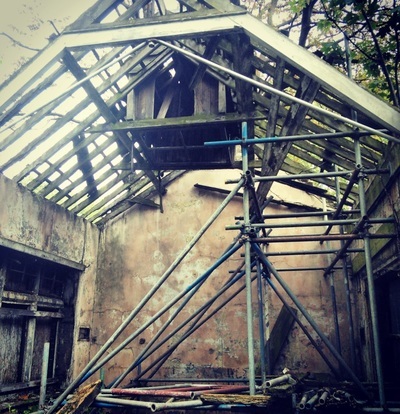 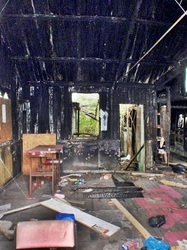 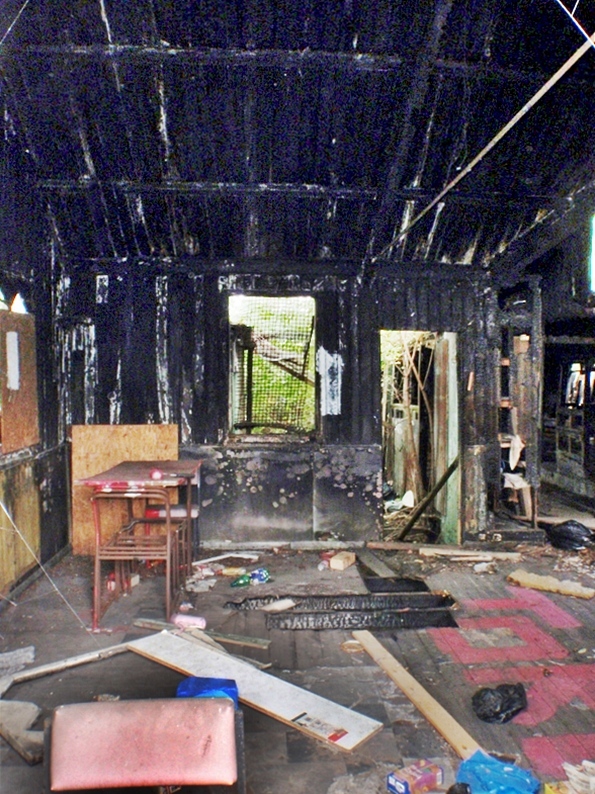 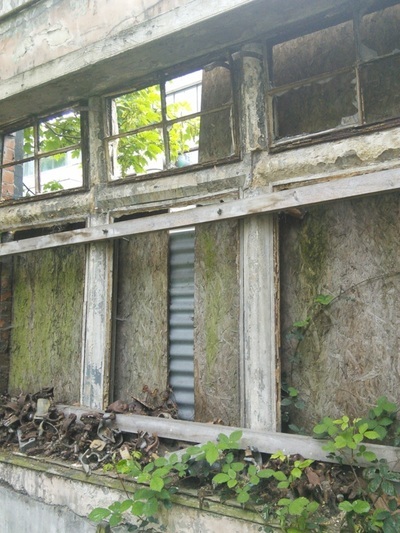 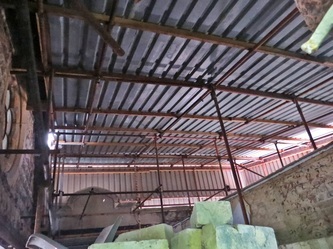 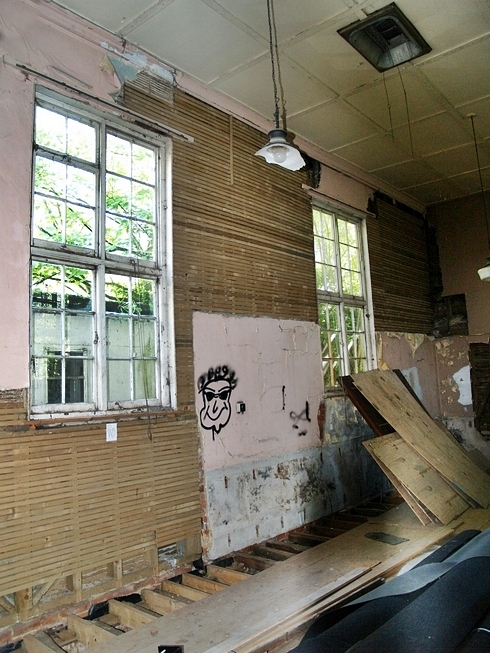 The building was burnt out in 1995 and has been demolished since these photographs were taken and as of 2015 the land remains vacant . 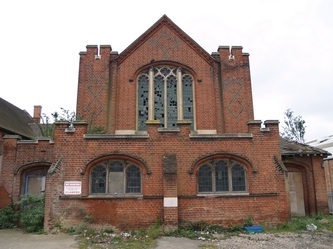 An email to Derelict London from the Ponders End Methodist Church confirms "It was never a Methodist Chapel. 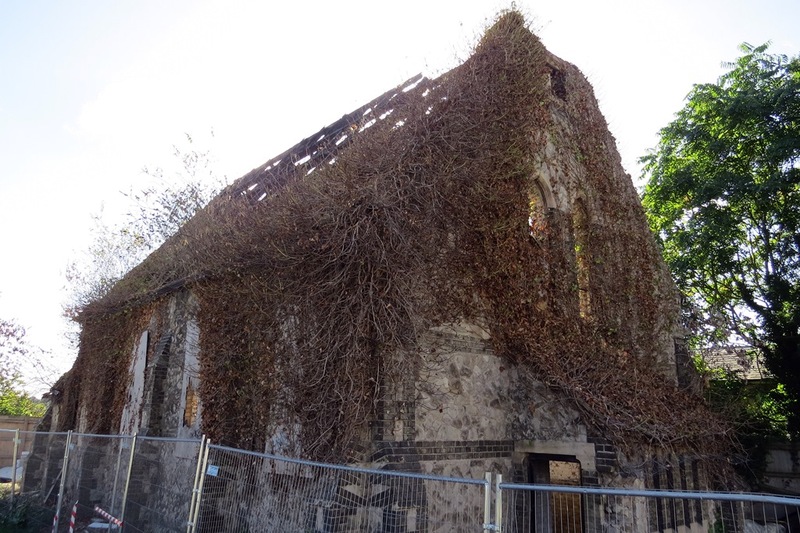 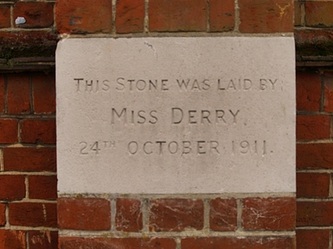 A number of local historians and the Victoria County History have been misled as incorrect facts and dates etc of the non-conformist chapels in the area have unfortunately been confused and repeated in other references". 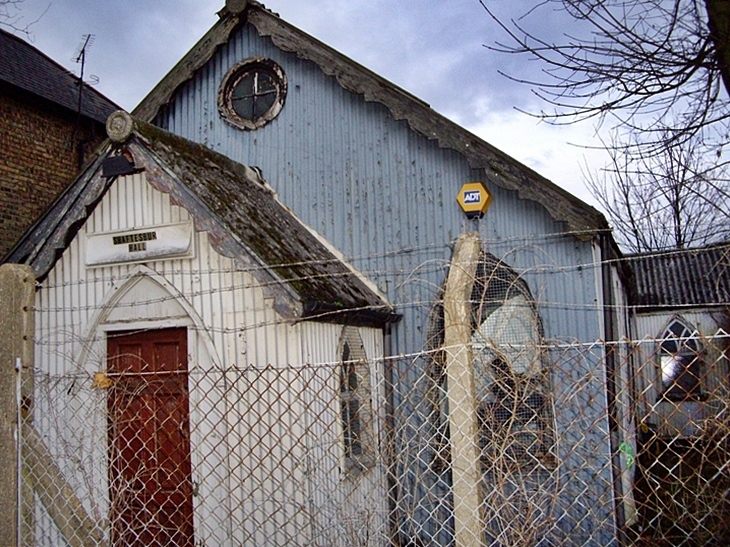 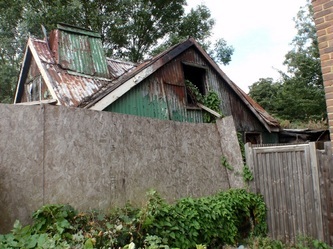 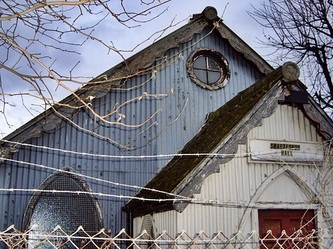 Richard Turner writes: "Your picture of a Tin Tabernacle reminds me. I was a pupil at Latymer School Edmonton. The sports equipment and changing room was in the 'Tin Tab' a large hall built of corrugated iron looking very much like your picture of one in Ponders End." 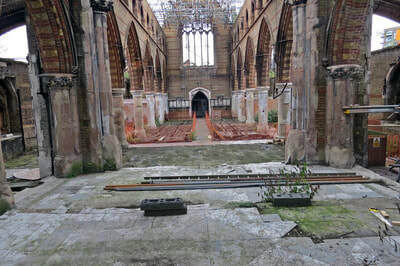 Standing between the Baths and the Ice Rink is a grade II listed church, which will be retained in any future development. 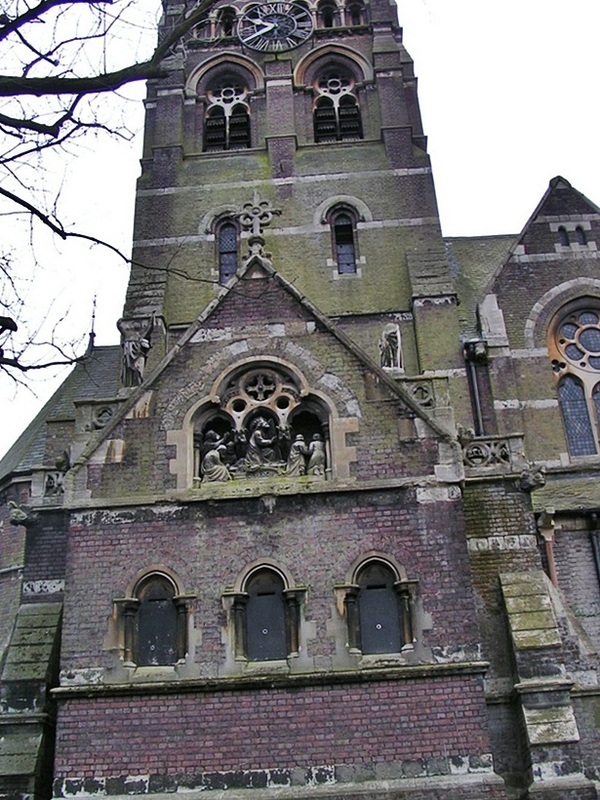 It was consecrated in 1901 as the Congregational Church and became the United Reformed Church in 1972. 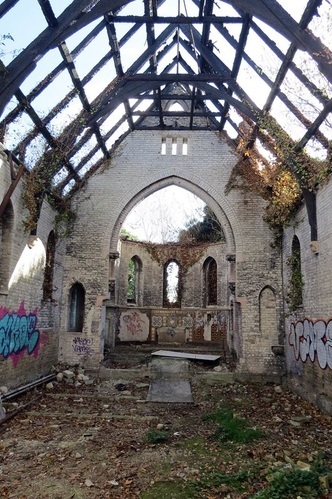 Adjoining the church is this derelict church hall built in 1911. 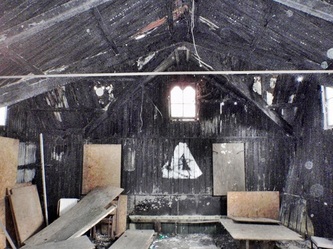 During the 1980's the hall was used as a venue for jumble sales and antique markets but was closed down and lay derelict. 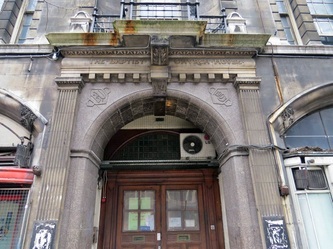 This hall has been demolished (2012) as part of a "regeneration scheme"
Built in 1837. 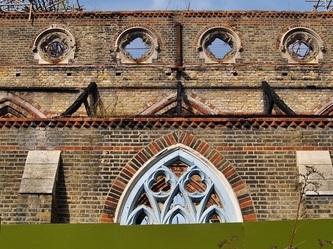 To quote a local estate agent's blurb : "This ranks alongside Highgate as a bizarre and beautiful insight into the Victorian age. 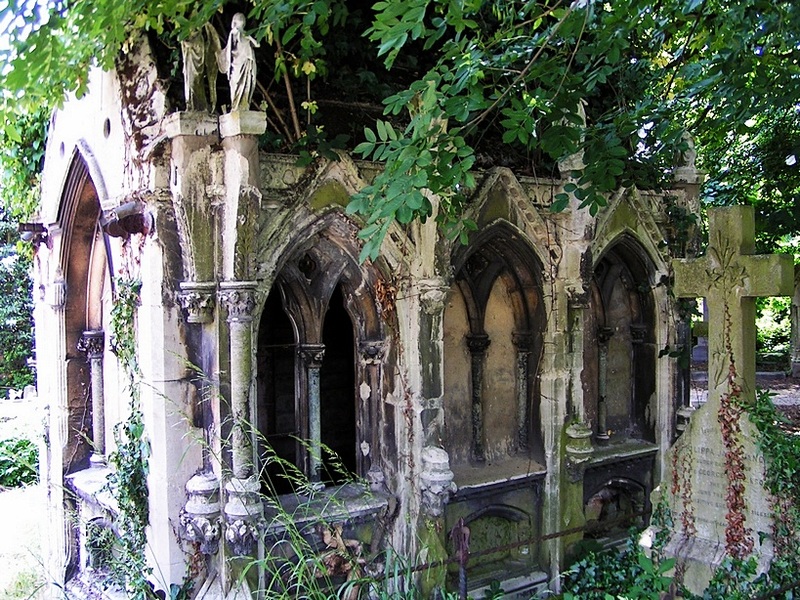 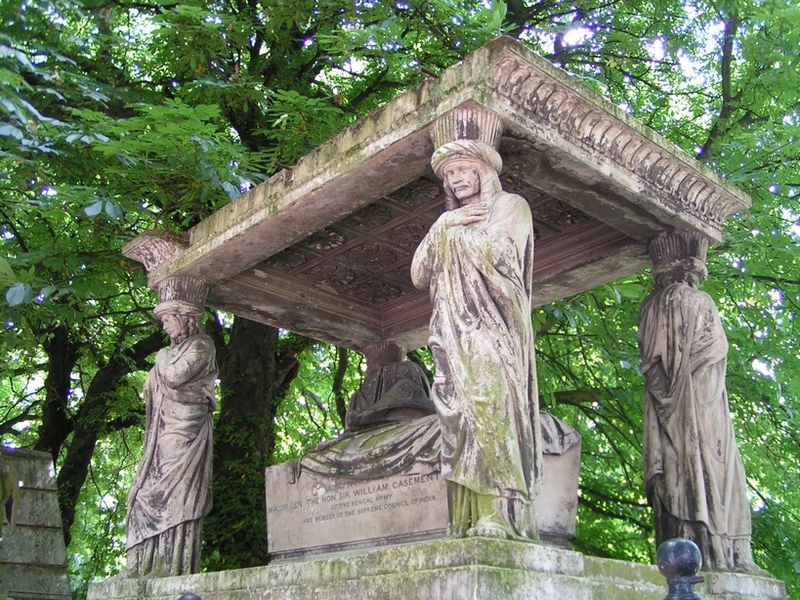 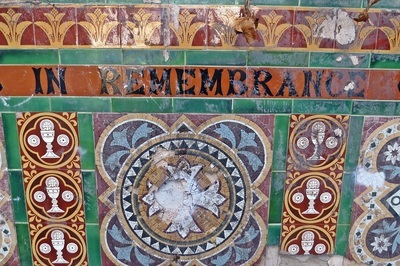 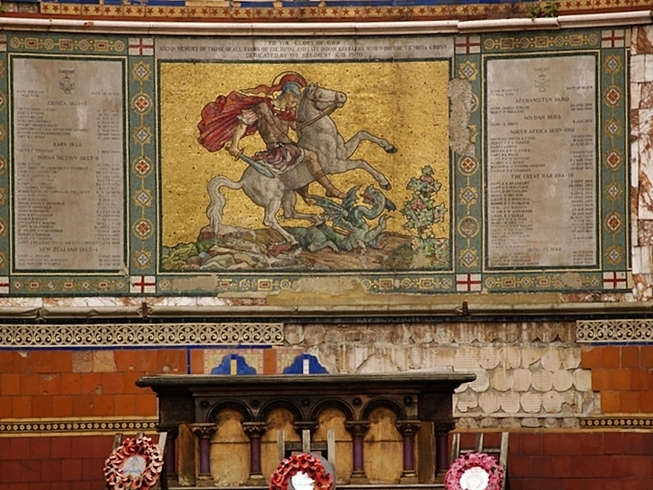 Its catacombs and monuments, including memorials to many famous names, are one of London's hidden treasures. " 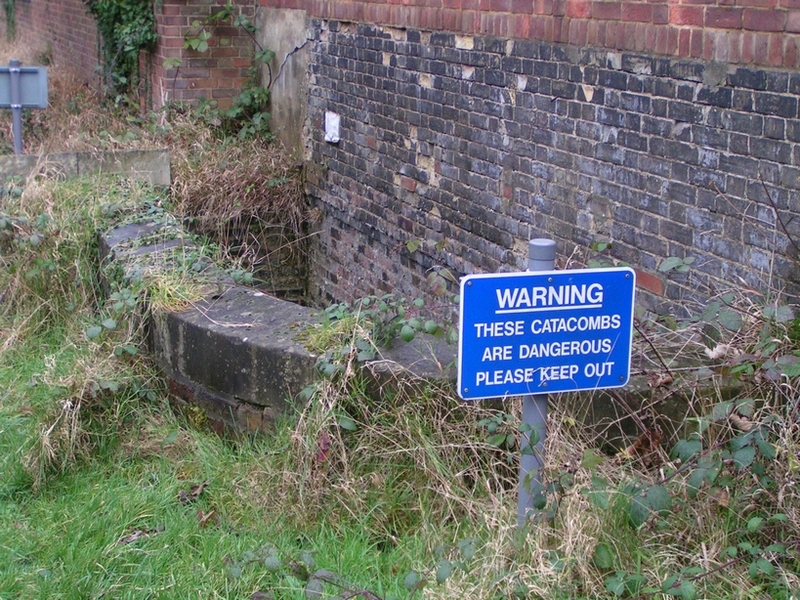 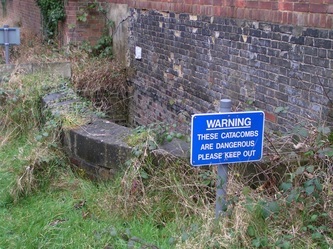 The Catacombs are in poor condition from bomb damage, neglect, and vandalism. 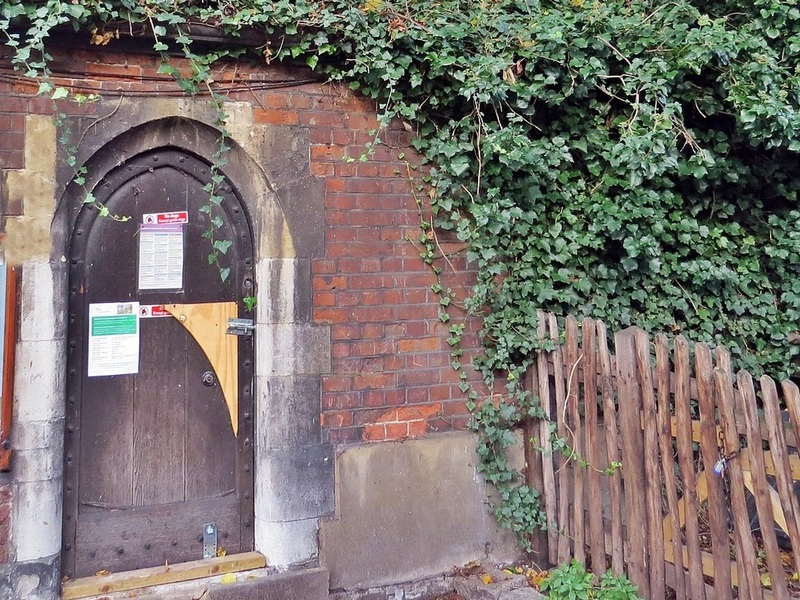 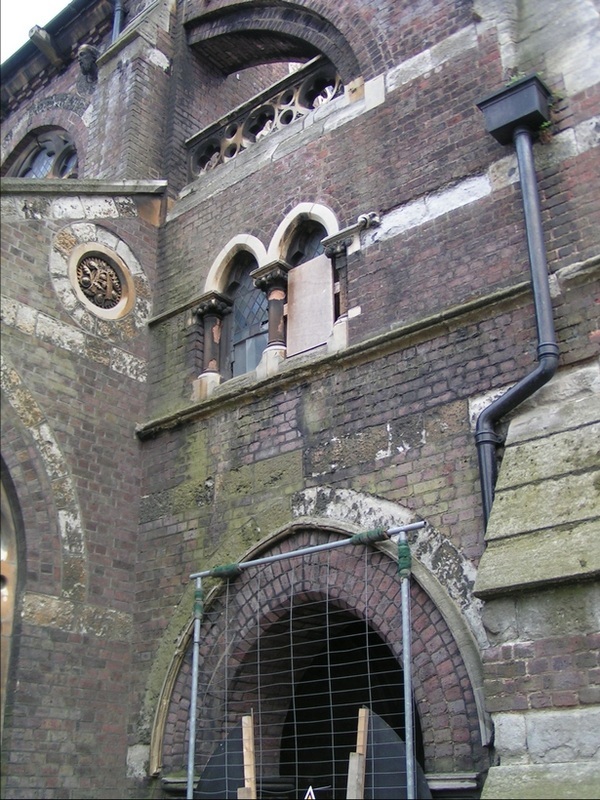 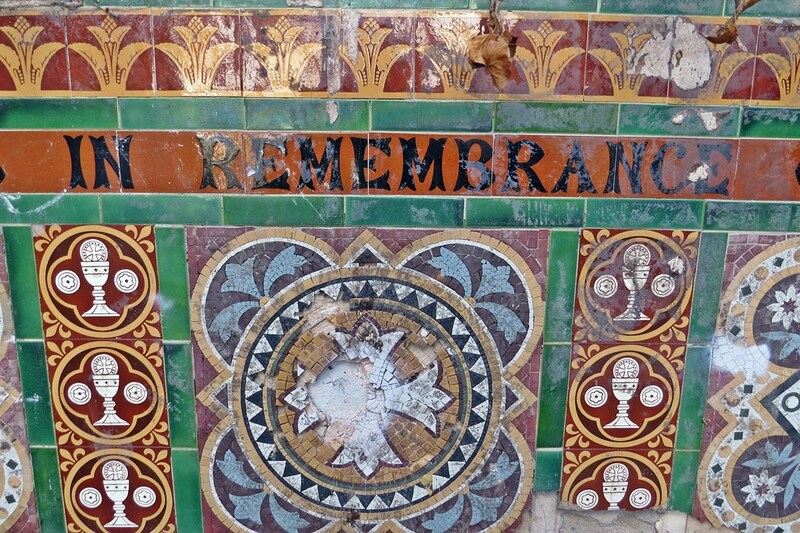 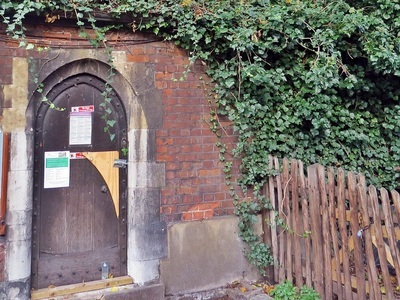 Following intervention by the Diocese of Southwark and English Heritage, a conservation management strategy has been adopted for the repair and restoration of catacombs. 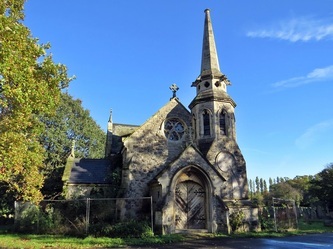 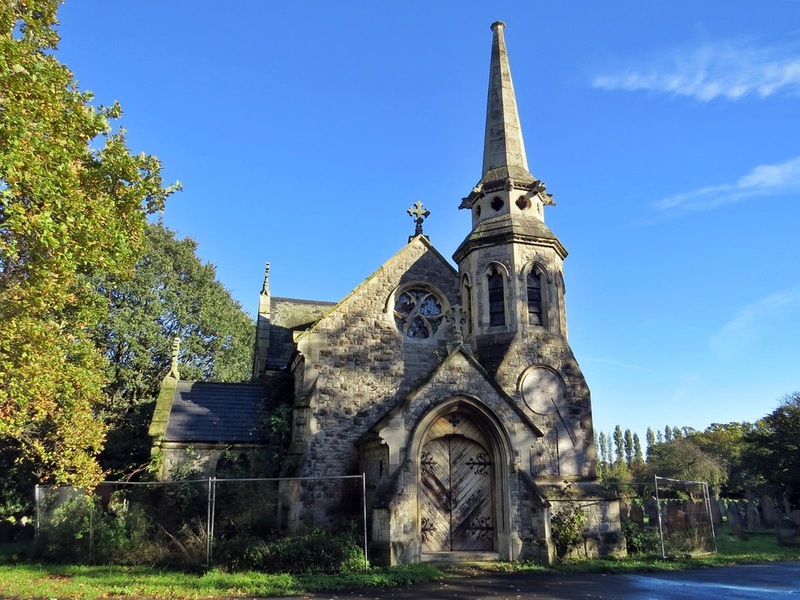 Opened 1880, the Isleworth Cemetery is 9 acres in size and has a large derelict twin Chapel placed in the centre of the cemetery. 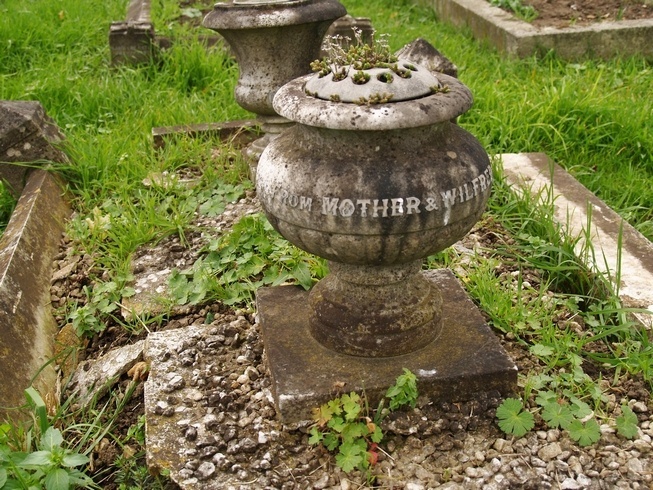 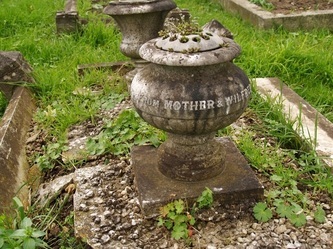 Notable amongst its memorials is the large fairly ornate structure to the Pears family, one of whom lost his life on the Titanic. 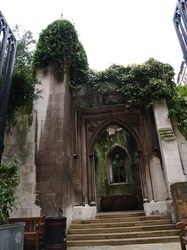 I go past here quite alot and must get round to taking some more pictures soon. 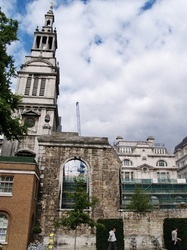 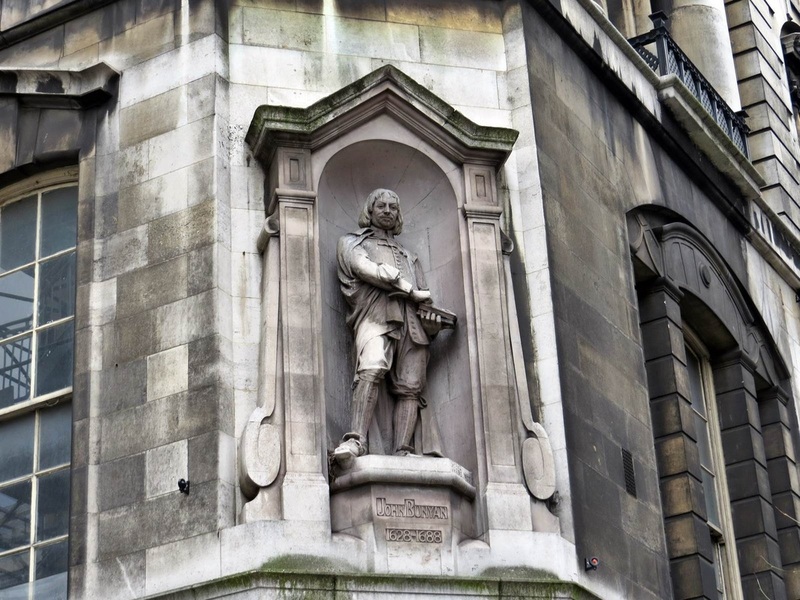 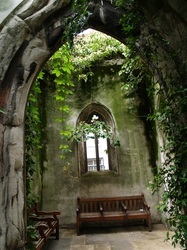 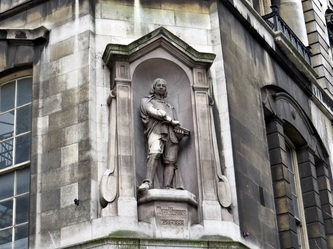 Also known as Christ Church Newgate, was an Anglican church opposite St Paul's Cathedral in the City of London. Built first in the gothic style before being destroyed in the Great Fire in 1666 then rebuilt in the English Baroque style by Sir Christopher Wren, it ranked among the City's most notable pieces of architecture and places of worship The church was destroyed in the Second World War—a total of eight Wren churches burned that night. 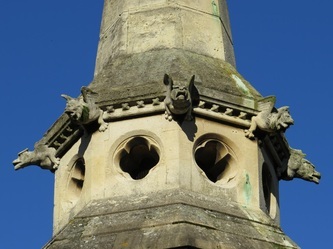 At Christ Church, the only fitting known to have been saved was the cover of the finely carved wooden font, recovered by an unknown postman who ran inside as the flames raged. 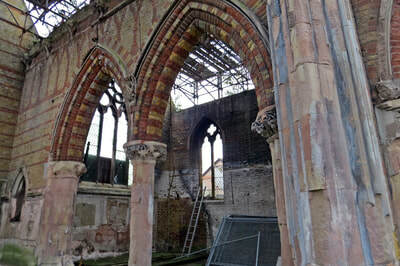 The roof and vaulting collapsed into the nave; the tower and four main walls, made of stone, remained standing but were smoke-scarred and gravely weakened. 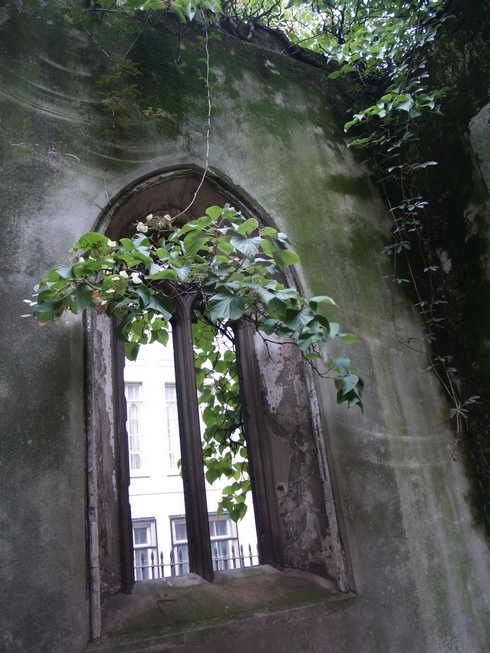 The ruins are now a public garden. 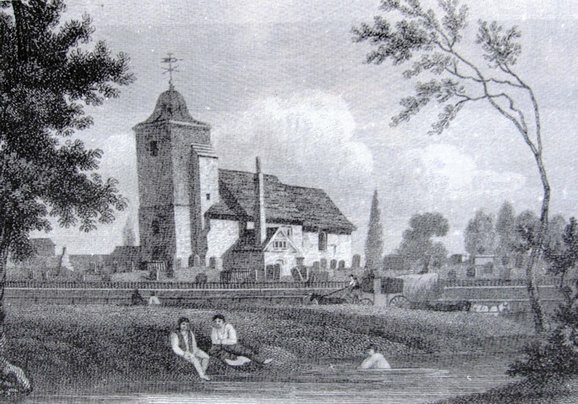 The churchyard of St Nicholas (the patron saint of sailors) was Chiswick's only burial ground for many centuries. 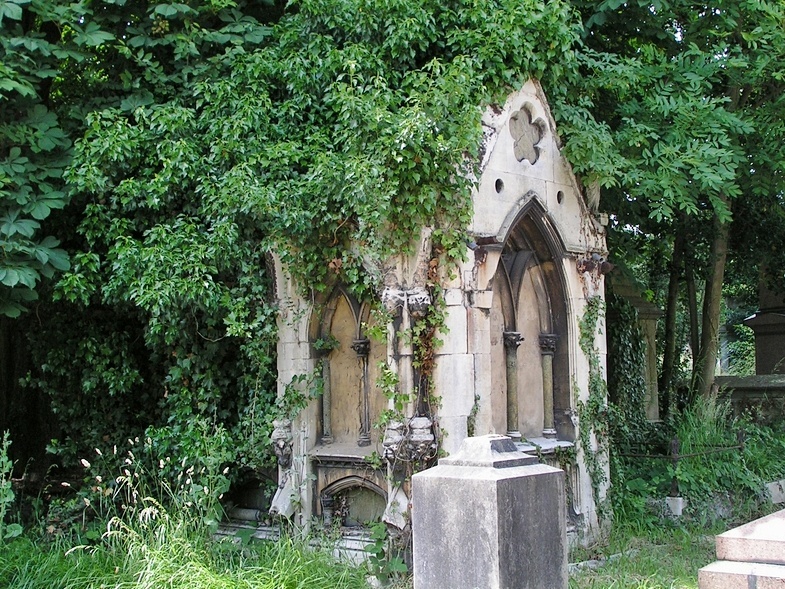 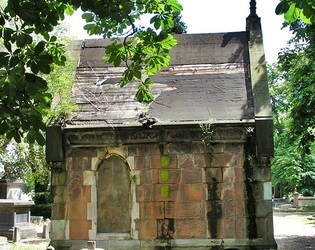 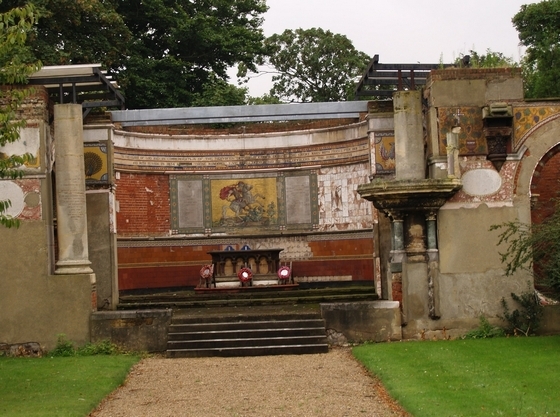 It was extended in 1838 by a gift of land from the Duke of Devonshire but closed in 1854 when for some years Chiswick residents were interred in the large cemetery near Woking run by the London Necropolis Company. 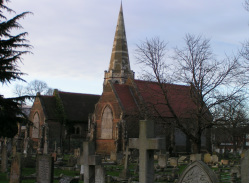 However, it re-opened as a graveyard after the Duke of Devonshire gave the parish another acre adjoining the churchyard in 1871. 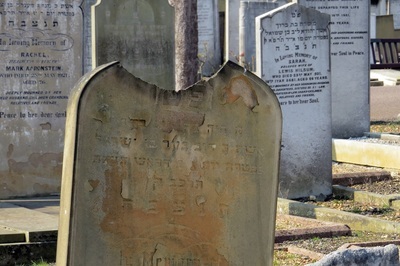 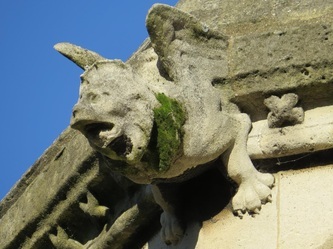 These days there seems to be some subsidence and some of the headstones in poor condition. 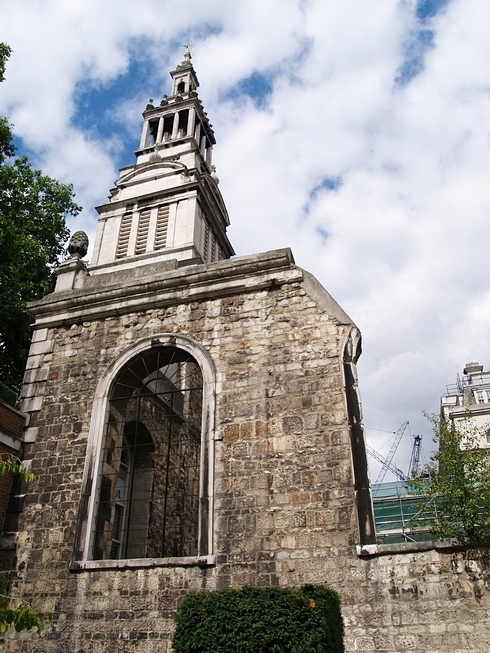 This Anglican church situated near the Tower of London dates back to 1382 and was partially destroyed by the Great Fire of London in 1666. It was then rebuilt by Christopher Wren in 1668, but reduced to a shell by German bombs during the Blitz in 1941. 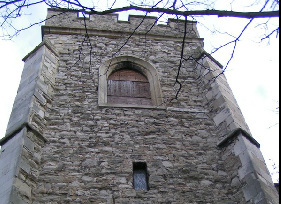 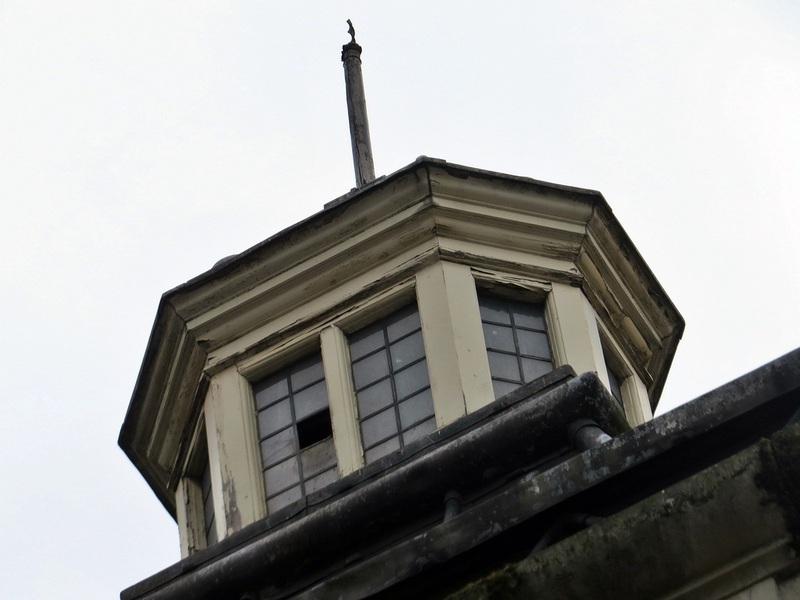 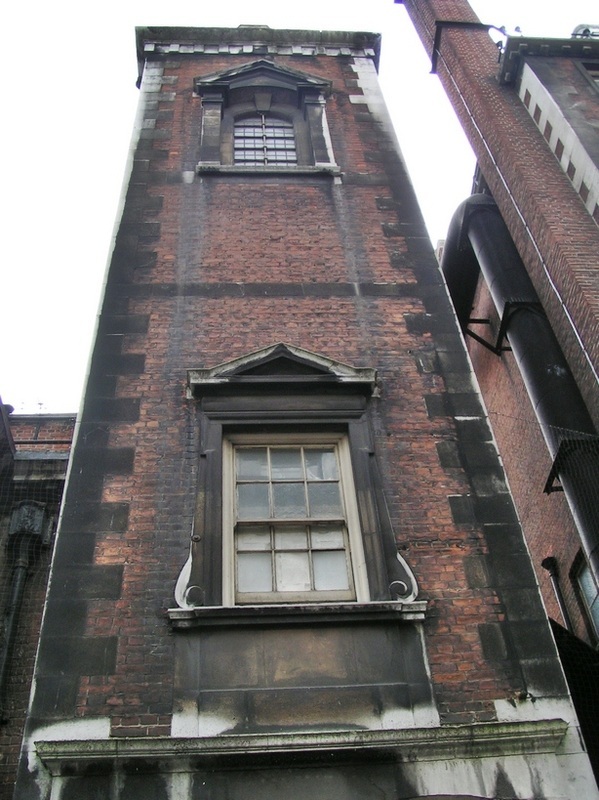 Wren’s tower and steeple survived, however, and now house the offices of a small health clinic. 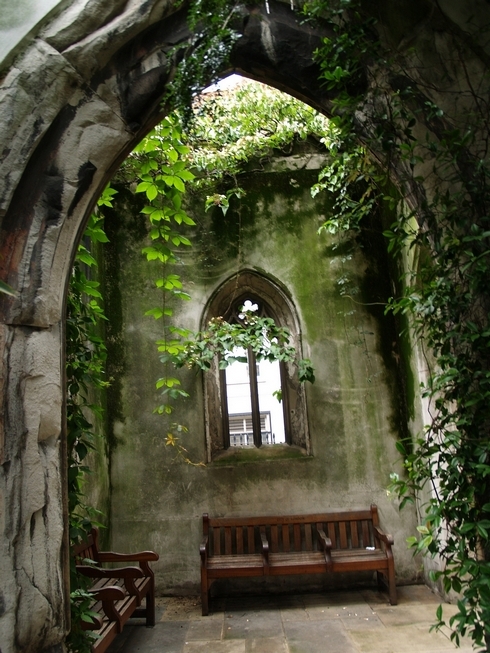 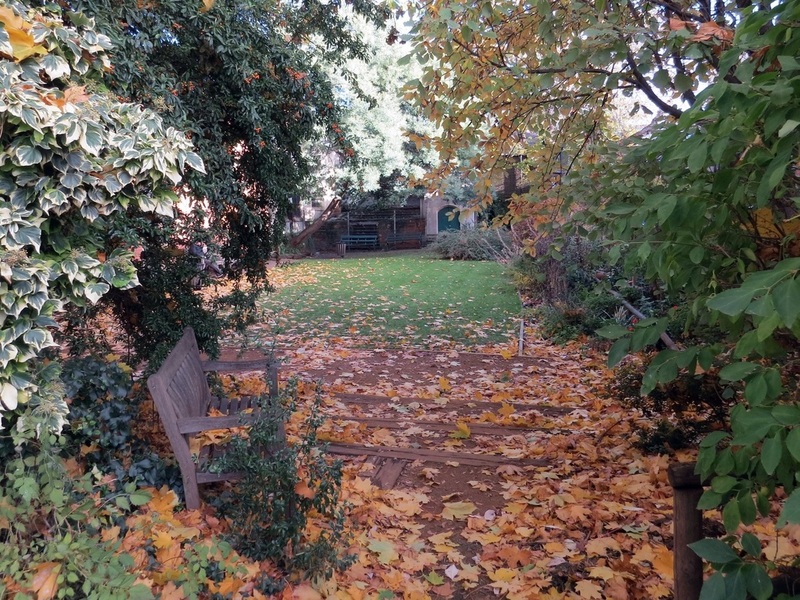 There is now a beautiful walled garden within the ruins of the old church, providing a haven of tranquillity in the heart of the City of London. Built in 1800 and then known as the "Church of Protestant Dissenters". Due to increasing congregation sizes the church moved to new premises and the Old Chapel was sold to the Plymouth Brethren in 1911 for £400 who used the building for services until 1988.An application has been made to the Heritage Lottery Fund for money to turn the building into a community resource/exhibition space/performance venue. St Pancras Old Church is believed to be one of the oldest sites of Christian worship in England, and is dedicated to the Roman martyr Saint Pancras, In the mid-19th century the writer Thomas Hardy, then a trainee architect, was involved in the controversial clearance of part of the churchyard to make way for the railway. 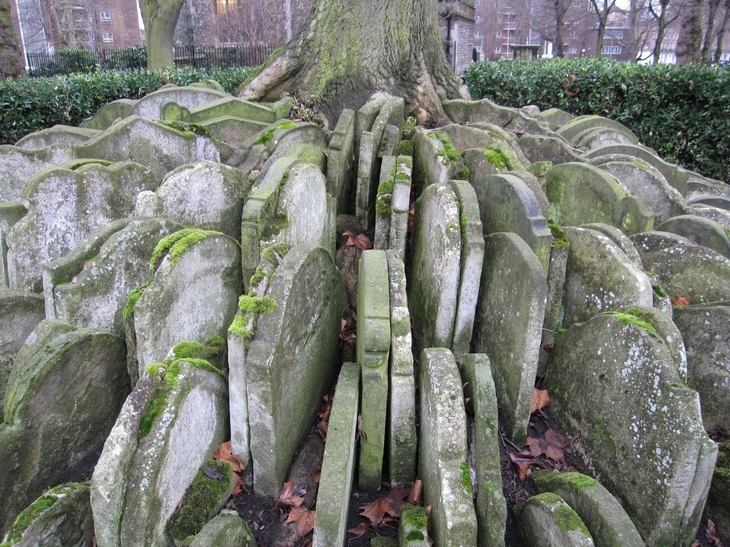 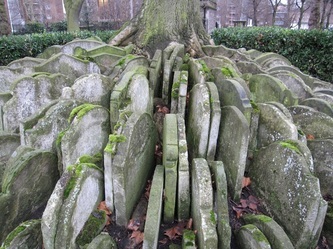 Hardy assembled many gravestones around a tree and this is still all there now. 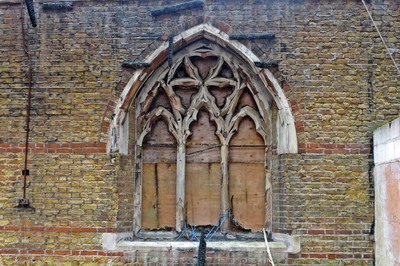 It was affected again, some 140 years later, by the St Pancras Channel Tunnel scheme. 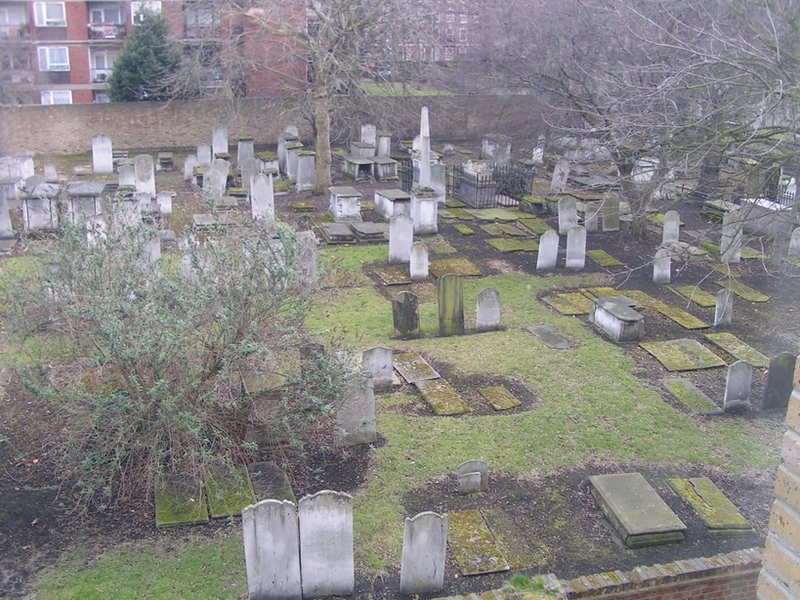 Charles Dickens mentions it by name in A Tale of Two Cities, making it the location of body-snatching to provide corpses for dissection at medical schools, a common practice at the time. 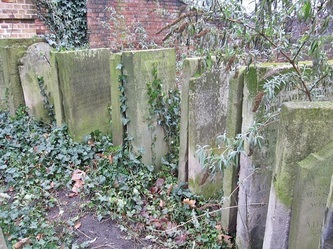 In 1968, The Beatles were photographed in the churchyard grounds, in a series of pictures designed to promote the single "Hey Jude"
Jewish burial ground opened in 1761. 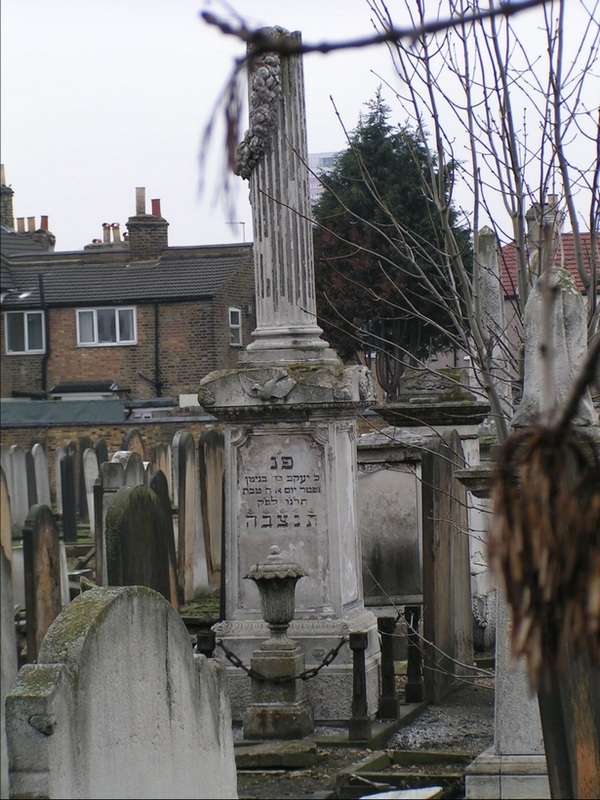 Nathan Meyer Rothschild, founder of the Rothschild corporation is buried here. 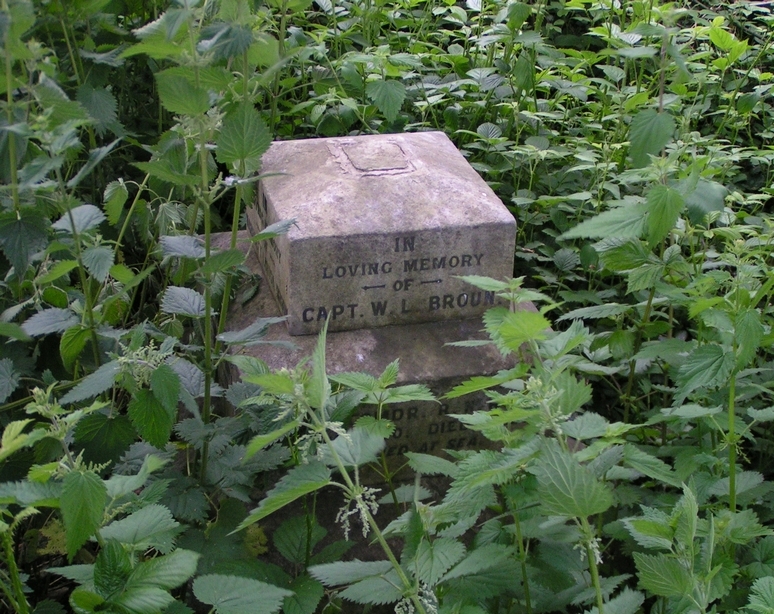 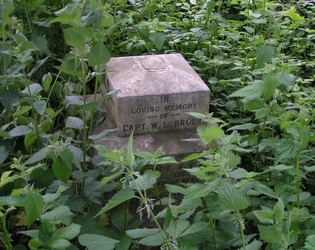 By 1840 little space was left here and to extend the number of graves available it was decided to put a four foot layer of earth on top of the centre ground and bury on top.This has resulted in a large flat-topped mound in the centre with headstones back to back - the one stone for the grave below and the one for the one above. 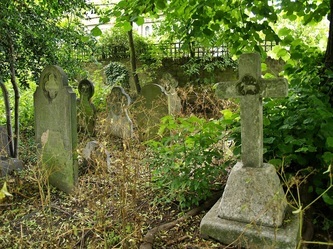 The cemetery closed in 1858 except for reserved graves. Its all walled off and strictly closed to the public though you can get a view if you (discreetly) enter the surrounding blocks of flats. 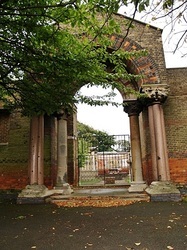 Tottenham Park Cemetery is a small private burial ground dating from 1912 - the cemetery was originally only for very poor people. - its still a very much used cemetery though I found this derelict little chapel within the grounds. 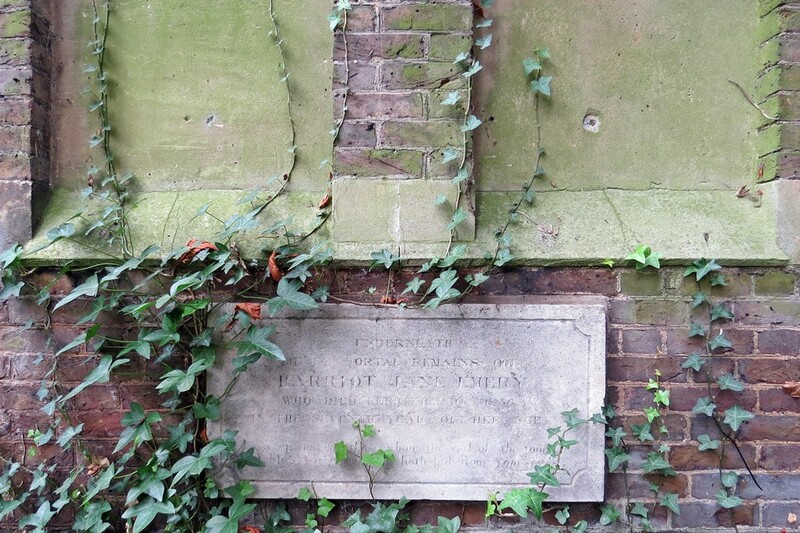 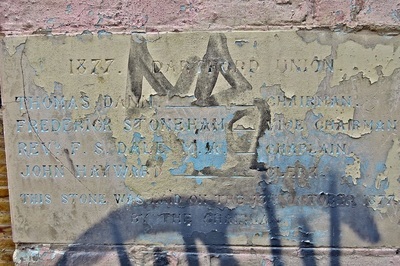 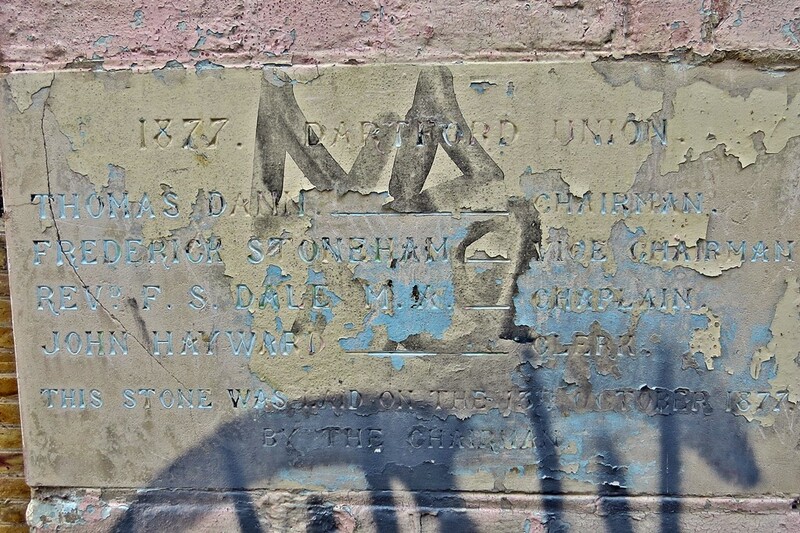 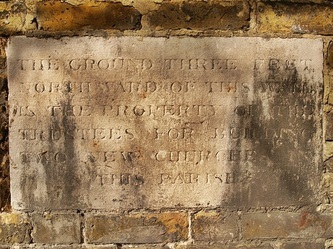 The foundation stone OF Saint Peter’s Churchwas was laid in1823 by the Archbishop of Canterbury. 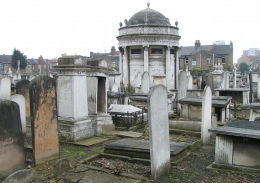 The architect was Sir John Soane, who was famous as the designer of the Bank of England. 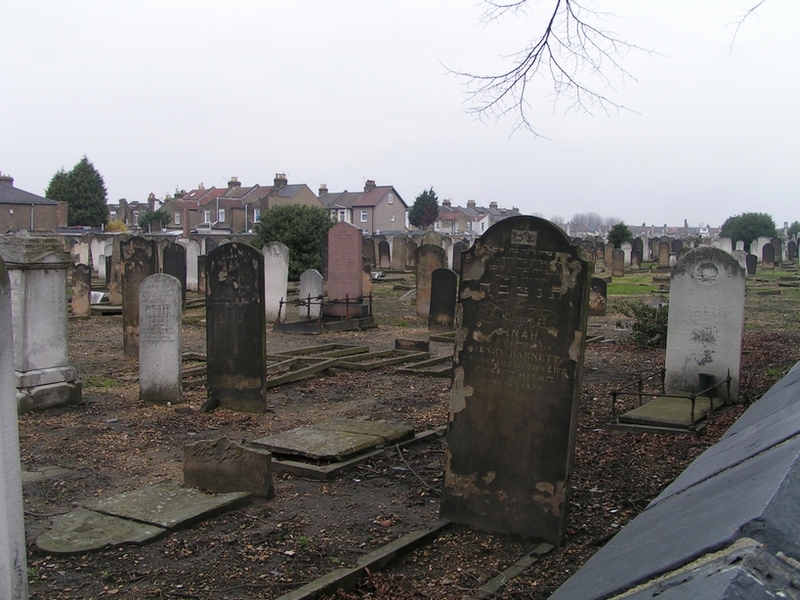 By the end of the nineteenth century most people who lived in the area were poor people, living in slums. 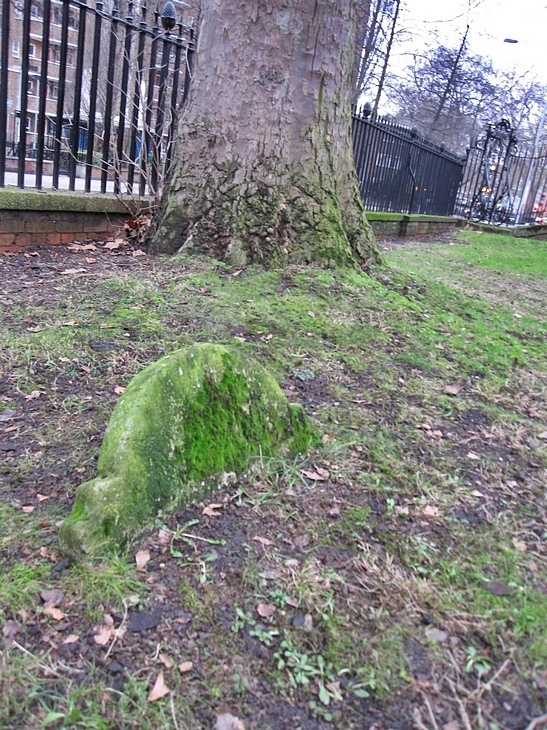 The parish priest here then, cleared many of the gravestones from the churchyard, and make it into a small park. 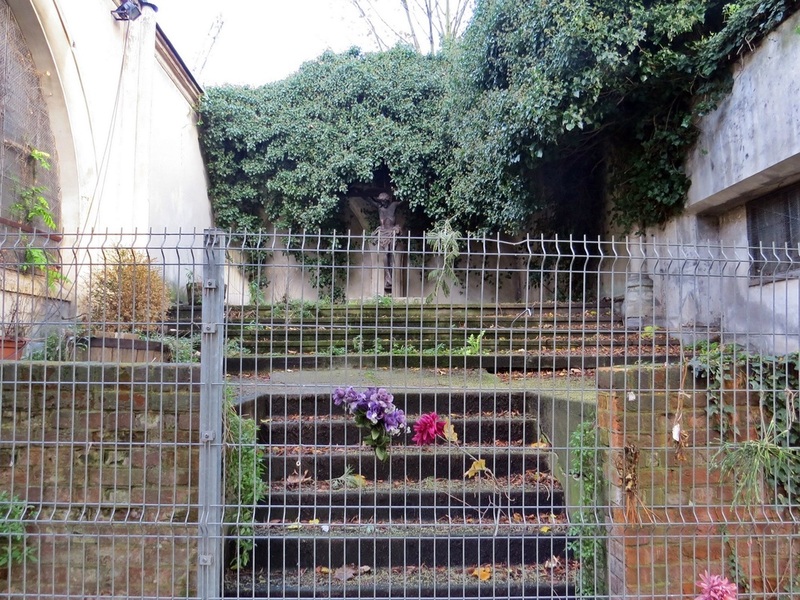 He even set up a small zoo - people called it the ‘Monkey Park’. During the Second World War people used the crypt to shelter from the bombs at night. 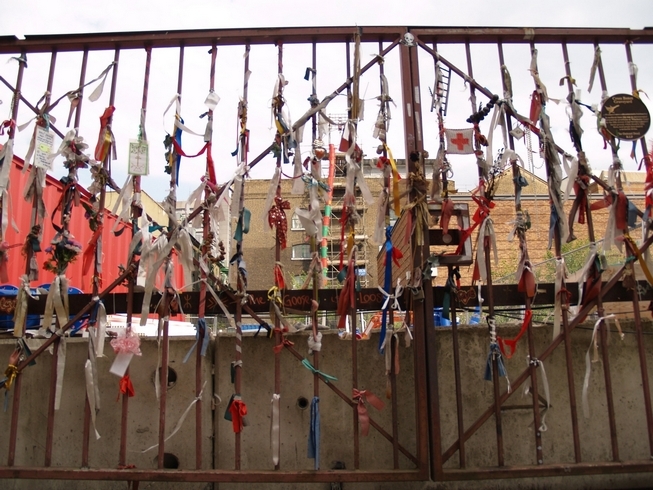 One night in 1940 three bombs fell on Walworth. 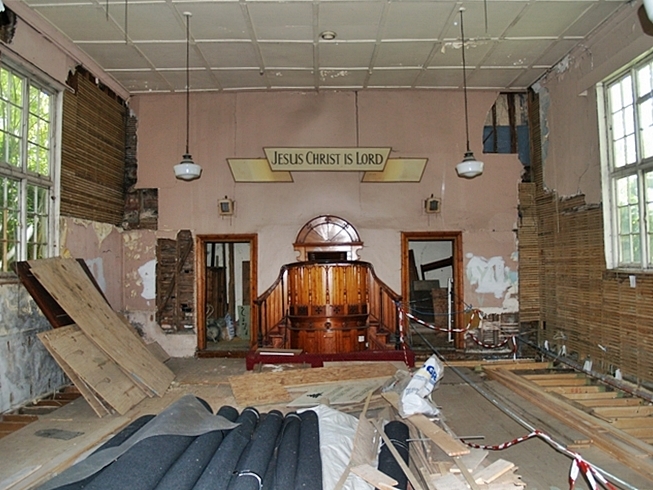 Two hit the church, went through the roof, and then through the floor. 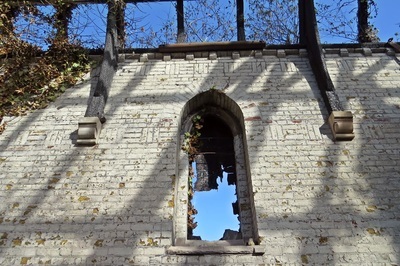 One exploded in the crypt where people were sleeping. 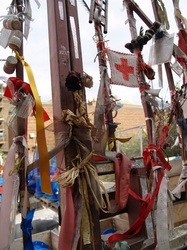 At least sixty-five people died, and many were injured. 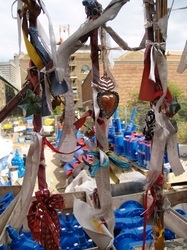 The other bomb did not explode. 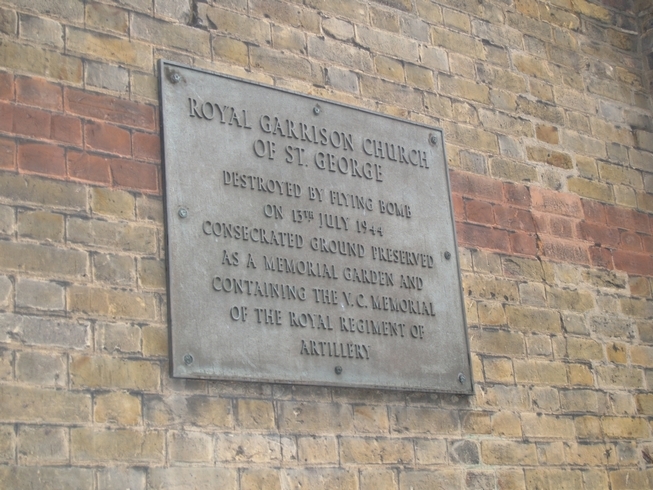 There is a memorial to those who lost their lives in the air raid, hanging in the church. 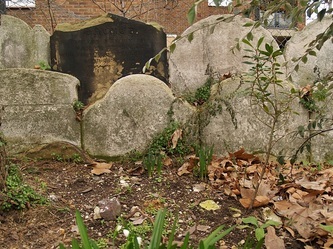 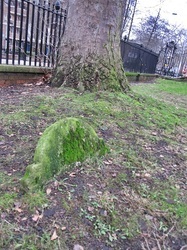 The churchyard, once known for its monkeys has now been transformed into a garden complete with a few headstones. By Clicking on the Amazon link Derelict London receives a small % of anything that you spend! so click on it and save as a favourite. Cheers! 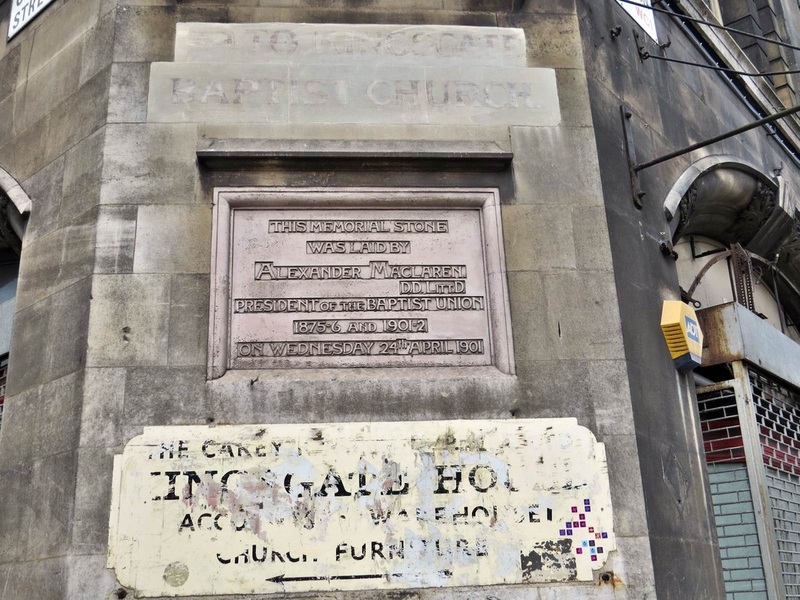 There has been a Baptist church on this site going back to 1736, and known by the name of Eagle Street Chapel until 1856,when the present building was erected on the same spot and renamed Kingsgate Baptist Chapel. 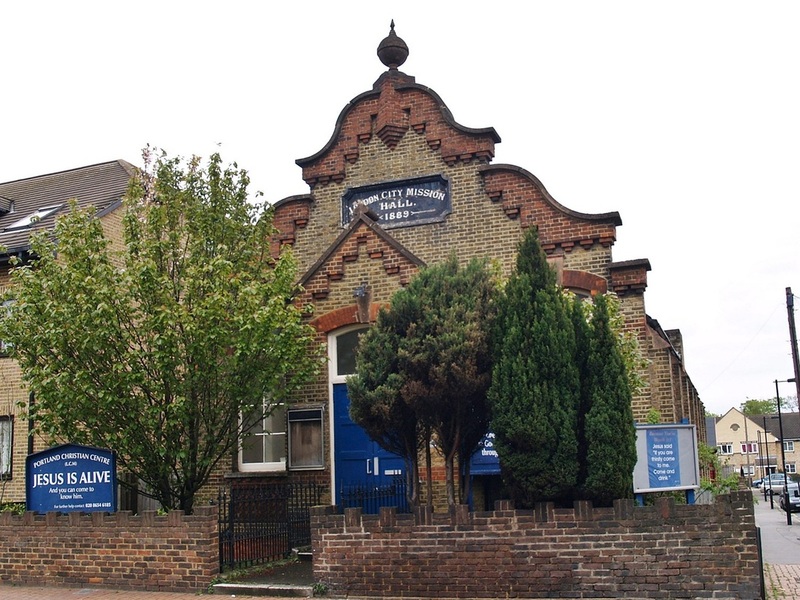 Headquarters (including office, shop, and library) for the entire Baptist Union called Baptist Church House was attached to the existing Chapel building in 1901 and designed by Arthur Keen. 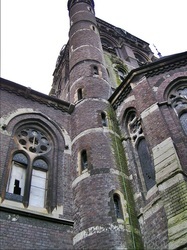 The buildings were damaged in the Second World War but repaired and subsequently Grade II listed. The Baptists left in 1996 and the buildings then briefly used as a homeless shelter. 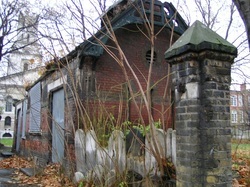 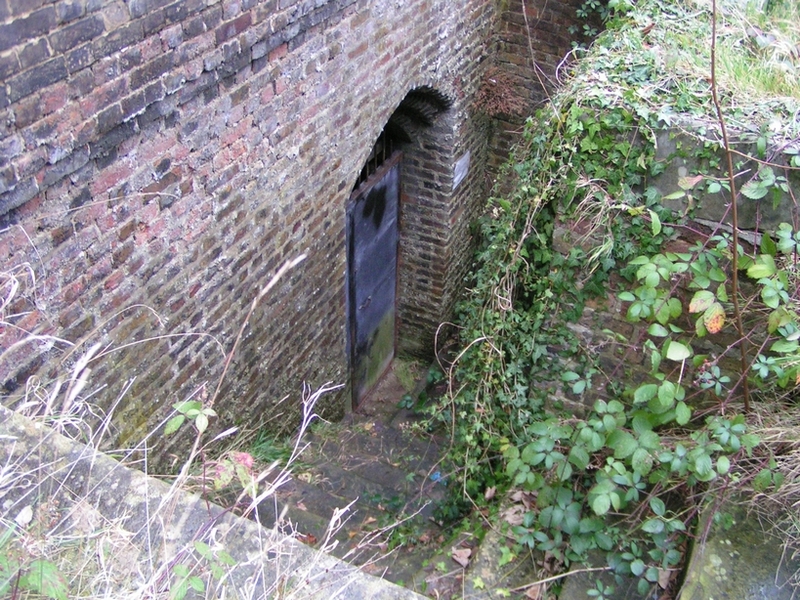 After a period of dereliction it is now inhabited by property guardians. 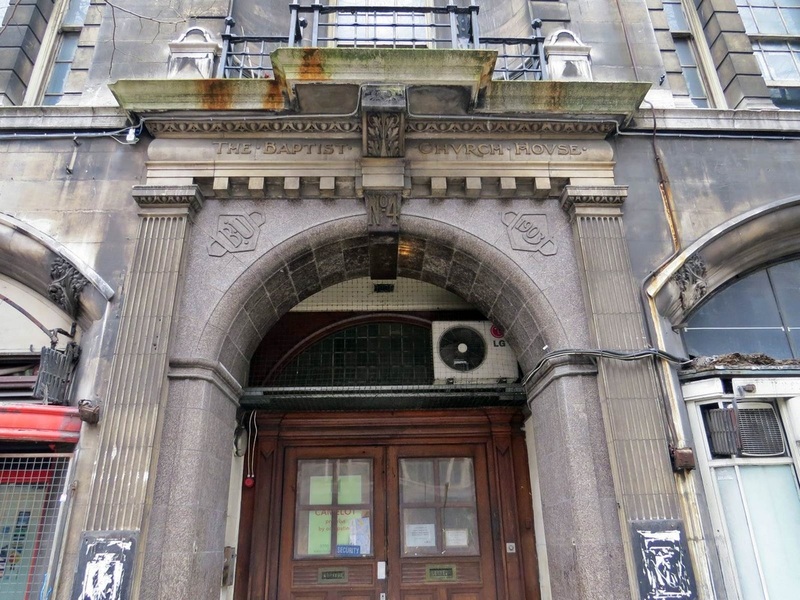 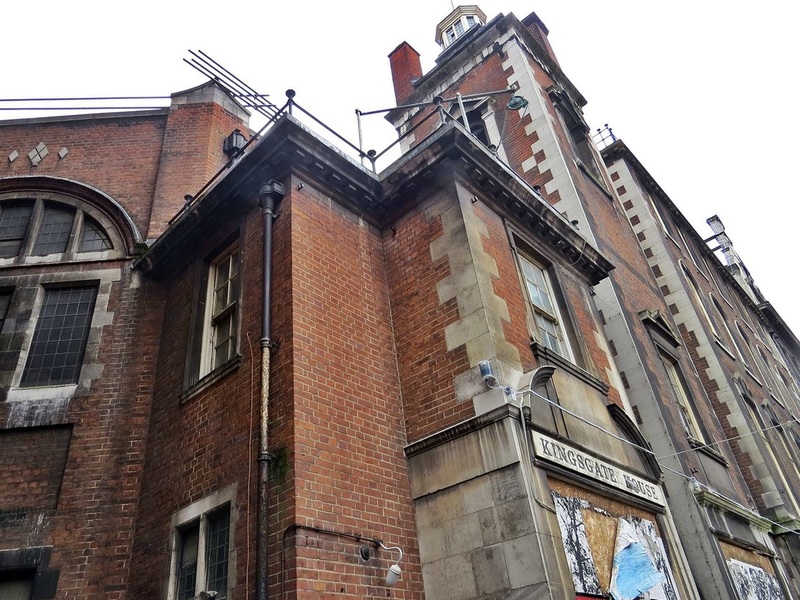 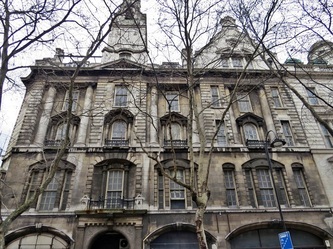 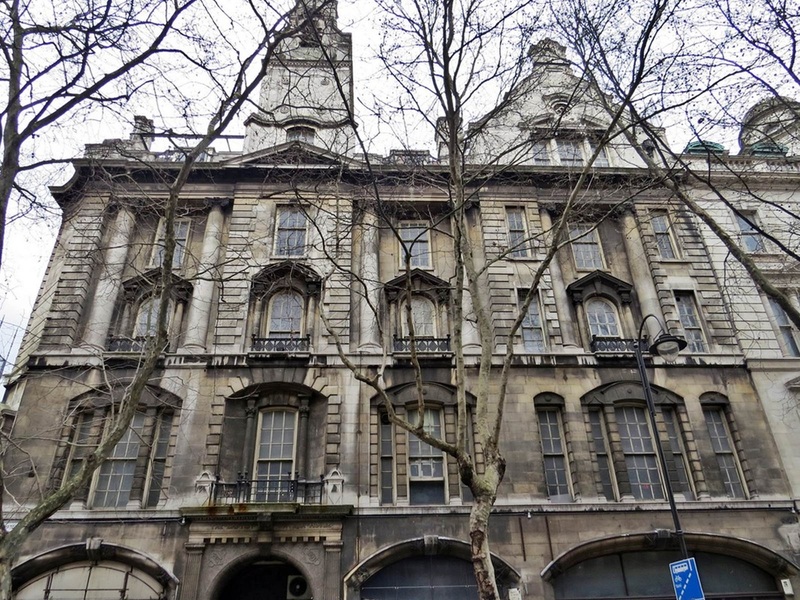 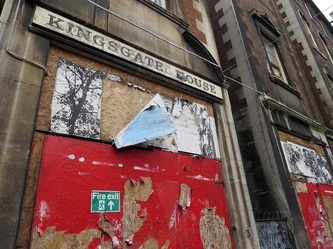 The buildings have been sold to an overseas investor and there have been plans to convert the buildings into a hotel. 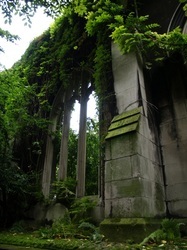 In the grounds of this still functioning church built in 1845 are a few overgrown stones.